What a beautiful and tasty morning we had today! Thanks to Kelly and Kat for bringing their passion to bake. 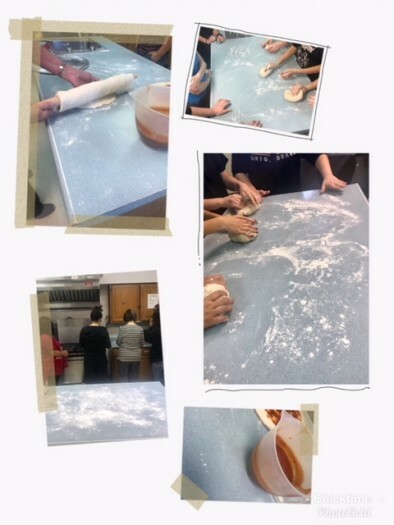 The girls didn’t hesitate at all to roll up their sleeves, flour up, mix, knead and spread to make cinnamon rolls from scratch. As they patiently waited first for the yeast to rise, and then for the rolls to bake, they shared laughs as they acted out while playing ‘heads up’. 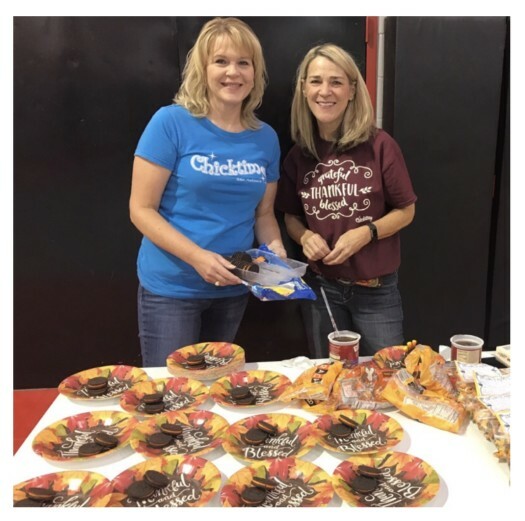 It warmed our ♥️ when the girls asked to pray before savoring their creation, and when they all asked for Chicktime shirts which they promise to wear on Chicktime Saturdays. We always leave with our spiritual tanks fuller, our hearts overflowing and today our tummies full and happy with an extra helping of cinnamon and sugar! Wow! Wow! Wow! Our January 2019 workshop leader, (Author and Motivational Speaker), Lora Williams, brought down the house at Boysville today! Lora through skits and open discussion and reflection exercises had us breaking chains that we hold onto and learning to claim who God says we are! The girls learned that forgiveness is for us not the person who hurt us! Powerful! They also learned that there is NO experience in our life that decreases our value and that for every negative word that was ever told to us we can turn it around make it a positive one. Our mirror isn’t broken ladies…it just needs to be cleaned off! We are beautiful and worth it! She had us listen to ~Who You Are: A Message to All Women…Double Powerful! Click the link! Not once but twice! Listen to it three times!! Hear the message and plant it on your heart! We closed in a circle prayer and had snacks and fellowship. 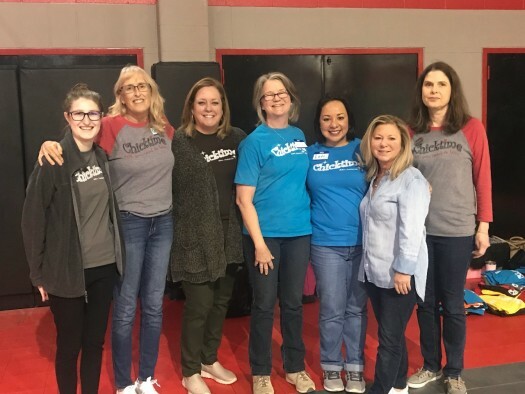 Praising God that Chicktime San Antonio continues to make a difference in 2019! 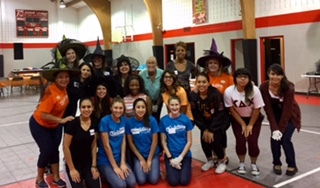 Chicktime San Antonio celebrated Halloween 👻 with the beautiful teen girls at Boysville! 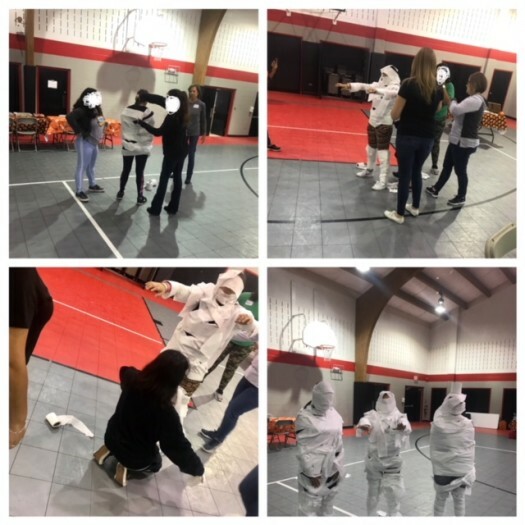 We divided the girls into three teams with the challenge of each team creating a Mummy out of toilet paper but also being creative and having a theme to their mummy. After a set time each team presented their mummy to the judges and pled their case why their Mummy should win the contest! The girls were pretty creative and competitive! Next we played Halloween 🎃 Pictionary! Wow! The girls could really draw! What a fun game engaging the girls in drawing, guessing, and laughing! 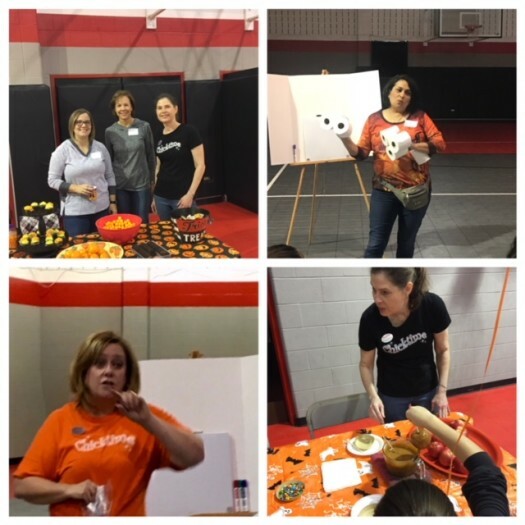 We had Halloween orange themed snacks like Cheeto puffs, cuties, Oreos with orange filling, cupcakes with Halloween icing and sprinkles and Orange Drink! 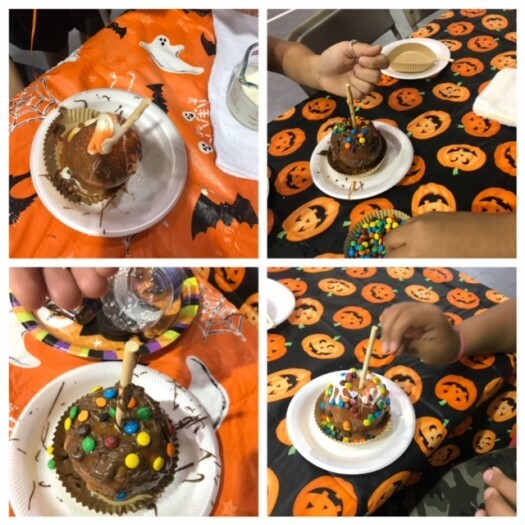 Then in addition to our snack time, we made our own Carmel apples 🍎! 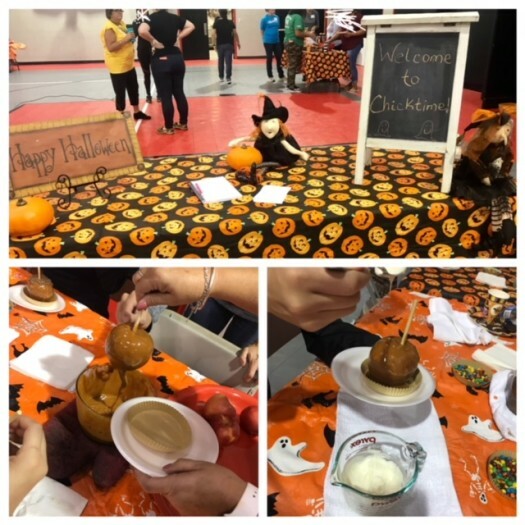 Then in addition to our snack time, we made our own Carmel apples 🍎! We closed our time together how we end every Chicktime Saturday morning- in a circle prayer! 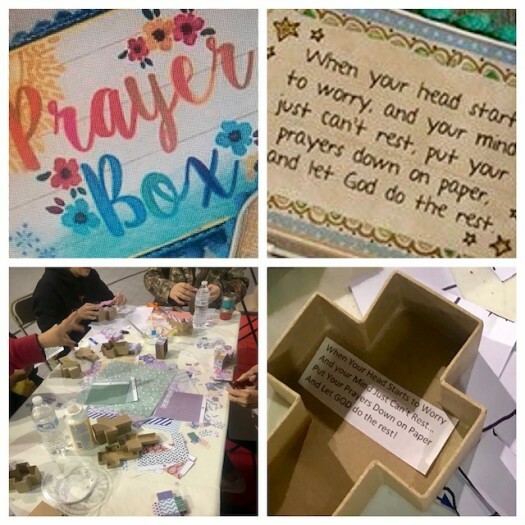 It’s a beautiful thing to be reminded we haven’t prayed yet by the girls when our Chicktime workshop is winding down or to have them fight to hold your hand in our prayer circle! It almost takes your breath away! The closest to Christ moment at this workshop was two of the “new” girls telling us they were new to Boysville , but not new to Chicktime! They attended Chicktime workshops at another local children’s home they were placed so knew what “the Chicktime Ladies” were all about! So keep praying! Our goal of having a Chicktime Chapter in every group home or shelter across the United States should never be forgotten or sought after! 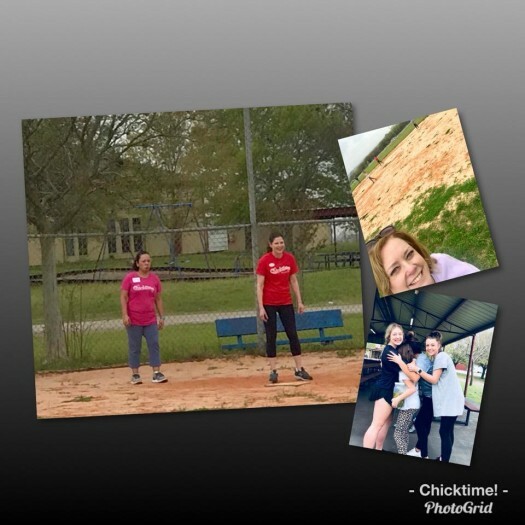 When an abused or hurt child needs love and refuge by ladies that show up in Chicktime Shirts every month and simply play a game or have some Cheetos with them… we are making a difference and we are Kingdom Building here on earth! 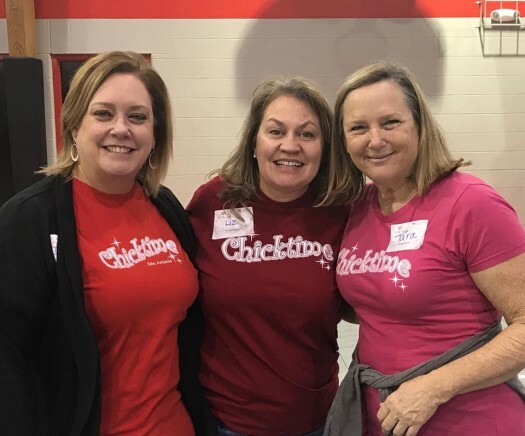 If anyone would like to know more about starting your own Chicktime Chapter… we would love to tell you how… and as always you are welcome to join our Chapter the 3rd Saturday of every month! Sadly our September workshop was canceled due to severe weather. It would of been difficult for volunteers to get to Boysville safely and we did not want to risk it! We can’t wait to see everyone in October! 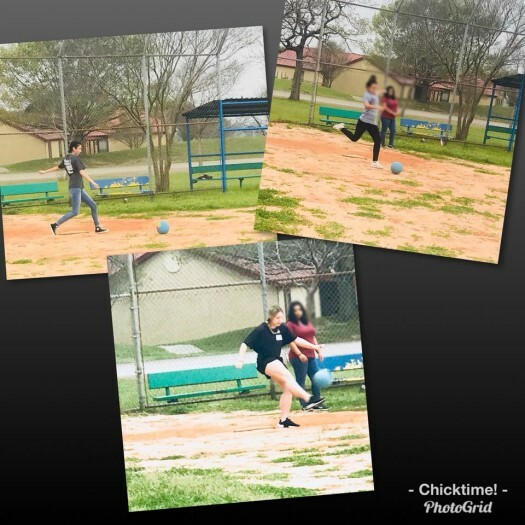 One of the most beautiful things about Chicktime San Antonio is that we are consistent women in the lives of the teen girls living at Boysville! They know us… they know they can come to our monthly workshops tired, wounded, angry, happy, or just come for the food we serve! It doesn’t matter! We want to see them and we want to be with them. We want them to know they matter to us! This morning we gathered with a smaller group than usual to play bingo! We had prizes that ranged from nail polish, bath soaps, craft supplies and snacks- to a Sonic gift card for the “Black out Bingo” winner! Even the house parents played with us! We enjoyed tortilla sandwich rolls, chips, a veggie tray and cookies together too! We ended our time together like we always do- circled up… holding hands… and praying together. These sweet girls need to know above all- God is with them and lives in their heart. It is our wish they see HIM in us! Please pray for Boysville… the staff and children! 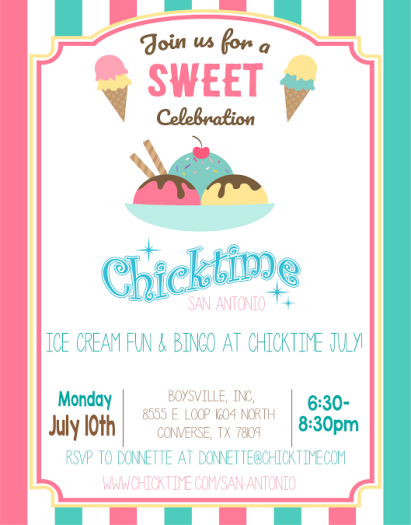 Chicktime San Antonio is playing Bingo with the teen girls at Boysville this month! 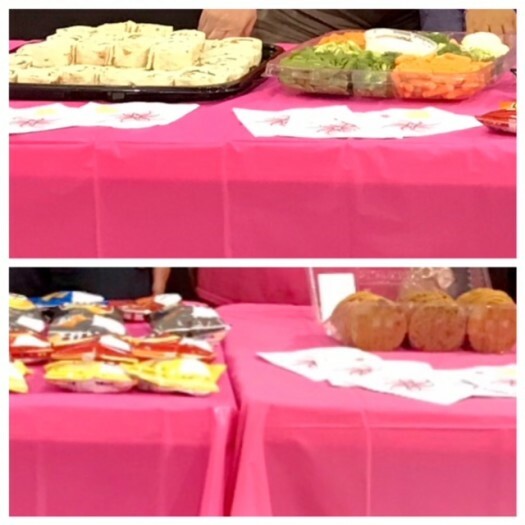 We have the prizes and lunch ….all we need is YOU! 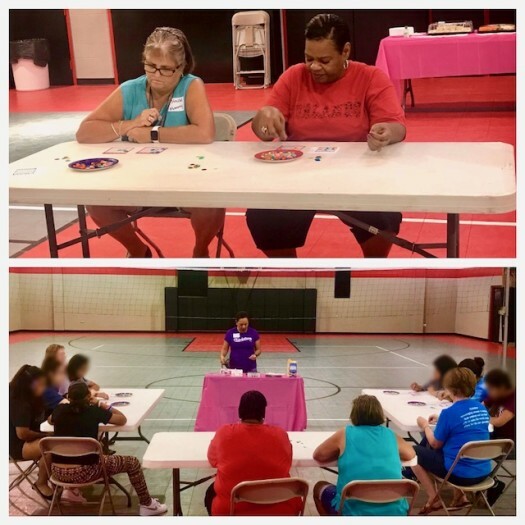 It may have been a hot summer morning, but we had a cool time playing bunco inside and eating paletas with our friends at Boysville. 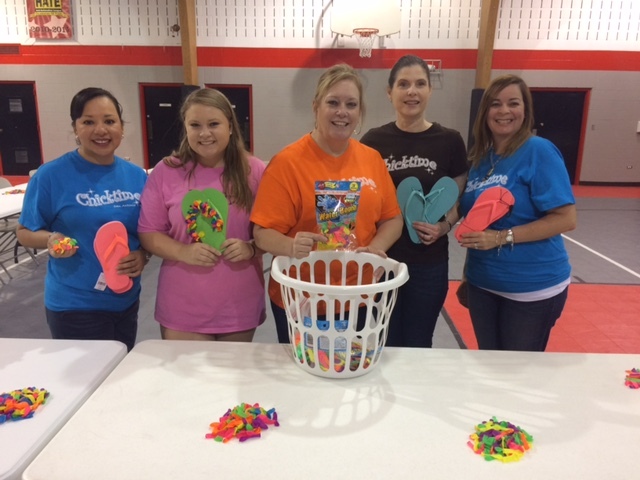 Thank you to ATKG CPA’s for sponsoring this event and providing the girls with summer goody bags with sunglasses, sunscreen, candy and Bahama Buck’s gift cards –not to mention the bunco prizes (flip flops, M&M’s and Skittles). It was s fun morning! Another beautiful day at Boysville! We were blessed to have Betty Fernandez lead our workshop. 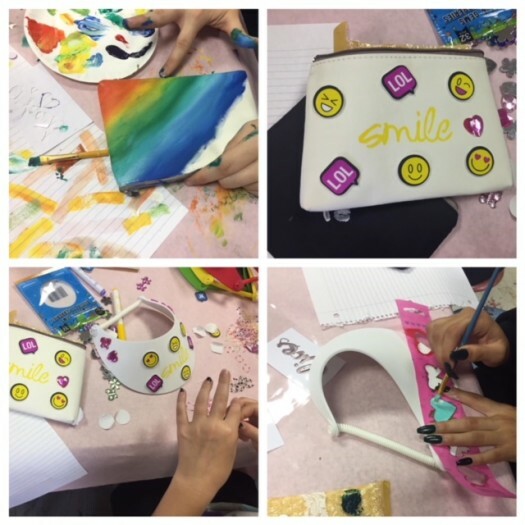 The girls had a fantastic time channeling their creativity as they painted, stenciled and embellished cosmetic bags and visors. They also braided some bracelets. It’s always fun to spend time with friends on a Saturday morning and do something fun. What are you waiting for? Join us next month! 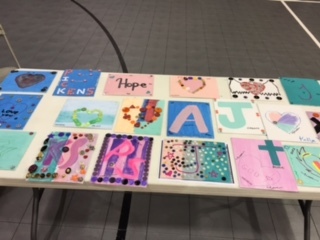 Today we gathered as we do every month at Boysville to lead an activity with the teen girls who live there. 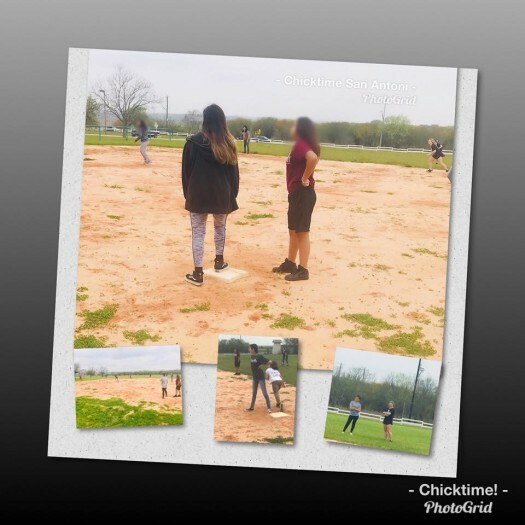 We don’t ever know what the mood or dynamics will be of the girls that come to us on a given Chicktime Saturday~ they are not only teenagers, but teenagers who for whatever reason can’t live safely in their own home. We can only imagine that they feel some sort of hopelessness and perhaps have broken hearts about what has led them to live at Boysville. 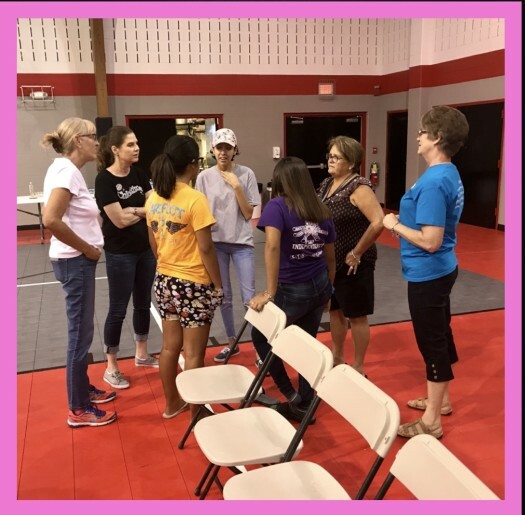 Before the girls …came to us today, we gathered in prayer with the volunteers to ask God to bless our time and help the girls see HIM in us and by the tone of the workshop HE did just that. The girls came with open hearts and smiles and were ever so engaging in our activity and conversation. 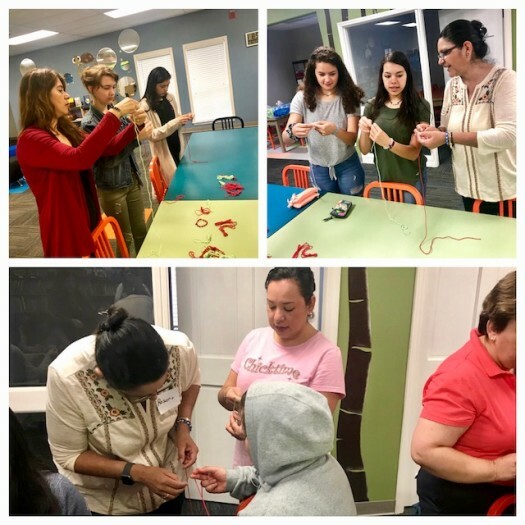 Workshop leader, Rosario Barrios, taught us how to make prayer bracelets. Learning how to make the bracelets initially takes a little bit of determination and practice, but once the girls learned how to make the special knots they were so proficient and proud! Rosario explanined to the girls that in the Catholic faith, these bracelets can be used like Rosaries to pray a specific prayer like the Hail Mary. 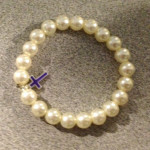 The bracelets, however, are to help all Christians be faithful to a prayer life. Wearing the bracelets help us to remember to just be still and pray. They can help us be more focused in prayer by touching each knot and praying for someone specifically or in gratitude about someone/something. The lesson was that prayer is crucial in our relationship with our Savior and brings us closer to HIM. What we can tell you about our time with these beautiful children of God is that if we don’t show and tell them about having a life of grace and abundance, who will? 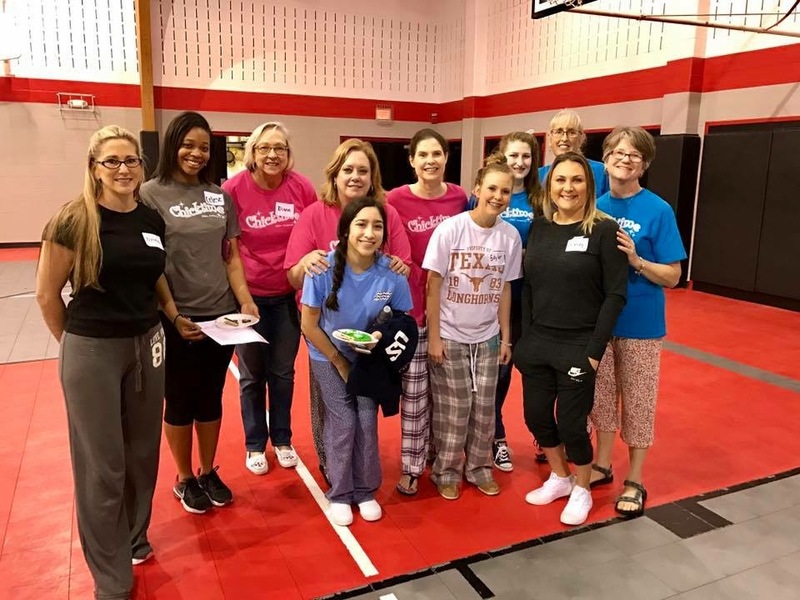 Bringing hope and healing to a child who has none is part of the mission of Chicktime San Antonio and we are so blessed to have volunteers every month who are not scared of the mission, but embrace it with us! We ended our time together with yummy food and a big group prayer. God is good! 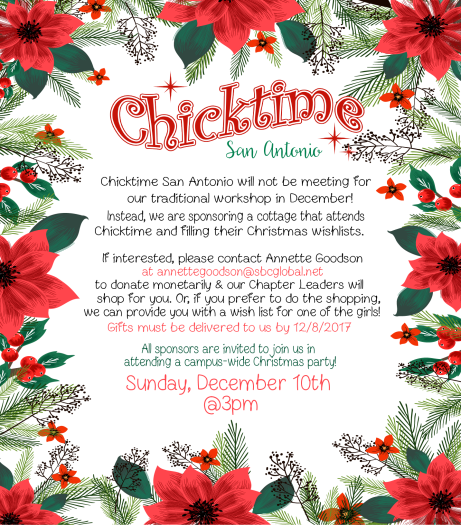 Chicktime San Antonio is one of about 50 chapters across the United States! Don’t you just love being part of something so BIG? Each chapter has a charity partner they have matched up with and are committed to showing up once a month to serve with a different activity! As you know, our chapter serves the teen girls at Boysville Children’s Home! 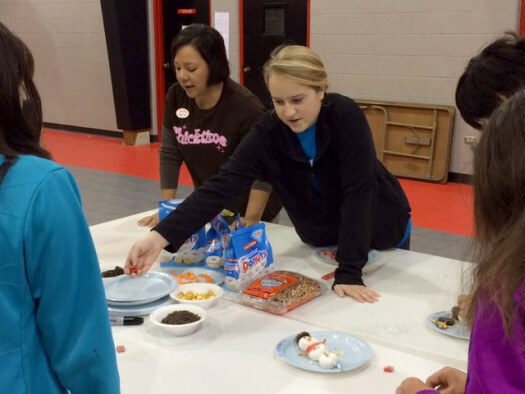 Today, a service club from Stevens High School, Service Over Self, lead our activity and provided our snacks! 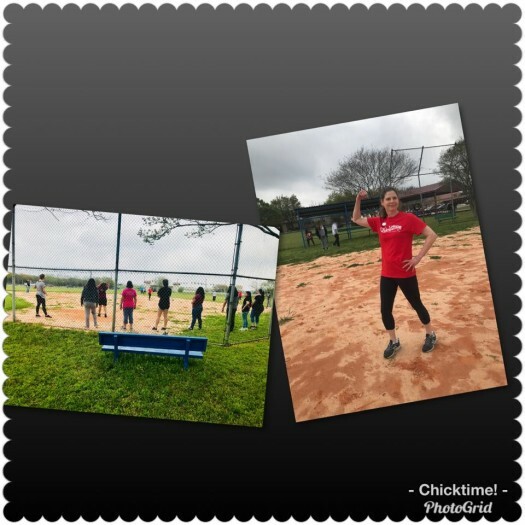 Kickball, fruit, pickles, and Chile powder made for the perfect morning! Imagine a group of teenagers who want nothing more than to serve and on a Saturday morning! Wow!! We were blessed with lots of volunteers who came out -( one on her college spring break and a few more on their high school break) to share the morning and play with us! Oh! Chapter co-leader,Annette Goodsonn kicked in the winning run! 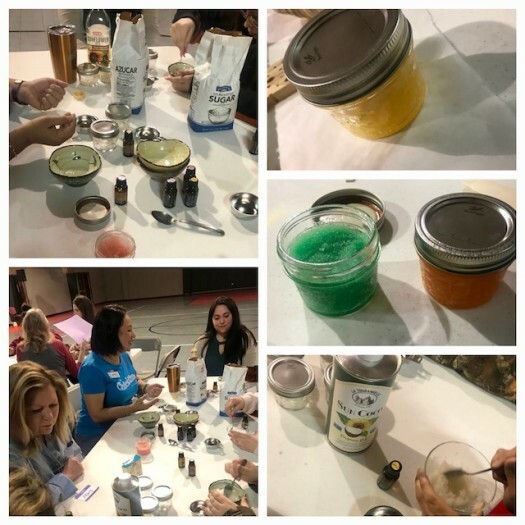 Our February workshop was so many things… fun, busy, and oh so YUMMY! Our monthly workshop leader “Mrs. 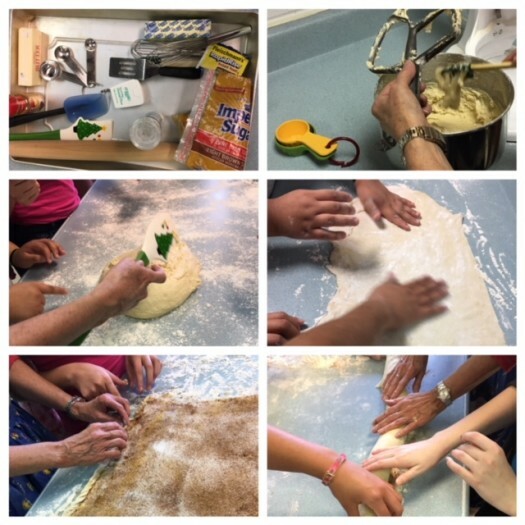 Kelly” ( and long time volunteer with Chicktime San Antonio) taught the girls how to make homemade pizza ?, ( dough AND Sauce) and homemade chocolate squares for dessert! 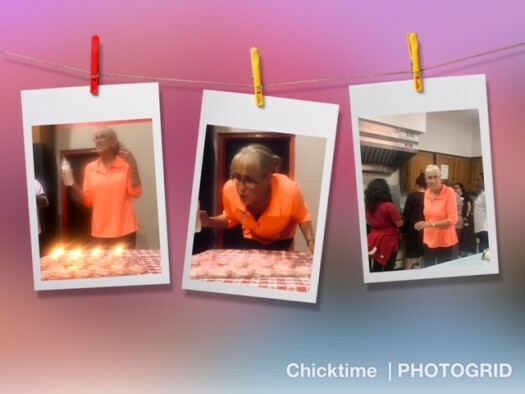 It happened to be her birthday so Chicktime San Antonio made our own special dessert in her honor and sang happy birthday to her! 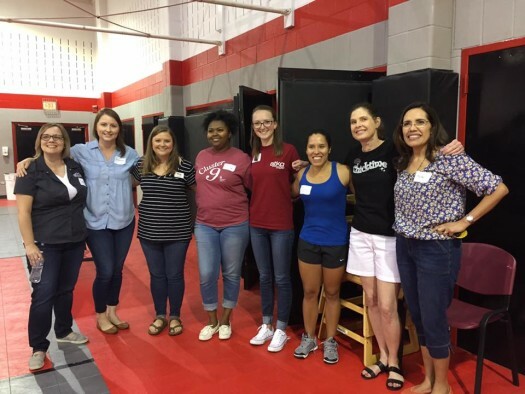 Every… year when we are searching for workshop leaders to take on a month to lead she always says YES! We are so grateful! Special thanks to the service club- SOS( service over self) from Stevens High School who came out to serve alongside with us! Such a beautiful group of girls with HUGE hearts ♥️! 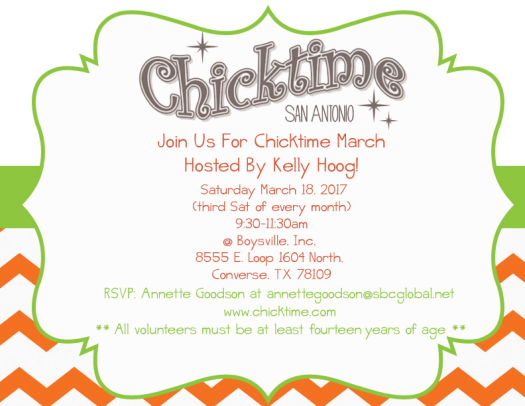 Chicktime San Antonio is committed to serving the teen girls at Boysville the 3rd Saturday of every month for years to come! We pray you will come feel the joy and AMORE we have found when we are there! 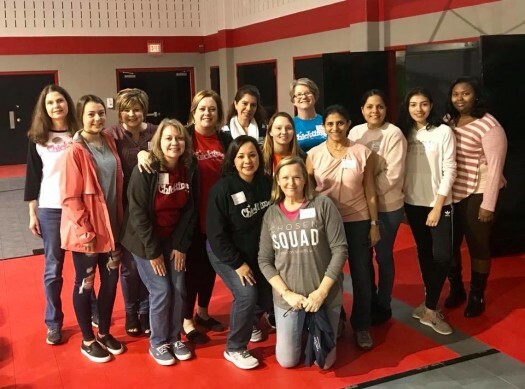 Thank you to the volunteers who showed up this morning to serve the teen girls at Boysville with Chicktime San Antonio! 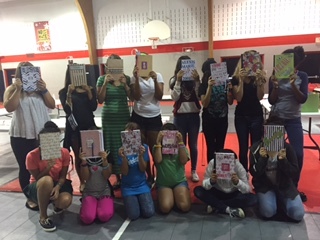 Special thanks to Tara Chapman Johnson for being our workshop leader and showing the girls how to make their own gratitude journals! These beautiful girls who cannot live safely in their own home were the recipients today of women who casted stones of love, nurturance, and grace!!!! What wonderful ripples they made in the lives of the teen girls living at Boysville! Next month we will be making homemade ?! God is good! Beautiful Sunday afternoon spent at Boysville attending their annual Christmas Pagent. Not a dry eye in the room as the children told the Christmas story through drama and song! 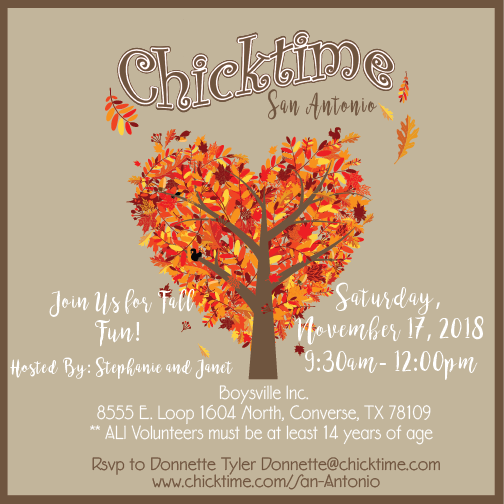 Our charity partner, Boysville, has a Christmas Pagent every year and invites all the volunteers who help them throughout the year as a “thank- you” for serving there and Chicktime San Antonio was honored to attend. 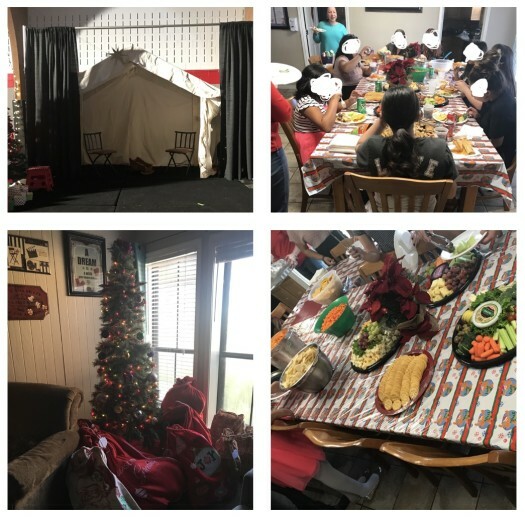 After the pagent, Chicktime San Antonio, was invited back to one of the cottages where our girls who attend our workshops live for refreshments (look at the spread they had for us) and our own intimate Christmas party! Our chapter came with bags full of gifts ( because of VERY generous and loving contributors to our Chapter who helped us fill all the wishes on the girls lists) and were blessed to watch the girls open the gifts one by one and feeling the love we have for them! 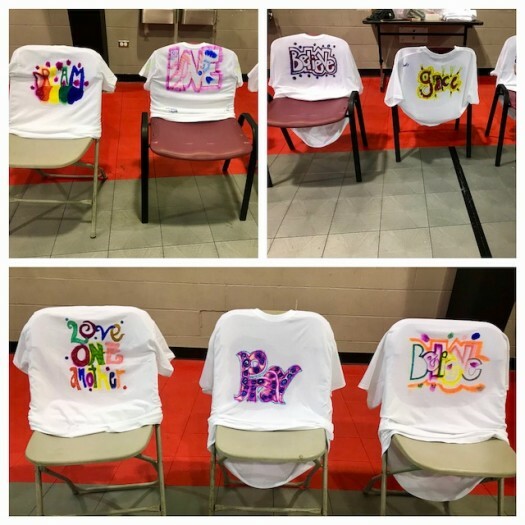 We are excited for 2018 and all the wonderful workshops already lined up to share with the teen girls we serve at Boysville! We hope you can join us one month! Chicktime San Antonio discovered the awesomeness of canned biscuts/canned dough! Our cooking workshop had three stations and we divided the Boysville girls ups to work a station. 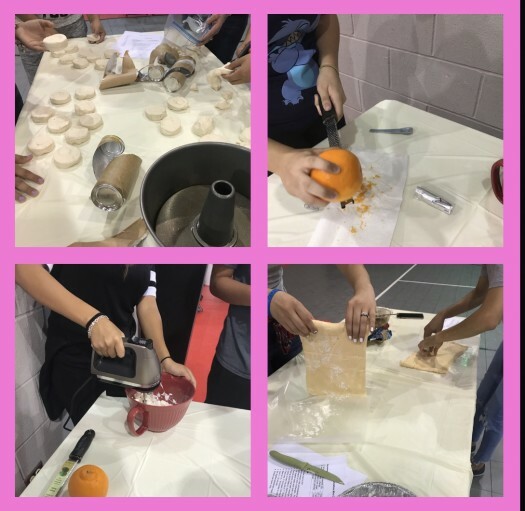 Measuring, zesting, mixing, spreading….you name it~ They did it!! 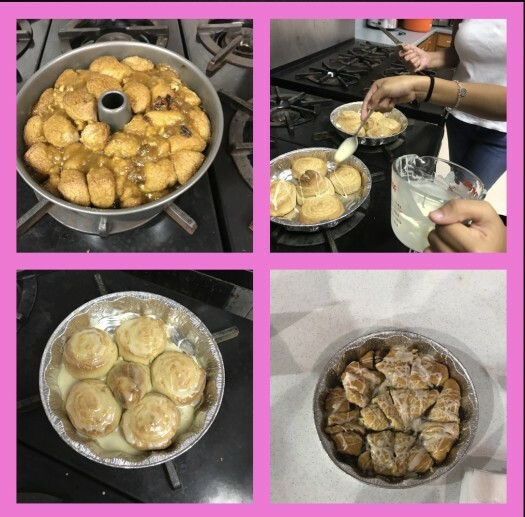 We made Orange rolls, Monkey Bread, and “Chicktime” Mini-Cinnis! 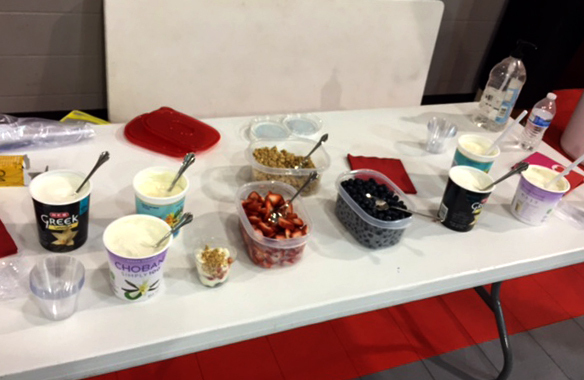 And you probably guessed it…the best part of the morning was sampling all three!! Our Chicktime mornings are always so humbling~ especially when we have just the right amount of volunteers to help us carry out our workshops! 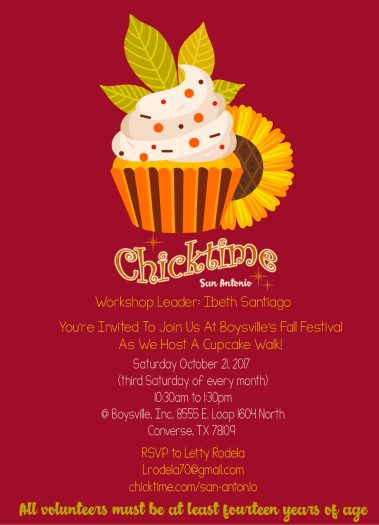 Come help us host a cupcake walk next month at Boysville’s Fall Festival! It’s going to be so fun! What better way to spend a Saturday morning than spending volunteering and mentoring teen girls at Boysville Children’s Home. The volunteers and kids got a great Yoga workout led by Mary Coronado from GFit Studio…. We had such a great time exercising and just plain being silly! Join us next month and come spread and feel the joy yourself! Chicktime San Antonio had such a special summer evening hanging out with the girls who live at Boysville, Inc.! 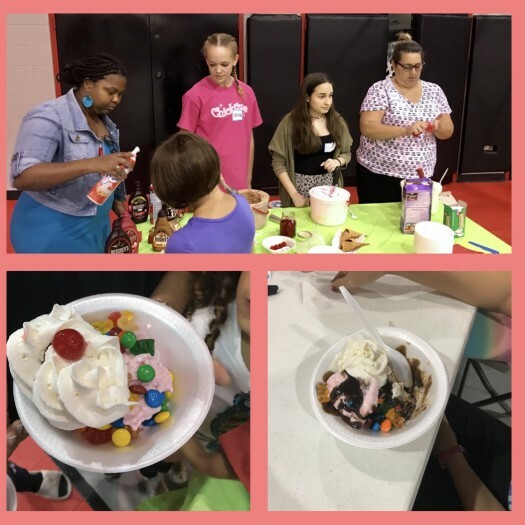 We made ice cream sundaes and played BINGO! And I mean all types of bingo games like T ( for Texas), regular bingo, four corners, blackout, and stand up/sit down ! Lots of girls on the edge of their seats wanting to yell Bingo, but mostly just happy that the ladies from Chicktime were back! Prizes ranged from makeup, bath and body goodies to nail supplies, devotional books and chocolate! As always we ended our time together in a large circle prayer giving thanks for our volunteers, the girls who live at Boysville and the staff that help raise them! 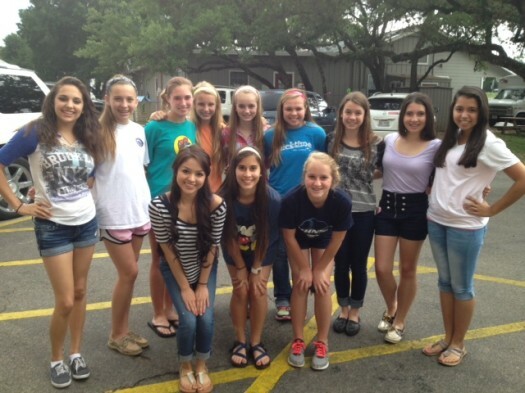 We pray these beautiful girls see HIM in us! Join us next month! 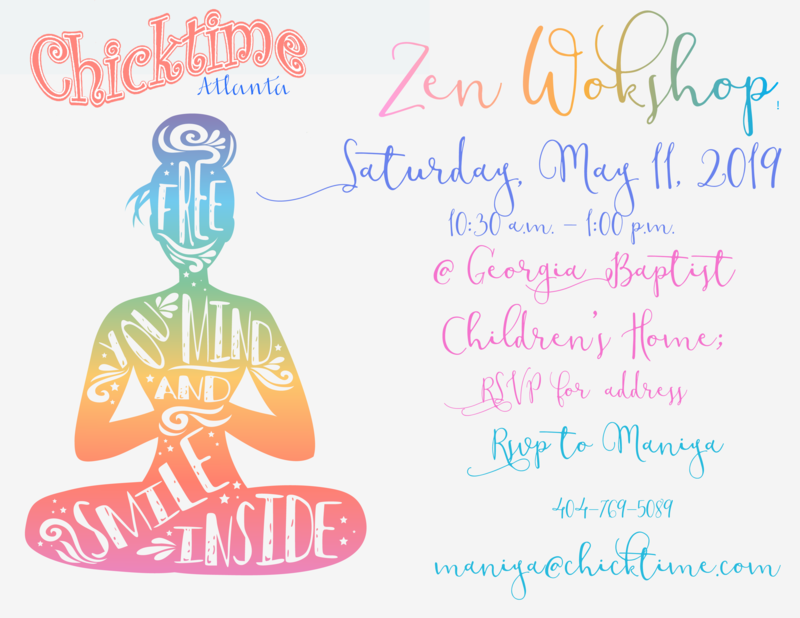 Our August workshop will be YOGA! 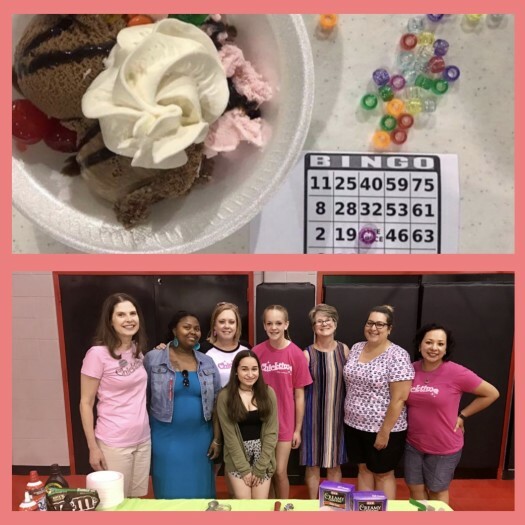 Ice Cream Bar and Bingo!! 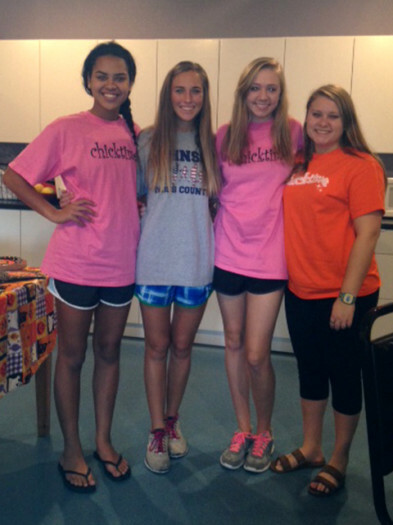 Chicktime June at Boysville Children’s Home was over the top FUN thanks to the ladies from Padre Pio Catholic Church! 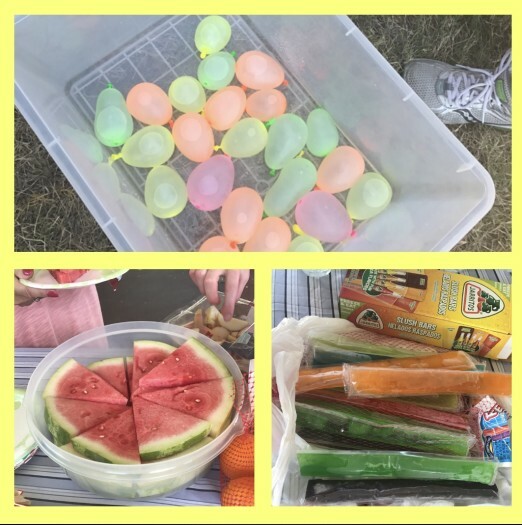 They took our workshop outdoors for summer time “Minute to Win It Games”! We aren’t sure we’ve ever seen the girls this relaxed and laugh so much and so hard! We played games like stack the cups, knock the cups over with a rubber band and move the m & m’s with a straw! Egg toss, catch the cheerio’s in a cup head band, and pass the water cup relay!! The girls even went foot-fishing for marbles!! We shared popsicles , watermelon , and great conversation with the girls about summer plans! We ended our time together like we always do… by circling up and holding hands and praying with each other and for each other! “Be strong and take heart, all who hope in the Lord. Join us next month as we make summer visors!! 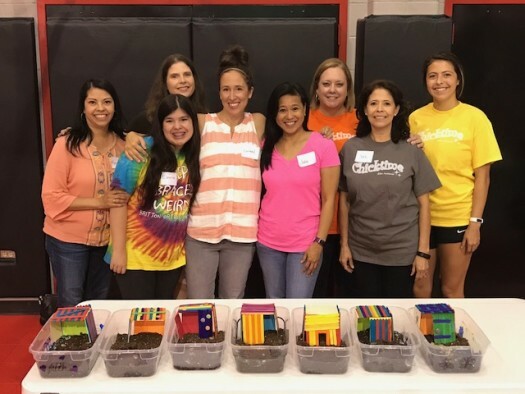 These beautiful Chicktime San Antonio volunteers were planting seeds in more ways than one! 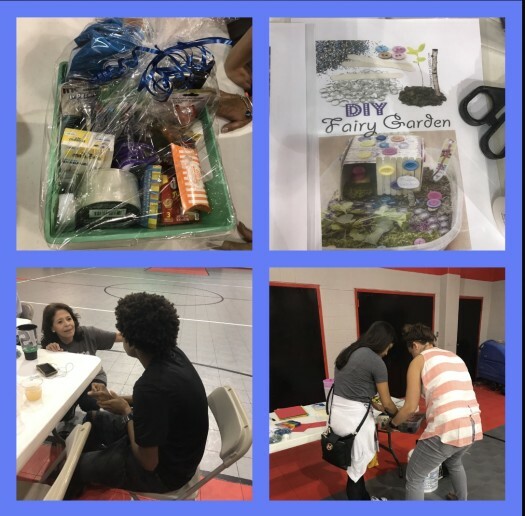 Not only did they plant the seed of love and nurturance with the teen girls at Boysville by being present with them, but they also helped them build their own fairy garden~ seeds and all! The volunteers visited, listened and encouraged…. Love bloomed everywhere in that room! 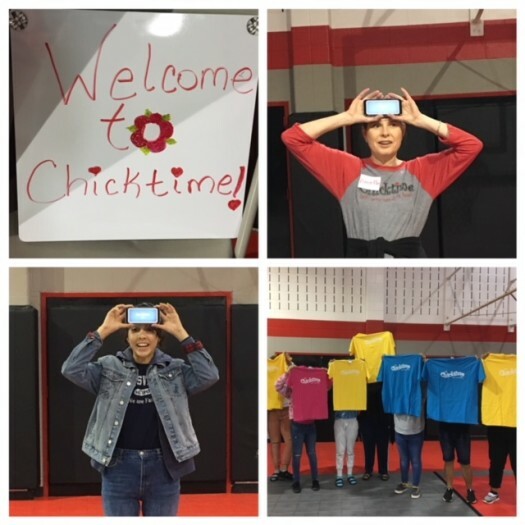 Two special teen girls who have been coming to Chicktime since we started coming to Boysville will graduate at the end of this month and received a “college survival kit” from Chicktime San Antonio, too! The craft was time consuming so the refreshments were a nice touch! Thank you Seli Compton for being our awesome monthly workshop leader and for being one of the faithful volunteers for the 7 years we have been around!! To God be the glory!!! For HE has done great things with our ministry! 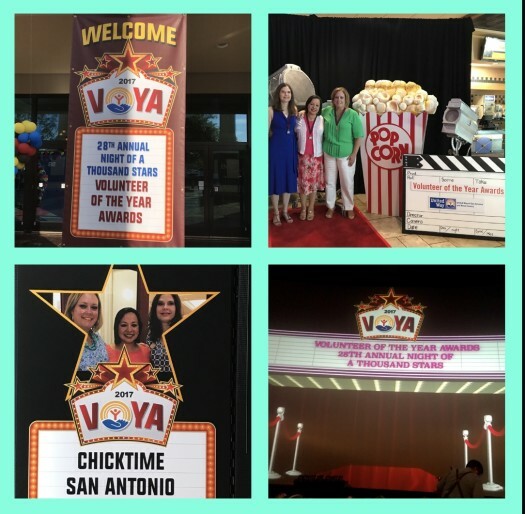 What a humbling evening being nominated by our charity partner, Boysville, Inc at the United Way 28th Annual Volunteer of the Year Awards ! The theme was ~ Night of a Thousand Stars!!! 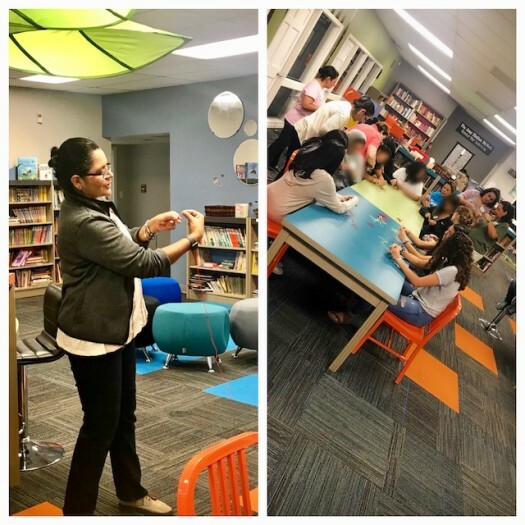 Thank you Boysville, Inc for your nomination and especially Stephanie Almaguer, for being such an awesome volunteer coordinator for Boysville and supporting our monthly workshops! It’s such an honor to serve the beautiful teen girls at Boysville and honored you feel our chapter is worthy of such an award. Thank you to all our volunteers! Without you incredible ladies our chapter would not exist! One Year Anniversary at Boysville! 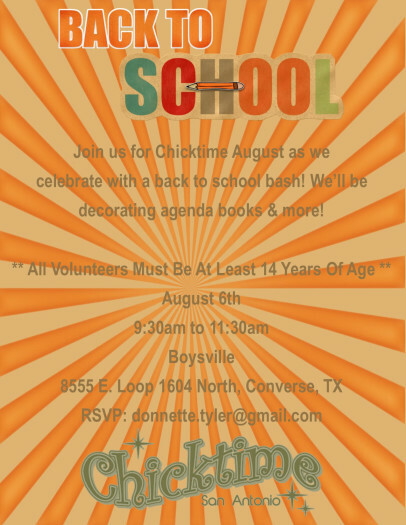 Can you believe it’s already been a year since Chicktime began partnering with Boysville? 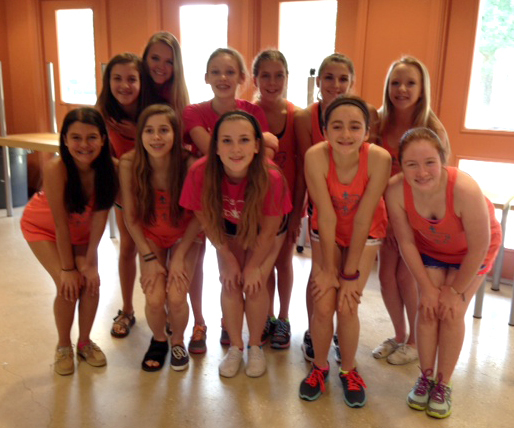 In just 12 short months, we have really gotten to know and love the girls at Boysville. It has been a great opportunity and we are truly blessed to serve these beautiful teens. Our hearts are full of joy when we get an envelope of thank-you cards in the mail every month with sweet messages telling us how much they love the time we spend with them. We thank all of you that have volunteered with us at Boysville over the last year. We couldn’t make this happen without you sharing your time, talent and treasure. Once again, we had a great time at our January activity. The girls made blankets out of all different kind of fleece. They patiently measured, cut and tied while sharing stories of their school activities, plans for the weekend, and looming college applications. Some of the younger girls also worked on pretty beaded bracelets. Afterwards, we snacked on fruit, cookies and crackers. Everyone left with a smile on their face. We want to thank Karen Muldowney for leading this month. She did an amazing job at putting it all together. And, we want to give a shout-out to the new volunteers that came for the first time. We hope to see you again soon! 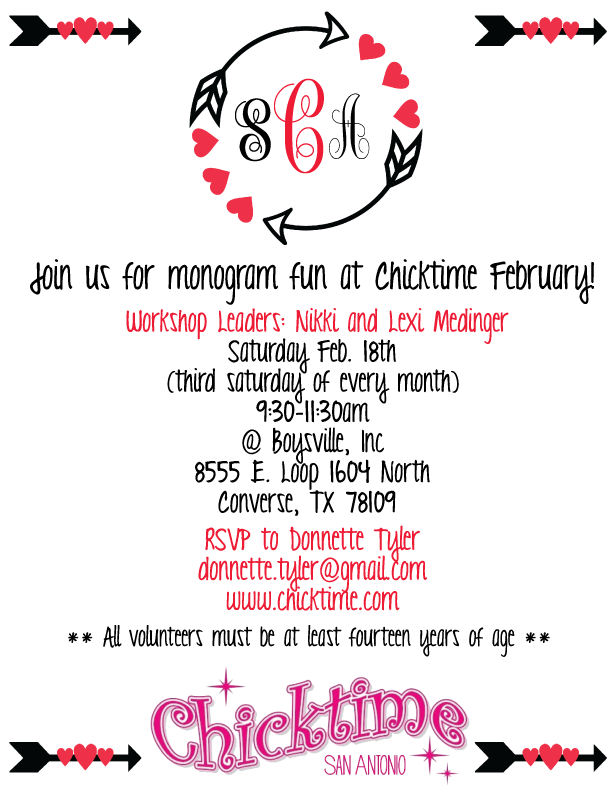 Join us on February 18th for some monogramming fun hosted by Nikki and Lexi Medinger. 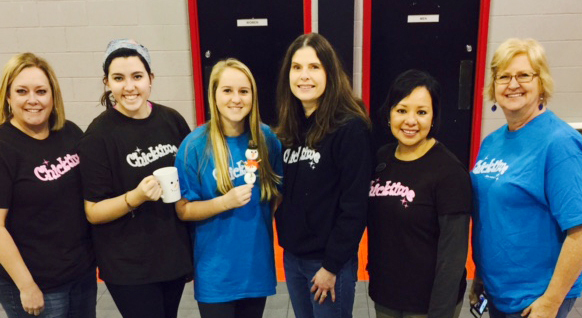 Happy New Year from Chicktime San Antonio! We hope your Christmas was filled with joy in celebration of our Savior’s birth. 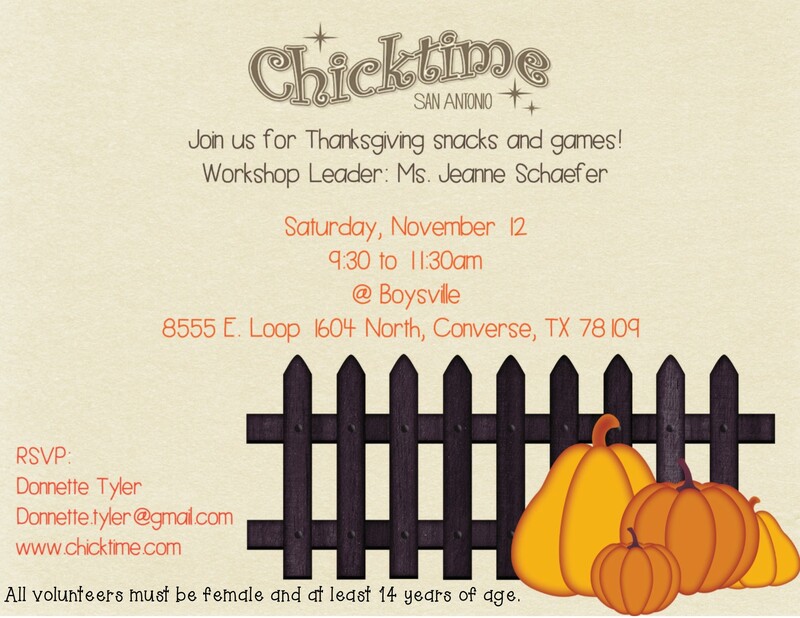 In December, we did not host a Chicktime event due to the full schedule of holiday activities on Boysville’s calendar. But, this time Boysville treated us! Several Chicktime volunteers that sponsored Christmas gifts for Freeman Cottage were invited to a Christmas Pageant and Stocking Party. We had a fantastic time watching the pageant that was comprised of comedy, dancing, singing, musical talent and a fashion show. Afterwards, we had dinner with the teen girls in Freeman Cottage followed by a gift exchange. It was an amazing experience to be welcomed into their home and treated like family. We will not soon forget that day. Looking back, we think that 2016 may have been one of our best years yet! In January, we began our partnership with Boysville. It’s hard to believe it’s only been a year because we have already formed such strong bonds with the teen girls that live there. In spite of the circumstances that have brought them to this children’s home, they continue to impress us by how sweet, polite and positive they are. Every month we receive a packet of hand-written thank you notes and they are always excited about the activity we have in store for them the next month. We are so blessed to have had the opportunity to work alongside many of you this past year. A huge THANKS to all of you who gave up your Saturday mornings to come out and volunteer—especially those of you who led one of our monthly activities. Without you, we would not be able to carry out our mission. We are particularly grateful for those of you who joined us for the first time this year. We feel like many of you are already old friends! If you have not joined us yet, what are you waiting for? As the New Year rolls in, we wish that all of you could experience the joy we have received from the work we do at Chicktime. If you are not sure how to get started, please email us and we’d be happy to tell you more. 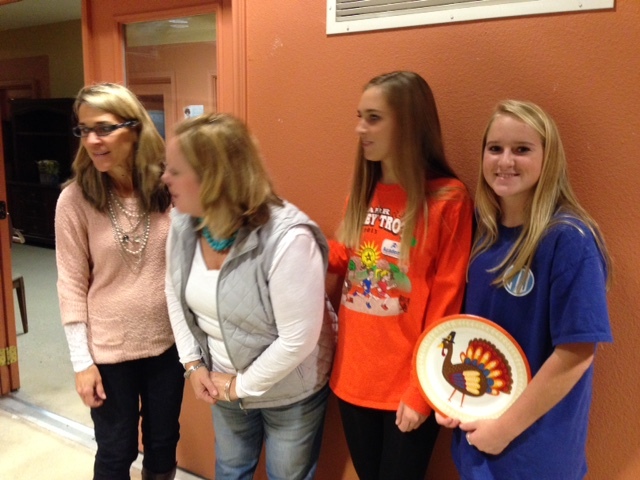 Today we gathered with the teen girls at Boysville to give thanks for our blessings and prepare for Thanksgiving. 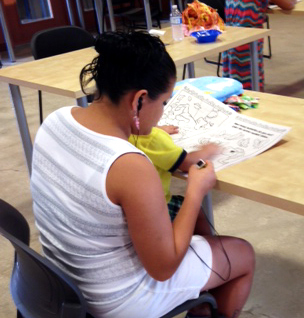 We kicked off the morning with a fall picture frame craft and some grown-up coloring pages. Do you remember how much you loved coloring when you were a kid? Well, the girls loved it just as much! Then, it was time to play a game. Have you ever heard of Turkey in the Straw? Think back to your birthday parties in elementary school when you tied a balloon to your ankle and you all tried to stomp on each other’s balloons and pop them. This was a great way to get the girls up and moving and it was no surprise how competitive they were. It was so fun to see them running around, laughing and having fun with friends. 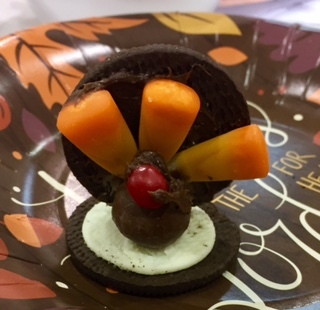 Next, we made turkeys out of Oreos, a little chocolate frosting, Whoppers, candy corn and red hot candies. What a yummy treat! Every girl left with special treats – a bag of “Blessings Snack Mix”, fall coloring pages and smiles on their faces. 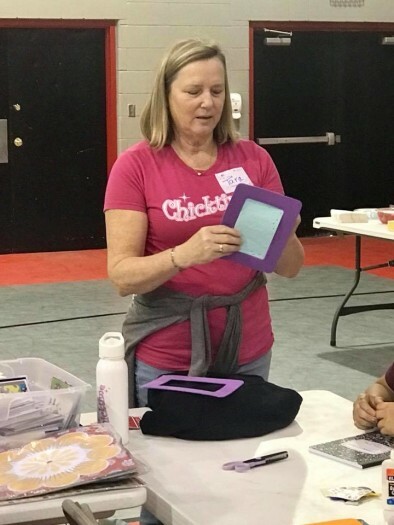 We want to thank Jeanne Schaefer – one of our most faithful volunteers since we started the San Antonio Chapter of Chicktime several years ago. She has always come through when we needed her to lead an activity. 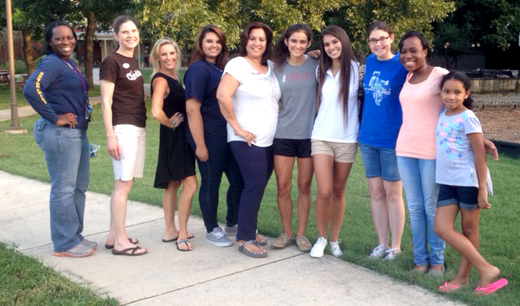 We also want to thank the students from UTSA that have been volunteering with us in recent months. You are such fantastic role models for the girls living at Boysville! And, special thanks to our volunteers that came from Ft. Sam Houston. We are thankful for your service to our country and for spending your Saturday giving back to our community. We hope to see you again soon! We are so blessed to have the opportunity to share one Saturday per month with these very special girls. Believe it or not, they send us thank you letters every single month. Our hearts are full of joy when we read about what a great time they have and how appreciative they are. October Activity:ALL TREAT AND NO TRICKS! 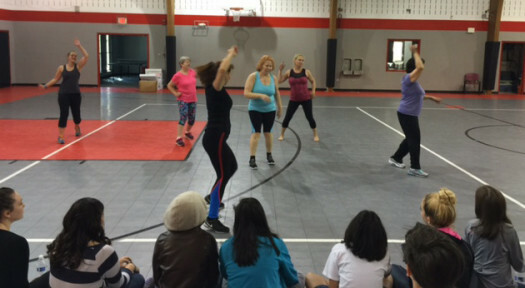 Our October activity was a great morning for Chicktime San Antonio. 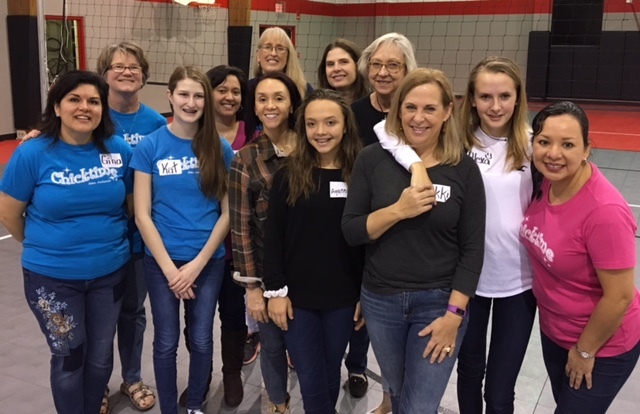 Sixteen “Chicks” plus the three chapter leaders didn’t just sit around and take up space…we did what God created us to do-make a difference by doing something as simple as playing bingo with the teen girls at Boysville. We had enough volunteers to sit side-by-side with the sweet girls we serve and play and laugh with them. I wish everyone reading this could picture what a safe and relaxing environment this creates for girls who are living in this place because their life was not always this good. The anticipation and excitement of calling out “bingo” created such a fun atmosphere. 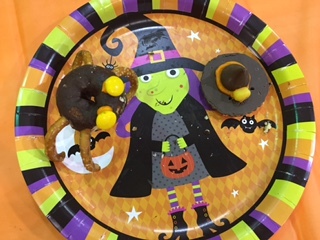 This excitement carried over in our food craft time where we made spiders out of pretzels and chocolate donuts; and we made witch’s hats out of chocolate kisses and cookies and candy corn. The Halloween fun didn’t stop there. The girls mixed their own Halloween snack mix with Cheetos puffs, candy corn, popcorn, pretzels and well you get the picture. YUMMY STUFF! They were able to fill up goody bags to take to their cottages for later because we had “orange goodies” like goldfish crackers and Cheetos to snack on and Orange Crush to drink on site! 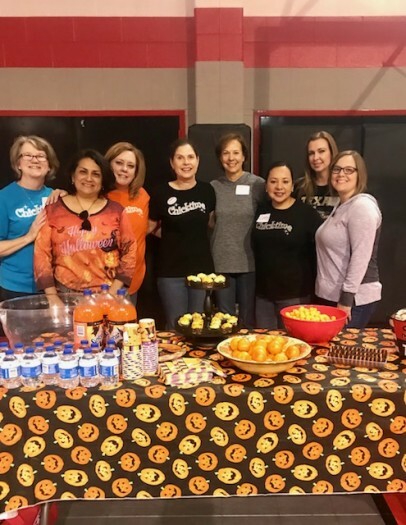 We will be back at it next month on Saturday, November 12th, and can’t wait to see what God has planned through our monthly leader Jeanne Schafer. We hope you will join us. Our August activity focused on starting school on the right track with goal setting and organization. We took advantage of the opening of the 2016 Olympics and emphasized how the athletes started their Olympic journeys with big dreams, solid goals, and plenty of hard work. We talked about the importance of goal setting, and the components to set SMART (specific, measurable, attainable, relevant and timely) goals. Additionally, we shared our tactics for getting organized and managing a calendar. We accentuated how they could all be winners in their individual lives with effective goal setting, good management, effective decision making and follow through. 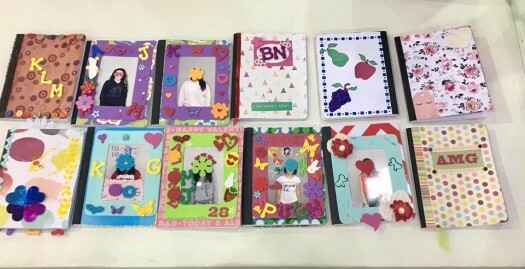 The girls really enjoyed personalizing their agenda books by covering them with pretty scrapbook papers that reflected their personalities. They worked hard at beautifying their new notebooks with stickers, inspirational verses and sparkle. Additionally, they created matching bookmarks and seemed ready to start using them both. It was inspiring to hear the older girls share their school tips and tricks with the younger girls. No activity is complete without a snack! To further tie in the Olympic theme, the girls enjoyed an American flag sugar cookie cake and a chocolate chip cookie cake decorated with the Olympic rings. We ended our activity with prayer, asking our Lord to bless the students, teachers and parents as they begin the new school year. 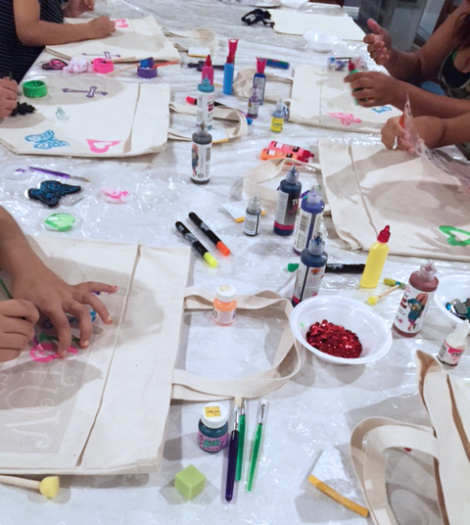 Mark your calendar for September 17th and join us for a morning of crafts with the teen girls at Boysville hosted by Lee and Gaby Pares. Setup is at 9:30 and we will begin the activity at 10:00. Be on the lookout for our invitation. We are beginning to fill out the calendar for 2017. Would you please consider leading one of our monthly events? Do you have a hobby or interest that you are passionate about? Maybe a craft, cooking, gardening or fitness activity? 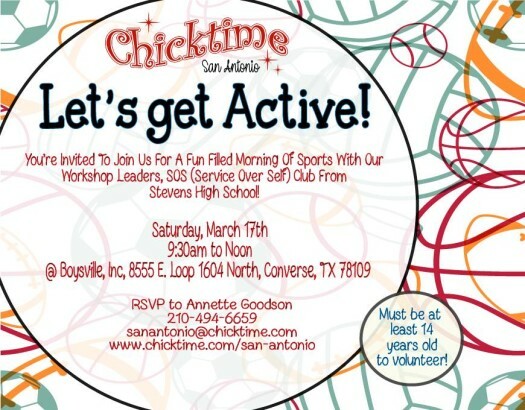 The girls at Boysville would love for you to share a Saturday morning with them. Please contact Donnette Tyler at donnettetyler@gmail.com if you are interested. 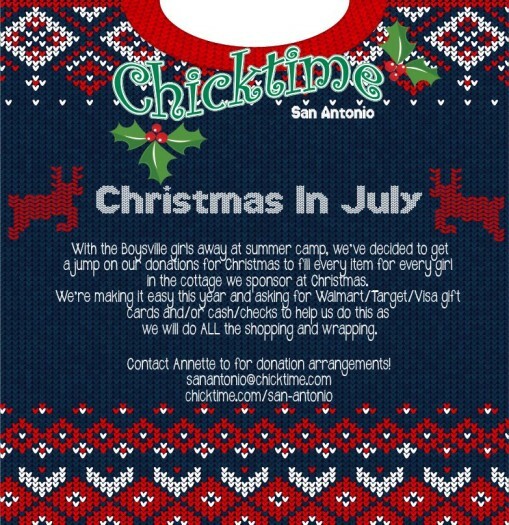 On Saturday, June 18th, Chicktime San Antonio had one goal in mind and that was to get the teen girls at Boysville ready for summer. And, what is a hot Texas summer without flip-flops? 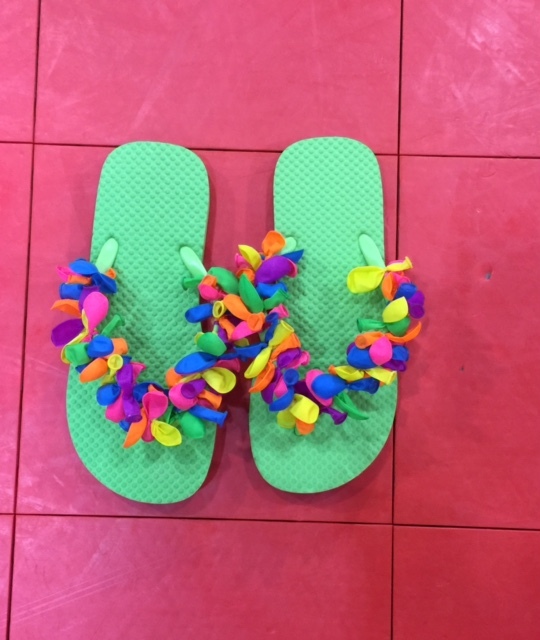 This month’s activity leader, Tori Tyler, showed the girls how to turn basic flip flops into fun and unique ones. 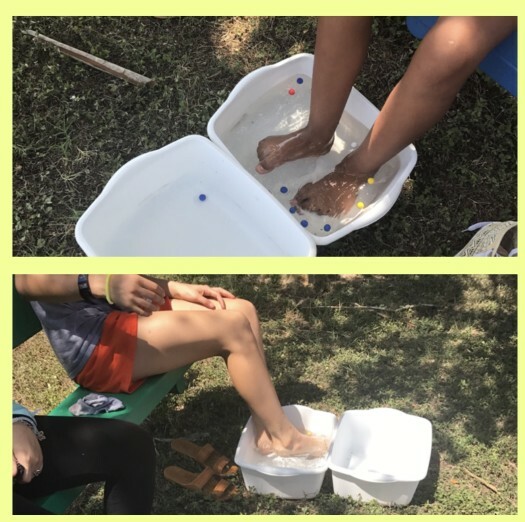 This flip flop activity took a twist on the fabric tie flip flops and used water balloons instead! The craft time allowed the girls to not only be creative, but to laugh and share with each other about summer plans and newly-found jobs. Flip flop crafting made the girls hungry, so the assorted flavor mini muffins and peanut butter crackers were a nice treat. 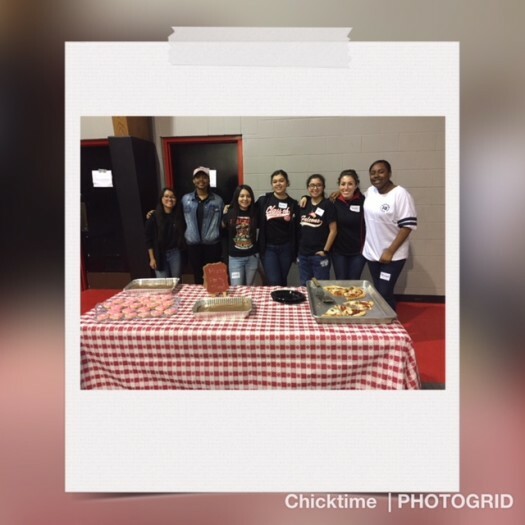 We are forever grateful to recent high school graduate, Tori Tyler, who has been coming and serving Chicktime San Antonio since we started. She not only comes to serve, but occasionally takes the leadership role in a monthly activity. This month was no different. We are going to miss her once she goes off to college in August. We are always looking for more teens that would like to volunteer and possibly even plan and lead one of our monthly activities. And, you can earn volunteer hours, too! 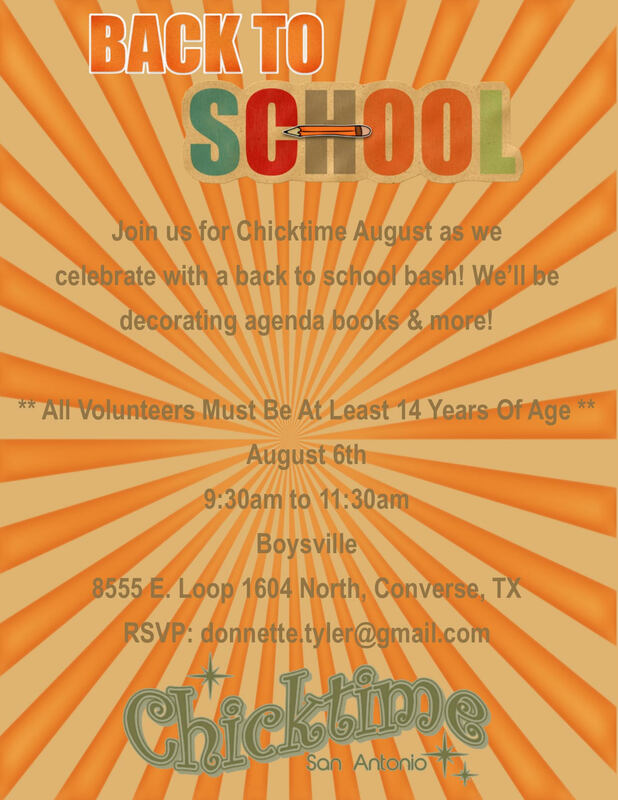 Due to a heavy summer schedule, Boysville is not able to have Chicktime in July so we will have a combination July/August activity on August 6th. Please mark your calendar! “Mama always said life is like a box of chocolates. You never know which one you’re gonna get.” I have watched that movie a hundred times and never gave much thought to that famous line from Forrest Gump, until a few years ago. Contrary to my belief, the life I have is not as common as I thought. In my mind, I thought most teen girls had their own spot on a sectional sofa to watch Netflix with their family. Dads are math heroes and moms help you straighten your hair in the morning before school. At the age of 12, I began to interact with girls whose life experiences were far different than mine and the reality that some children and teens were trapped in dangerous and unhealthy homes pierced my heart. Globally, millions of children and teens are affected by things out of their control such as sexual exploitation, physical and mental abuse, and neglect. It’s not just happening in faraway places, but in homes just around the corner from where I live. For the past seven or so years, I have been volunteering with Chicktime. 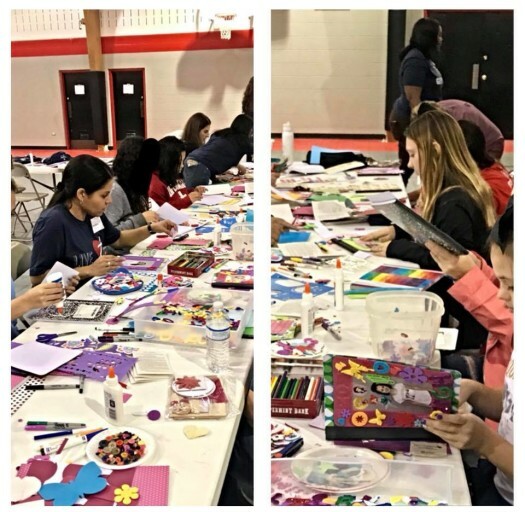 Once a month, I help provide an activity for teen girls who live in shelters or homes not their own, because they have suffered untold abuse and neglect by hands of those they trust. I’m not going to lie, initially, the girls scared me. I’m pretty sure they found joy in the fear they could see in my eyes. I thought they were rude, aggressive, and just downright not anyone I would want to be friends with at any given time. The fact that they didn’t welcome me with open arms after I sacrificed the third Saturday of every month to be with them was simply annoying. Month after month, I showed up. Eventually, fear turned to trust. Not just in my heart, but in the hearts of the girls I came to visit. Some I came to know personally. They knew my name and I knew their name. I had conversations with girls my own age over crafts and card games about being sold sexually for drug money or being thrown across the room for eating the last piece of bologna in the refrigerator. Mixed in these conversations were discussions about boys, makeup, and food. The very same topics I have conversations with girls I’ve grown up with all my life. Different life experiences, but same hopes and desires. Life is like a box of chocolates. There are many different life experiences. Some have a little more bumps, while others have smooth edges and little surprises. Yet, when we manage to get to the inside, we can see that all are very similar. We all yearn to be loved and accepted and not be judged by the experiences that are merely just a part of who we are. 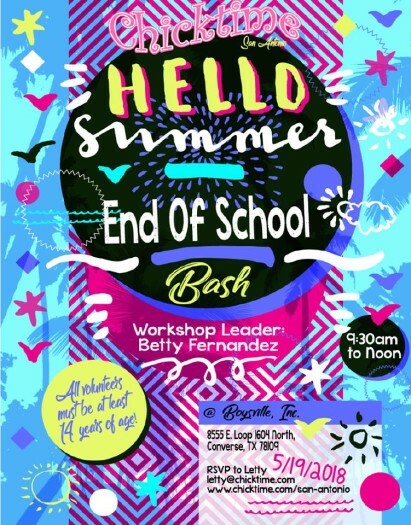 May Activity: END OF SCHOOL YEAR CELEBRATION! 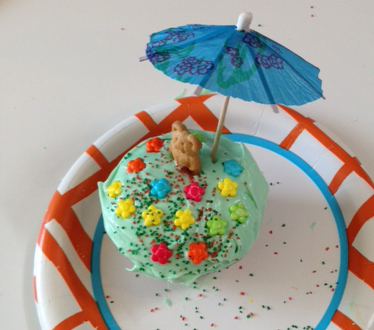 For our May activity at Boysville, we had an end of school year party. 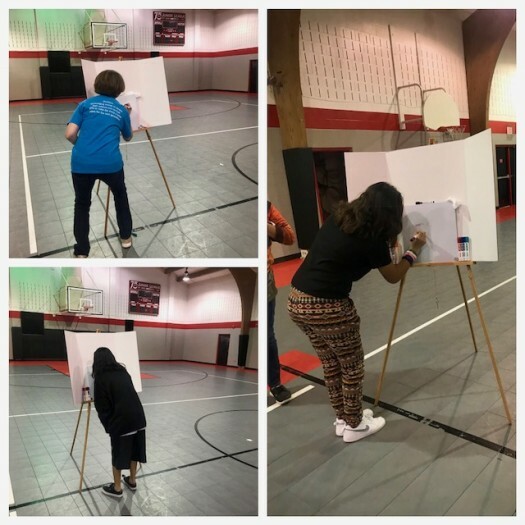 We got active by playing Minute to Win It games with the teens. We divided into teams and played Face the Cookie, M&M Sort, Pasta Pickup, Balloon Juggling, Paper Sack Relay and Moving On Up. 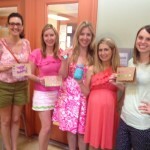 The winning team received cute summer insulated tumblers and consolation prizes were bright colored headbands. We finished off with some refreshing summer treats of watermelon, cantaloupe and pineapple with Tajin and Chamoy along with frozen pop sticks. We definitely needed to cool off by that point! Everyone seemed to have a great time and the girls were already asking when we were going to come back. It is such a blessing when we turn sadness into smiles. The hugs and thanks help us to know that we are touching their hearts by letting the girls know that they are loved and cared for. Join us for fun and games as we celebrate the end of the school year with the teen girls at Boysville. We will be playing Minute to Win It games! 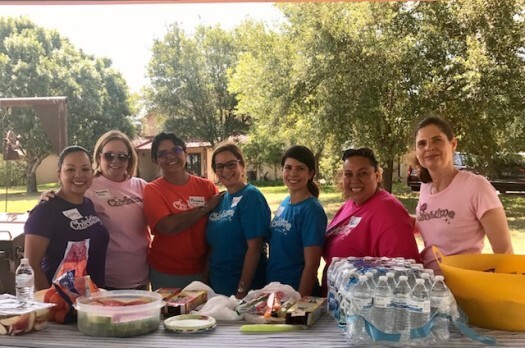 As Fiesta begins in San Antonio, a fabulous group of volunteers from the Shrine of St Padre Pio Spanish ACTS along with a faithful group of teens brought their Fiesta joy and hands to Boysville. 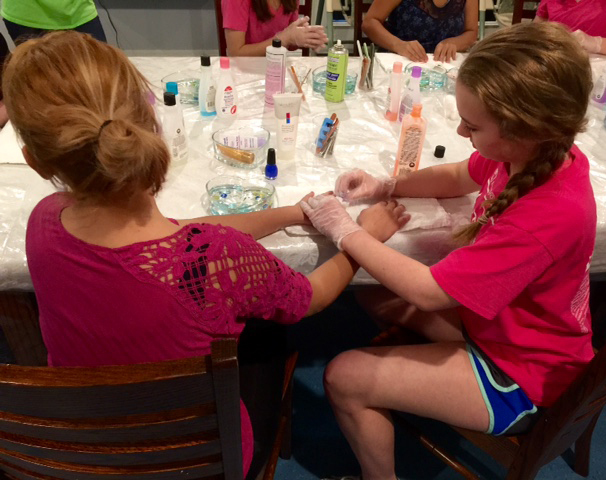 Our morning started with each girl picking their favorite polish from an array of colors and glitter. The stations consisted of a scrub, massage, nail filing, polishing and of course glitter and bling. 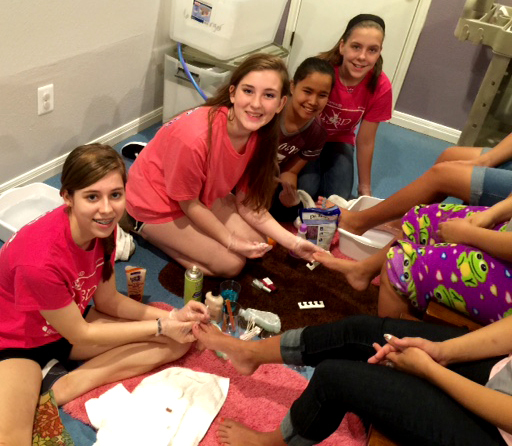 The girls’ hands and feet were prettied up and our spirits and hearts were brightened as they conversed and laughed. No fiesta would be complete without food! The feast of cookies, jello, veggies and fruit did not go untouched. The watermelon, pineapple and cantaloupe covered with chamoy and tajin (spicy tangy toppings) were especially popular with the girls.We finished our morning with bilingual prayer, thanking our Lord for the girls and for allowing us to be His hands and feet on this day. Yours are the eyes through which He looks Compassion into the world. 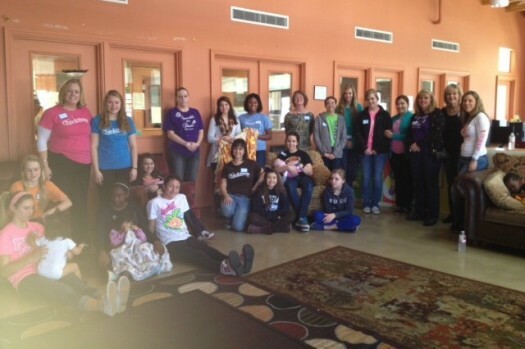 What a great time we had in February hanging out on a Saturday morning with the teen girls at Boysville! 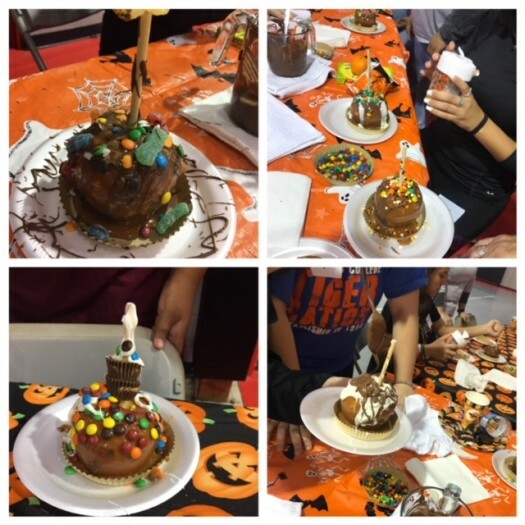 Everyone tried their hand at decorating cupcakes with pastry bags full of frosting, fondant cutouts, vanilla chips, sprinkles and even some chocolate and caramel faux rocks. The creatively decorated cupcakes were as beautiful and unique as the girls themselves. We could see the pride in their faces as the volunteers circulated and oohed and aahed over their creations. 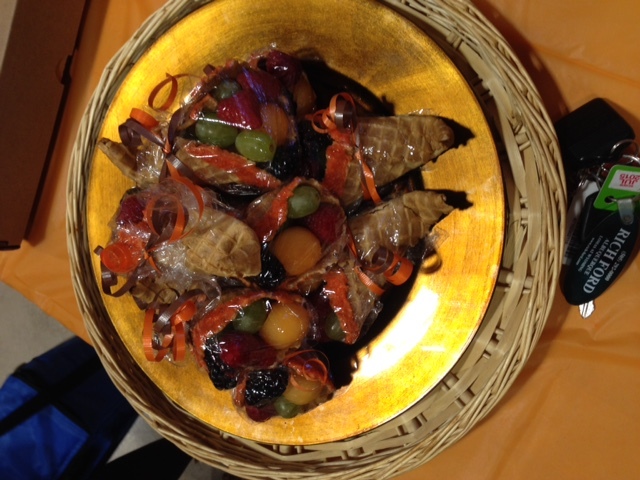 Of course, the day wouldn’t be complete without a sampling of the sweet treats that tasted as good as they looked. We finished in prayer, giving thanks for the opportunity to spend time with new friends. 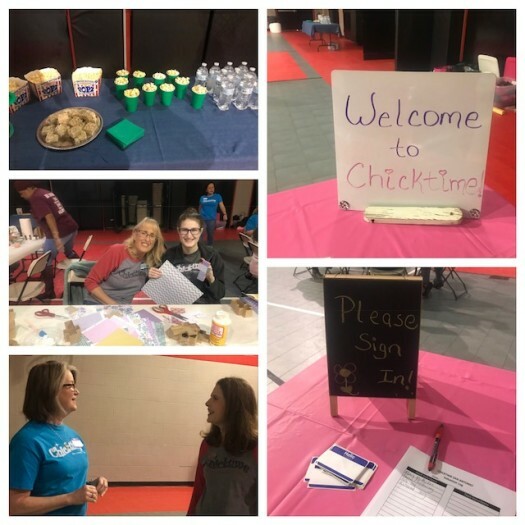 A big Thank You to Kelly, Jillian and Katherine Hoog for hosting and providing all of the supplies for another fun Chicktime activity! We are so grateful that you have volunteered your time and talent for several of our events. We are starting to put together our roster for 2016 and we are looking for monthly leaders to host activities as early as February!! January Activity: A NEW HOME AT LAST! 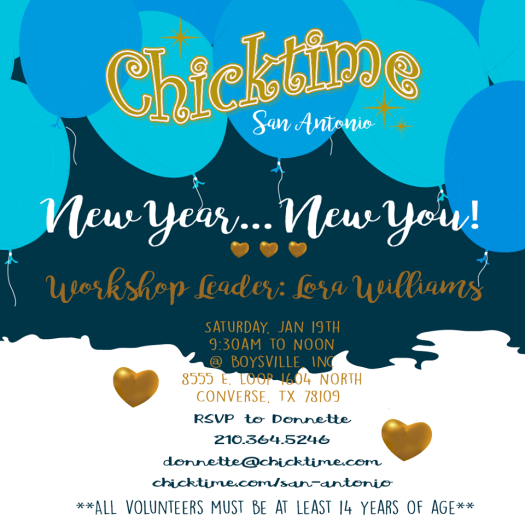 The New Year brings exciting changes for Chicktime San Antonio! We now have a new place to serve and they are just as excited as we are to be in partnership together. Boysville is a group home located in Converse Texas. The leadership team, along with a couple of teen “Chicks”, showed up on Saturday, January 23rd, to get a feel for the new atmosphere and let the teen girls at Boysville (yes, there are girls at Boysville) get a feel for who we are and what we do before we open up activities to our volunteer roster. We set up three stations for the girls to rotate through our snowman-themed activities. We painted snowman hot chocolate mugs, made snowman powdered sugar donut snacks and made some “Chicktime” homemade hot chocolate mix for the girls to take back to their cottages for cold days to come. Of course, we had to sample the hot chocolate mix and eat our snacks which allowed us time to visit and get to know each other. Our morning was complete with a closing prayer for the girls and their house parents who care for them on a daily basis. The morning was perfect! 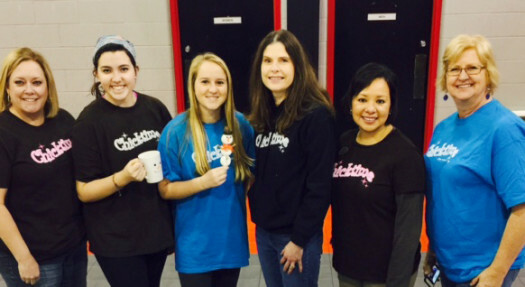 Happy New Year from Chicktime San Antonio! We are excited to kick off the year with our new charity partner, Boysville. 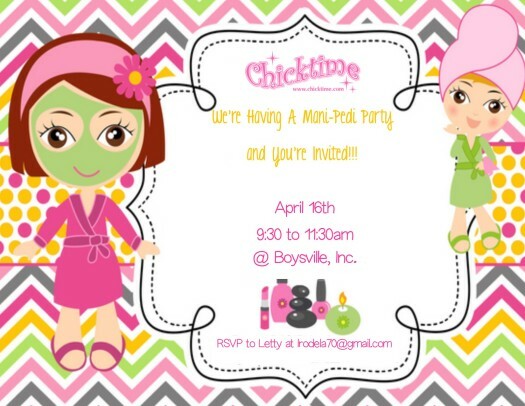 Yes we are still “Chick”time and Boysville actually does have girls. We will continue to work with teen girls just like we have in the past. Our leadership team is hosting a “soft” opening in January in order to get familiar with the kids and the facilities before we open it up to our volunteer Chicks. Some suggested activities the girls might be interested in are: manicures/pedicures, crafts, cooking, gardening, photography, exercise and sports. It doesn’t require that you spend a lot of money. Sometimes, simplicity is best. 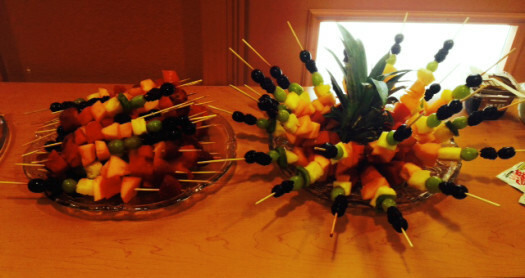 If refreshments are more your style, we welcome volunteers to host snacks at the events. 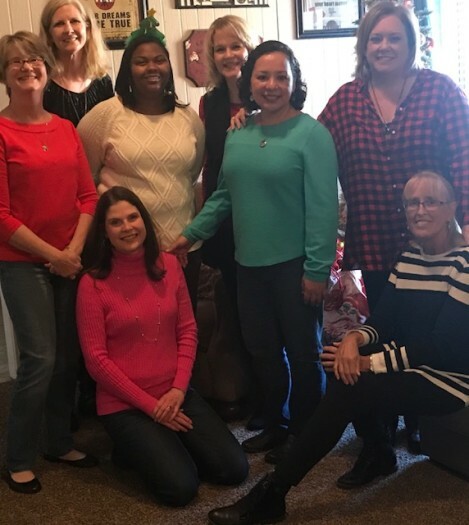 As 2015 comes to a close, we would like to thank all of our faithful volunteers that have stepped up to lead a month or just volunteer their time over the last year at Seton Home’s Casa de Milagros. 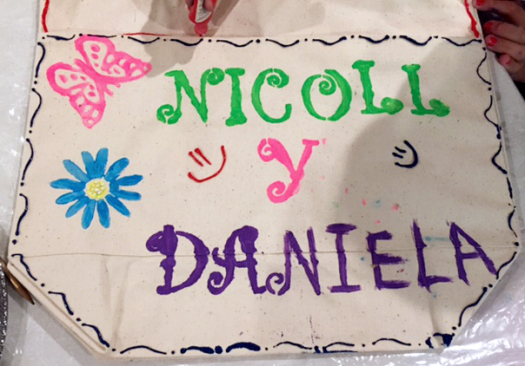 We have truly enjoyed our work with the girls at Casa de Milagros over the past 3 years and hope that the time we have spent with them has made an impact on their lives. Many of the girls come to this country traumatized, scared and lonely while they await the births of their children or as they parent their newborns far from home and family. We have shown them that they are loved and cared for—and hopefully they have learned a few things along the way. Thank you all again for giving from your hearts! As we mentioned a couple of months ago, the federal government has placed new volunteer requirements on Casa de Milagros which we felt were too onerous for our volunteers. Seton Home applied for a waiver, but it was not granted. Therefore, we have no choice but to look for another organization to partner with. While we are sad that our time with Seton Home and Casa de Milagros has come to an end, we look forward to new beginnings. After much prayer, discussions with several organizations and some site visits, we have decided to give Boysville a 3 month trial. Boysville is a co-ed residential children’s home that has been serving South Texas since 1943. They are located off of Loop 1604 in Converse. For more information about Boysville, visit their website at www.boysvilletexas.org. We will continue to focus our work on teen girls at this facility. Stay tuned for more information about our first event in January 2016! We hope to see you there. We wish you and your family wonderful Christmas season and a Happy 2016! 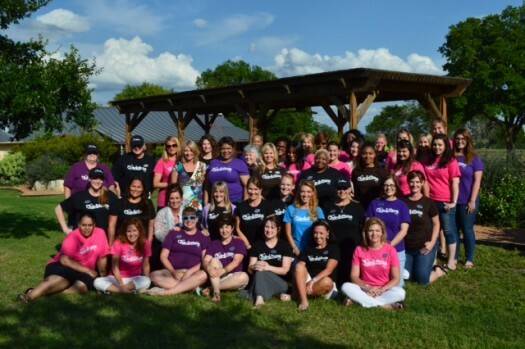 We just had the privilege of attending the Chicktime annual retreat September 25th – 27th right here in San Antonio. What an amazing experience it is to gather with women from all over the U.S. who are passionate about using their talents to make the world a better place. There were representatives from 21 chapters coming from chapters as far away as Oceanside, CA to Rockford, IL to Spring Hill, FL. We enjoyed the opportunity to exchange ideas and encourage each other through the challenges that we face in organizing our chapters and moving towards our mission. As part of the retreat, we were also able to attend the Chosen Conference at Summit Christian Center. What an amazing opportunity for spiritual renewal as we listened to some well renowned Christian motivational speakers. We were reminded to stand and move forward on the path that God has laid out before us. It was so inspiring to join with thousands of our fellow sisters to praise God for the many blessings He has bestowed upon us. 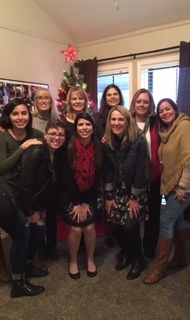 We want to thank Lori Rhodes, Chicktime founder, for organizing the retreat and for sharing her blessings so that we could enjoy such a wonderful experience. We are already looking forward to next year! We are still waiting to find out if Seton Home has been able to obtain a waiver so that we may return to Casa de Milagros without having to follow the new highly-restrictive requirements that the federal government is now imposing on volunteers at certain federally funded agencies. In the meantime, we are exploring some other agencies that are interested in partnering with us so that we may determine if they are a good fit with both our mission and the demographics of our volunteer base. We will keep you posted on our status and we ask that you pray that God points us in the direction where we are needed the most. 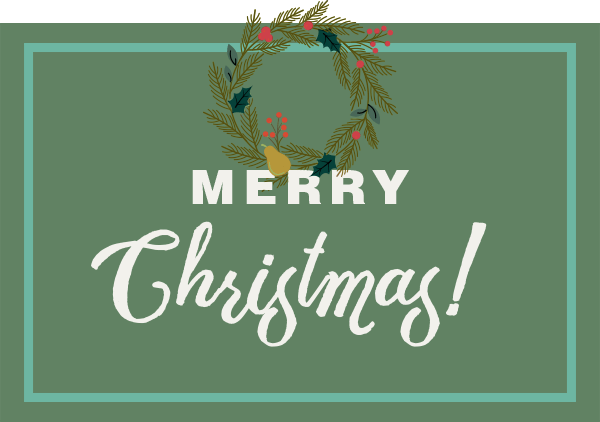 Please know that we love you all for the gifts you have shared with Chicktime in the past and we look forward to the day when we will all be working side by side again to serve those that need us in our community. 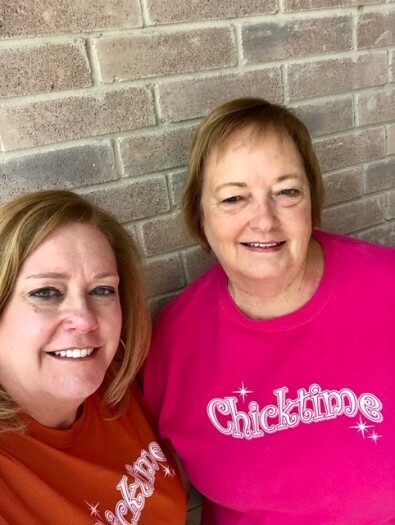 Chicktime was recently notified by the volunteer coordinator at Seton Home that the government has changed the volunteer requirements for all agencies receiving federal grants. As such, these new rules would require all Chicktime members that volunteer at Seton Home/Casa de Milagros to submit to background checks, fingerprinting, TB testing, etc. We, as Chicktime leaders, have always undergone these stringent requirements. However, volunteers were not subject to these as long as they were under the supervision of approved Chicktime leaders. 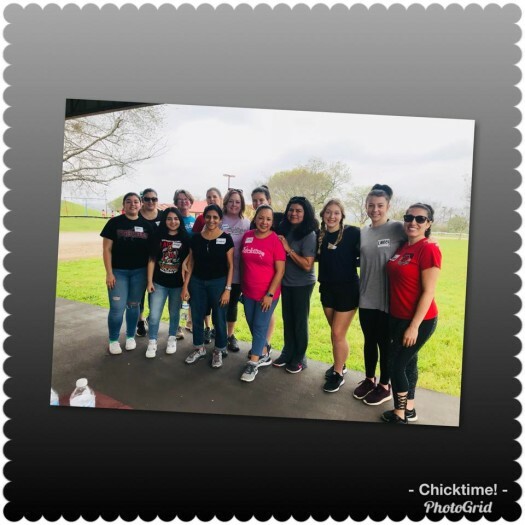 Seton Home is in the process of requesting a waiver for Chicktime since we are currently the only organization that is volunteering with the Casa de Milagros shelter. However, we will likely not have a response until sometime in the fall. 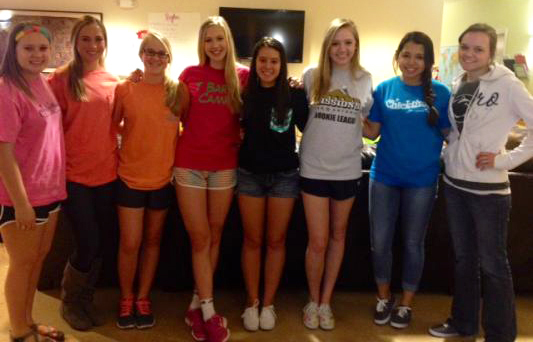 Therefore, Chicktime is currently suspending all volunteer activities at Seton Home/Casa de Milagros. We will notify you of other volunteer opportunities in the area as we become aware of them. Additionally, we are looking into other agencies to partner with. We will keep you posted! 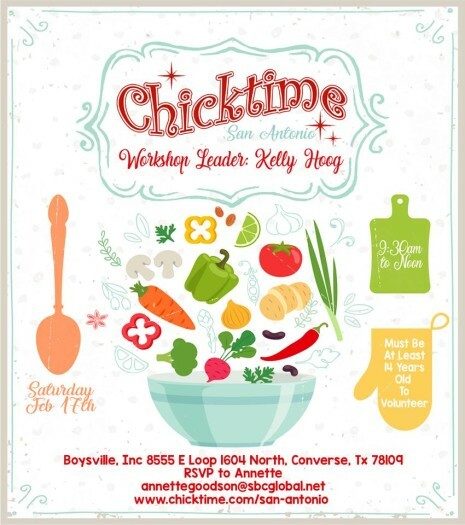 In the meantime, please check out some of the upcoming events sponsored by some of the other Chicktime Chapters in our area — Chicktime SA Central, Chicktime Hope, Chicktime Boerne, Chicktime Bulverde, or Chicktime Canyon Lake. You may find them by visiting the Chicktime website at www.chicktime.com. We trust that God will lead us in the direction where we are needed most. In the meantime, please pray that we may have the clarity to see the path where that might lead. 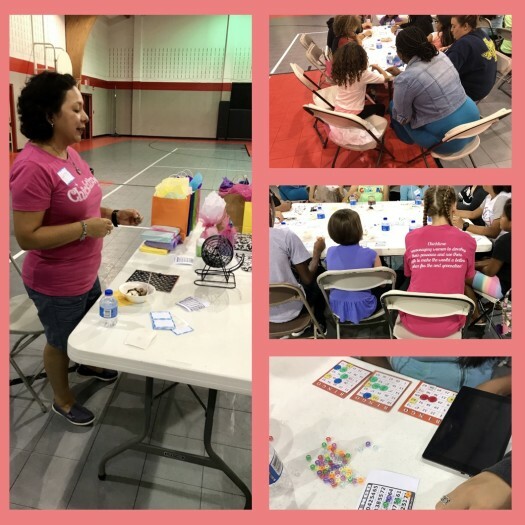 We were once again blessed to have Rachel Poe leading our Chicktime activity this month. Rachel has been working toward her Girl Scout Gold Star award. 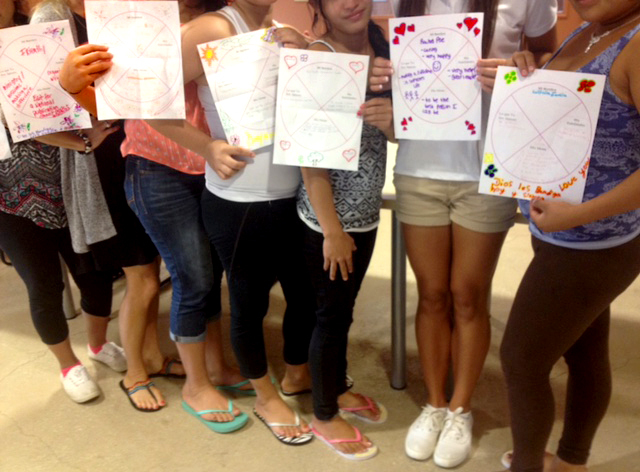 She chose to work on her project with the girls at Casa de Milagros and presented a program on self-esteem. The girls started out by looking in the mirror and then made a name tag that contained all of the qualities they didn’t like about themselves. They then tore up the name tags and threw them away. Rachel told them the story of God changing Jacob’s name to Israel and talked to the girls about how God created a unique and special name for each and every one and that when they look in the mirror they should look for their good qualities. The girls discussed what they like about each other and then made new name tags with their special qualities. 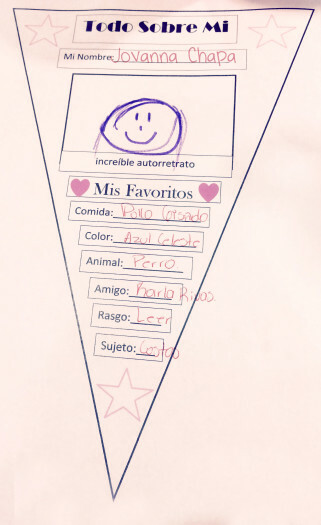 Each girl created her own shield with pictures and descriptions of goals, abilities and what they would be famous for one day. They each shared their unique qualities and dreams with each other. One is a good singer, one studies hard, and one is a good soccer player. One dreams of being a chef, one a beautician, and they all want to be good mothers. Rachel also showed some videos and played some upbeat music for everyone to enjoy. It was amazing seeing the girls’ transition to positive thinking and dreaming big! Rachel brought along some friends to help with the babysitting and we all enjoyed playing and dancing with 5 little babies! We wish Rachel well as she completes her project and hope she comes back again. My name is Rachel Poe and I am a senior at Johnson High School working on my Gold Project for girl scouts. 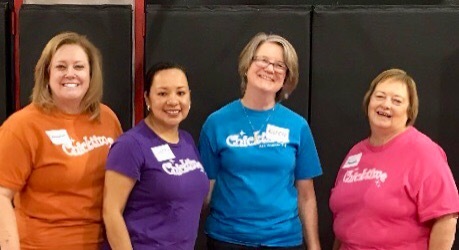 My project idea led me to Chicktime San Antonio who helped line me up to lead Chicktime San Antonio’s June’s activity. 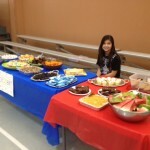 It was held on June 26th with goal of teaching self-esteem. We started out with a prayer, thanking our Lord for the time we were able to share together and then we all took turns introducing ourselves. The presentation began with the word “self-esteem” giving them a formal definition and my definition. 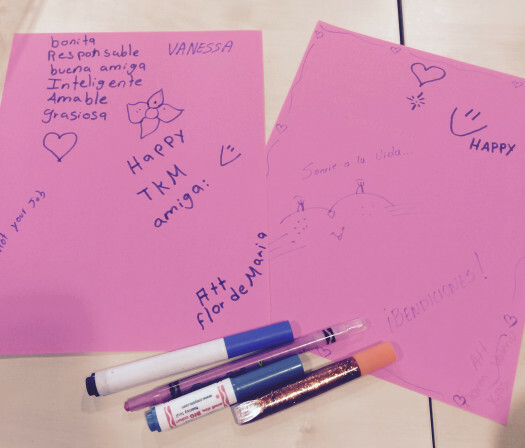 Then we all participated in our first activity, which gave each girl an opportunity to write one positive quality that she had that made her feel special and unique. We all took turns sharing our quality to the group. I played an animated clip for the girls illustrating the idea that life is easier when you have someone you can lean on. After the video, we participated in another activity, where the girls gathered in a circle, taking turns sharing positive qualities and traits about each other. The person sitting to the right of each girl, would write all the positive characteristics that were being said about that one individual. One girl was so uplifted by her qualities shared by her peers, she sang for the entire group. After each girl had a turn, I shared a personal experience I had, when I struggled with self esteem. I told the girls not to let other people influence how they should view themselves. If a group of people don’t accept you for who you are, become friends with others who will. 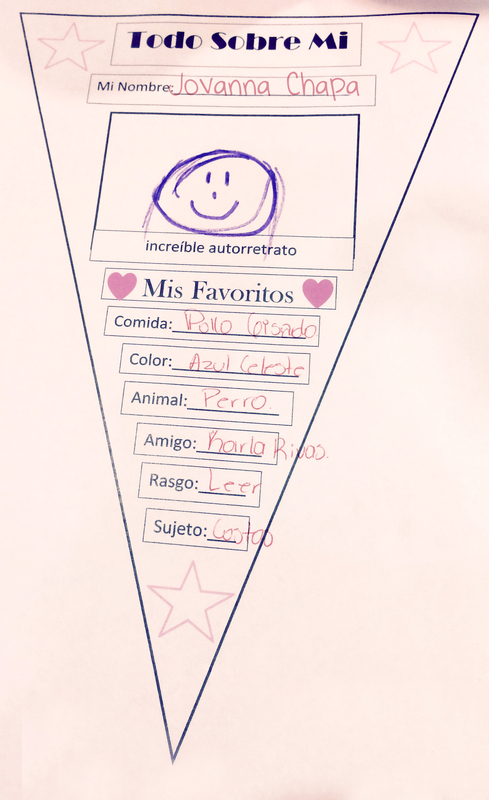 I finished off the evening with a worksheet that I created for the girls that was an “all about me(them)” activity, where they had the opportunity to draw a picture of themselves and fill out blanks that were all about them. While the girls finished up the worksheets, we closed with cookies and lemonade. Reminding the girls, one last time, how important each one is and not to let anybody else tell them otherwise. I would like to thank Setan home, Casa de Milagros, and Chicktime San Antonio for allowing my Gold award project possible. Thank you Rachel for blessing the girls at Casa Del Milagros! We look forward to next month! Currently, Casa de Milagros is experiencing a very low number of residents in its program. Because of this, we have not been in need of as many volunteers to help with monthly activities. We have a Girl Scout that is currently working on her Gold Star and will be planning and leading Chicktime activities for the summer months and we currently have plenty of volunteers to help. Because of this, we are currently suspending our requests for volunteers. 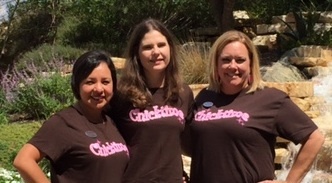 Chicktime San Antonio wishes you a blessed and safe summer and we will see you in September! We will let all of you know if any additional volunteer opportunities arise at Seton Home/Casa de Milagros. The St. Padre Pio Spanish ACTS ladies knew that the number of residents would be low this month, but that did not deter their attendance and enthusiasm. In fact, when we showed up that morning, the girls seemed so happy to have company on this rainy morning, and participate in the crafts we brought. We started the day with prayer, thanking our Lord for our time together and asking Him to be present with the girls so they could feel His love. 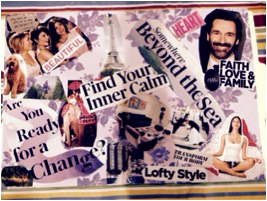 The first activity was a ‘dream collage’, and all girls (young and mature) enjoyed flipping through the magazines, finding their inspirational quotes, sharing their dreams, and enjoying listening to the others’ dreams. Secondly, we made picture frames using popsicle sticks. The girls were very inspired and each wanted to display the sonograms of the babies that were growing in their tummies. They also decorated their frames with spiritual images, and wanted to create different things. They were so happy that we left the extra supplies so they could continue playing and crafting the rest of the day. Additionally, they enjoyed the magic of blackboard art, and were surprised to see the rainbow colors appear when they scraped the black paper with a stick. We learned of the peaks and mountains of their countries, and they also carved prayers and their family names. The day could not be complete without a treat. 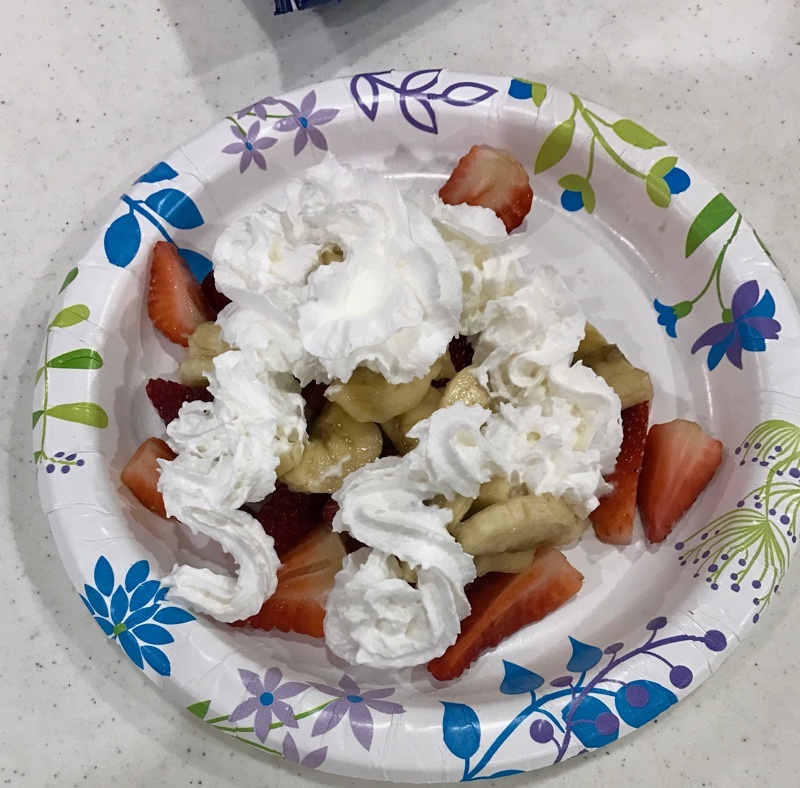 We all enjoyed banana splits with plenty of toppings and whipped cream. This visit gave us the opportunity to share the C (Community) and S (Service) in the ACTS movement, and served as a mini-reunion where we also reconnected and caught up. 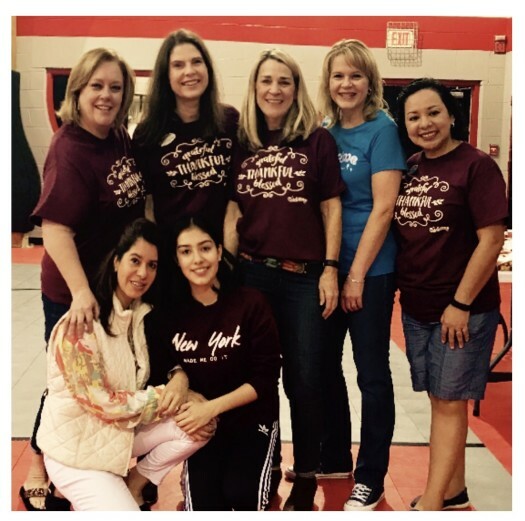 Thanks St. Padre Pio Spanish ACTS ladies for your service, and your enthusiasm to lead another activity in July. We are in need of volunteers to host activities in July, August, September and October. Please let us know if you have a talent you would like to share. We got to practice our artistic skills with our April 18th activity! 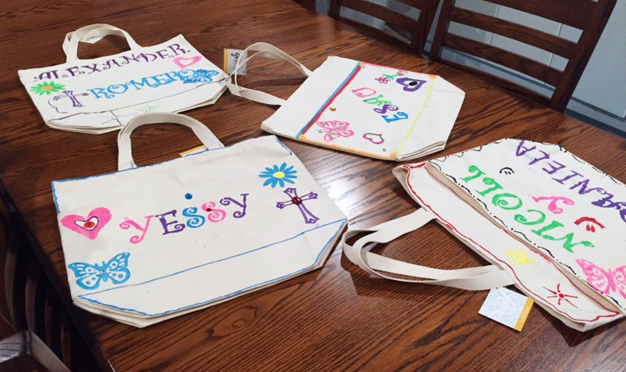 We had a group of 6 girls at Casa de Milagros who enjoyed a morning of painting canvas tote bags. They stamped, stenciled, brushed and added bling to their large totes. One thing we have learned is that (for them) MORE IS BETTER! They love a mixture of bright colors, lots of flowers, hearts & crosses, and as much bling as possible. It was fun to watch them diligently work on their projects in quiet concentration. And, they were so proud of their creations. They enjoyed a break to snack on homemade blueberry muffins. And, we thank Kelly & Katherine Hoog for providing babysitting services for a very active toddler boy and a darling little baby girl. It is mornings like these when we are reminded of all of the blessings that the Lord has bestowed upon us. It often makes our lives seem so easy compared to these girls that are often in desperate situations hundreds of miles from family and friends. We are there to show them that they are not anonymous and they are not forgotten. For they have us Chicks to encourage them and cheer them on. 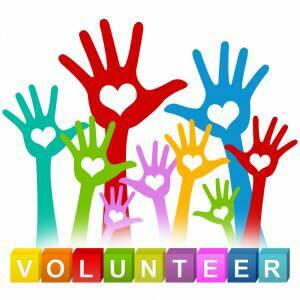 We are in need of volunteers to host activities in April, July, August, September and October. Please let us know if you have a talent you would like to share. 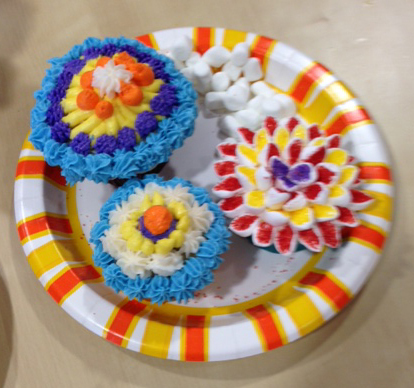 Once again, Kelly Hoog taught a cake decorating class for the third year in a row. 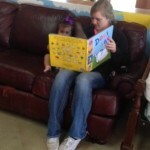 This has been one of the favorite activities of the girls at Casa de Milagros! 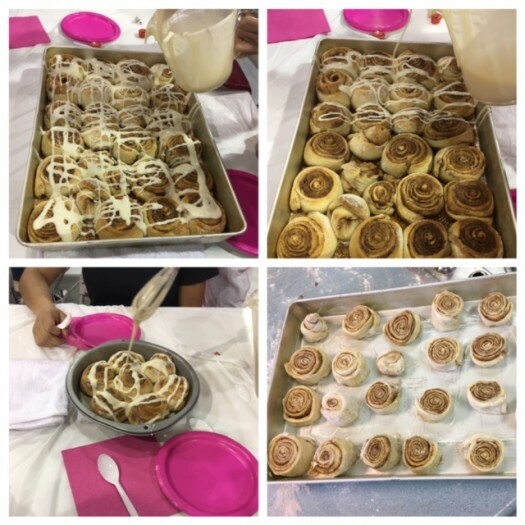 They learned how to properly ice a cake, how to pipe on a border, make flowers, write with frosting, and even got to cut shapes out of fondant. We were all impressed with Kelly’s skills and you can see from the pictures that the girls really learned a lot of great lessons. This might be a skill that will come in handy for them one day! 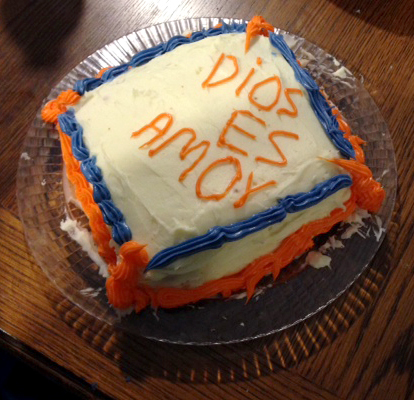 One of the girls that was particularly skilled said she used to watch her mom decorate cakes. While we can’t replace her mom, we hope that by spending a couple of hours with her, we can let her know that she is loved and cared for while she is hundreds of miles from home. 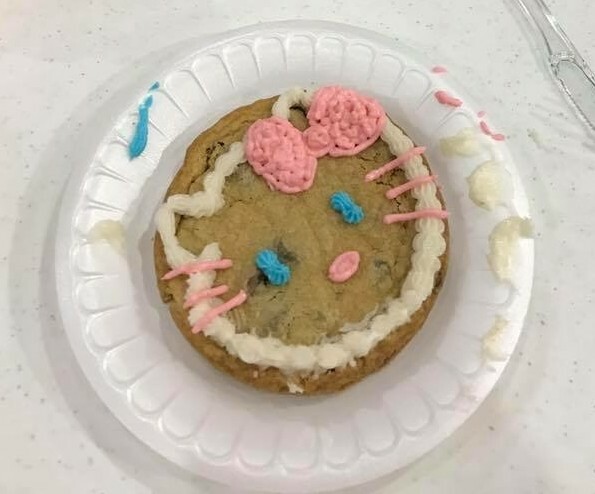 While the girls were working on their cake decorating, our teen volunteers played Easter Bunny and hid eggs all over inside the cottage and babysat the little ones. As many of the girls are from Central America, they were not familiar with Easter egg hunts. They quickly learned that it is loads of fun to hunt for eggs filled with candy and trinkets as they ran around trying to gather as many eggs as possible. The girls’ competitive spirits came out and they were no longer shy! Once again, the Concordia Lutheran Middle School Cheerleaders came through and donated tons of filled eggs for this fun activity. They also made homemade decorated flip flops for each of the girls and stuffed darling goody bags with cute socks and hair accessories. They are such angels for always preparing very thoughtful treats for the girls! 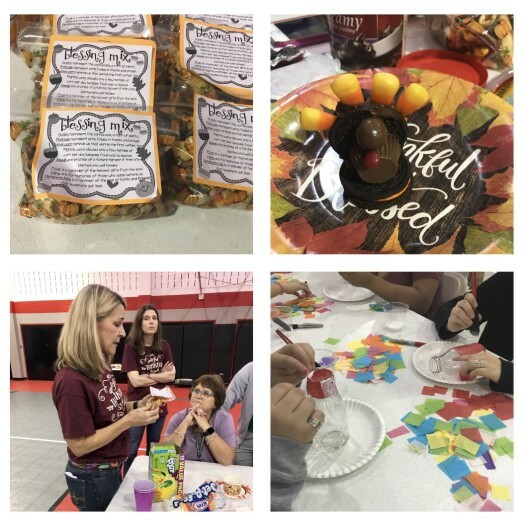 We are most grateful to Kelly Hoog (along with daughters Jillian & Katherine) for sharing her cake decorating talent and providing the supplies for this fun activity. And, we are SO appreciative for the generosity of the cheerleaders from Concordia Lutheran Middle School. Without you all, Chicktime could not exist. 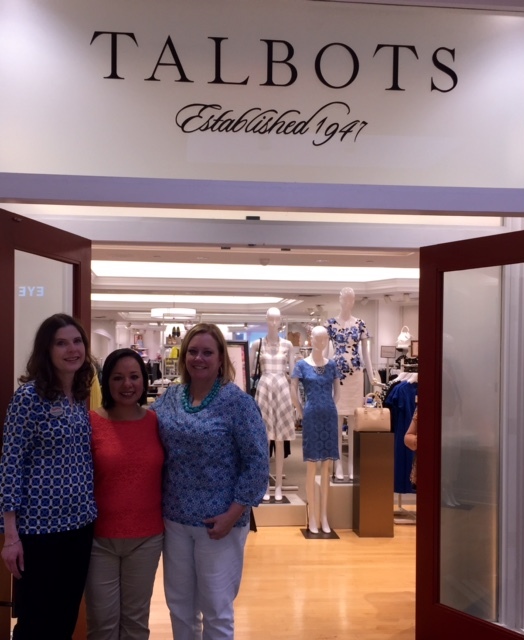 We want to thank all of you who came out and supported our fundraiser at Talbots North Star Mall on March 23rd. Because of your shopping purchases, we were able to raise funds to support upcoming special activities at Casa de Milagros. 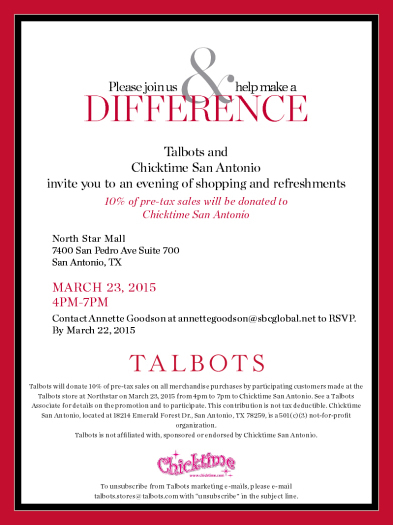 Thank you to Talbots for giving us this wonderful opportunity to both raise money and create awareness for the work that Chicktime San Antonio does in the community. A special thank you goes out to Phyllis Ellison, Talbots store manager, who presented this opportunity to us and coordinated the entire event. She was amazing to work with. On Monday, December 22nd, Seton Home will be hosting a Santa’s Workshop for the residents at Casa de Milagros. During this evening, the girls will have the opportunity to shop for gifts for their babies and do some wrapping. 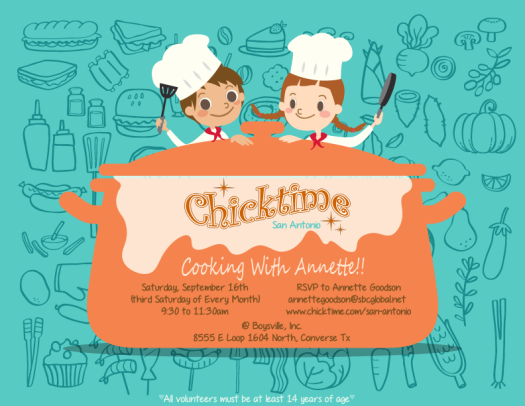 Chicktime is hosting the refreshments for this event. We are looking for volunteers to make cookies and also volunteers to attend, help setup, and serve refreshments or babysit. 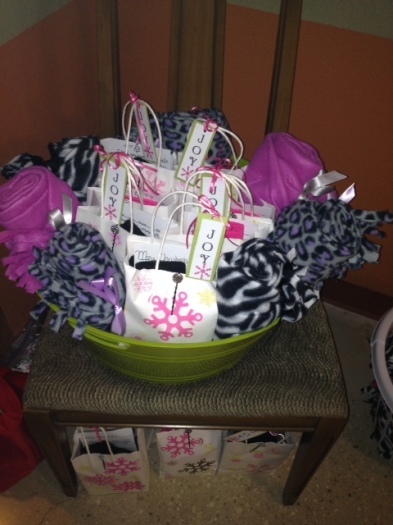 Chicktime will also be presenting the girls with diaper bags for Christmas! Setup will be at 5:00 and the event starts at 5:30 PM. We will be meeting in the Family Life Center at Seton Home, 1115 Mission Road, San Antonio, TX. We are in need of volunteers to lead activities in 2014! Are you passionate about crafts, cooking or baking, photography, or playing an instrument? Chicktime needs you! Think of the difference you can make in the lives of teen girls. We promise you will gain more from the experience than you give. 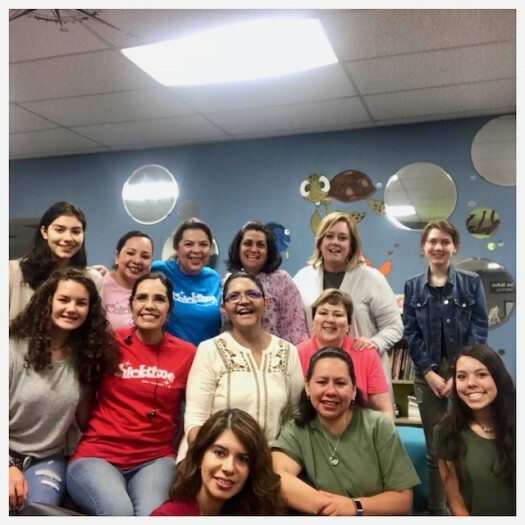 This month Chicktime San Antonio did something a little different from the normal monthly activity with the girls at Casa Del Milagros. 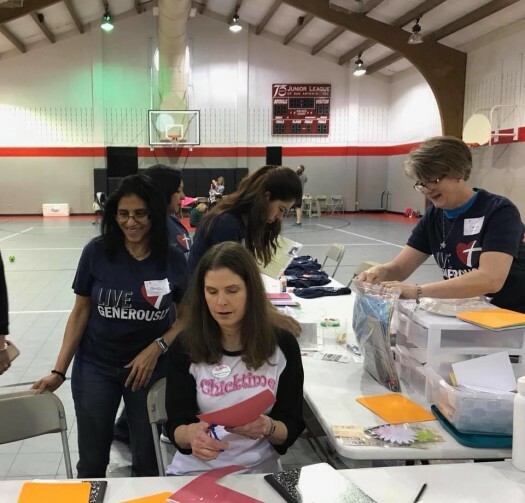 Every month, chapter leaders are charged with finding someone to be a monthly leader and bring their passion or hobby to share as a gift of encouragement and love to the teens living in this emergency shelter. We give thanks for the opportunity to serve God this way. 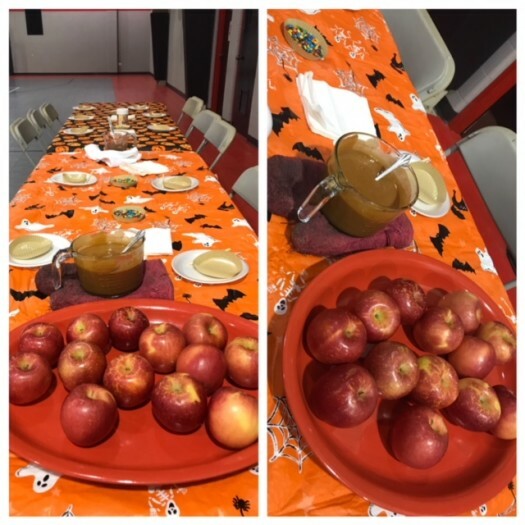 This month we were asked to join the staff and teens in a potluck Thanksgiving meal and party as a way for them to thank us for being reliable servants and for supporting the work done at this beautiful place. It was a festive evening and a joy to watch weekend staff mingle with weekday/weeknight staff. Administrators and Directors letting their hair down and taking in what this time of year reminds us to do… Be thankful. 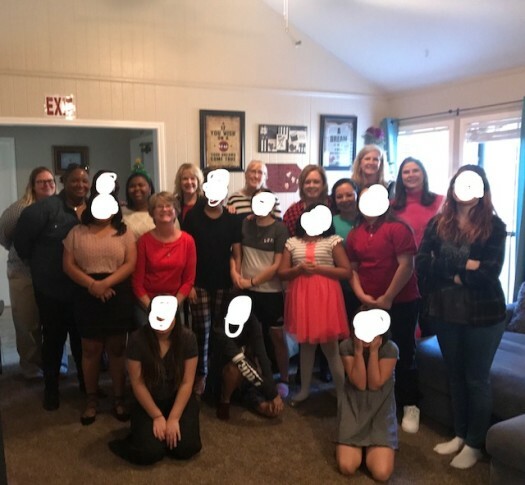 The most remarkable thing was to watch the teen girls sitting around the beautifully decorated tables laughing and visiting just like the rest of us and for those few hours be able to escape the memory of what actually brought them to the shelter in the first place. It was then and there we were reminded the beauty of Chicktime. We offer that safety every month for these precious children, if only for a few hours on a Saturday morning. AMEN! So today, Chicktime San Antonio, be reminded that our work is sacred. 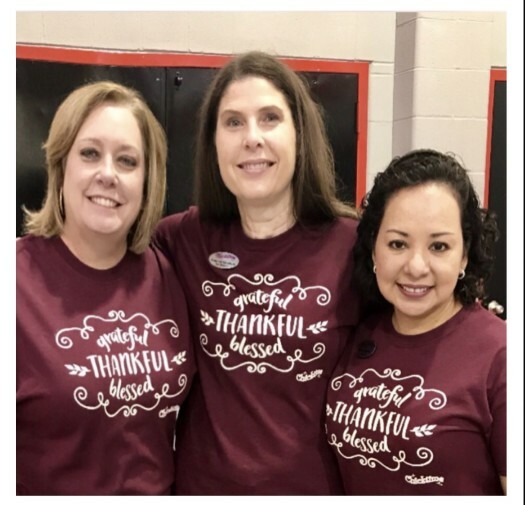 Our work is appreciated and our work is necessary–and please know the leadership team is thankful for you, but most importantly, the girls and staff at Casa Del Milagros are thankful for you. Be on the lookout for information about our November/December events. The Chapter Leaders will be putting these together and sending out details soon. 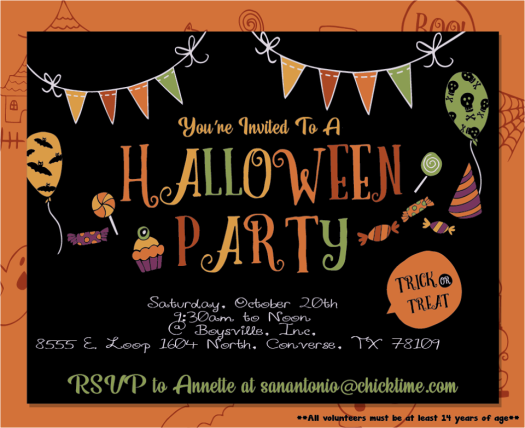 Chicktime San Antonio had a Spooktacular time this month at Casa De Milagros. 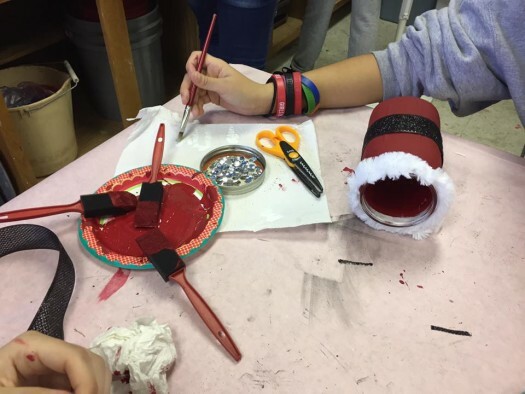 Sixteen year old, Tori Tyler, and three of her best friends (Maya Gudowski, Emily Schaefer, and Kaitlin Eltiste) welcomed the teen girls to their Halloween-themed morning and quickly began making crafts to decorate the residents’ rooms! 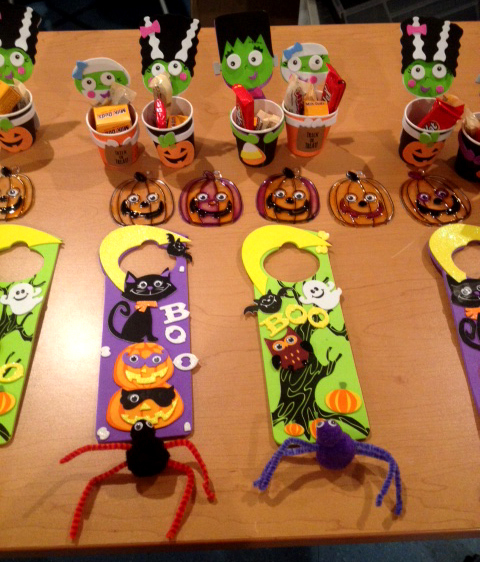 It was hard to tell which craft the girls liked best as they dove right into making Frankenstein/Mummy candy holders, cotton ball spiders, pumpkin sun catchers and spooky door hangers. To carry out the theme further, the refreshments were all orange! Cheetos, pumpkin cookies, orange iced brownies, Cuties, and Orange Crush to drink. As we held hands in a circle to pray and say our goodbyes, it was obvious that the Holy Spirit was present and HIS work was done this morning. Girls who were taken out of extreme living situations were relaxed and laughing. Such a GOD thing. Our November activity will be a Thanksgiving feast hosted by our leaders. You will soon be receiving additional information on ways you can help with this as well as our holiday gift to the girls at Casa de Milagros. We are also in need of leaders to host a month next year. The activities can be simple and don’t require that you spend a lot of money. It is always best if you choose something YOU are passionate about. But, if you would like to host and are unsure of an activity, just contact us and we can give you some ideas about what’s worked in the past. Bring plenty of friends to help you with the activity and it would be great if you and your group could bring a simple snack as well. 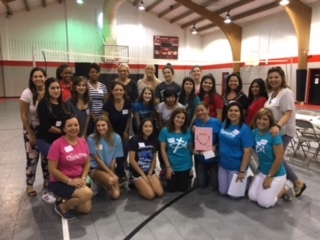 We were blessed to have the Ladies Faith Sharing Group from Shrine of St. Padre Pio come out to host the activity. 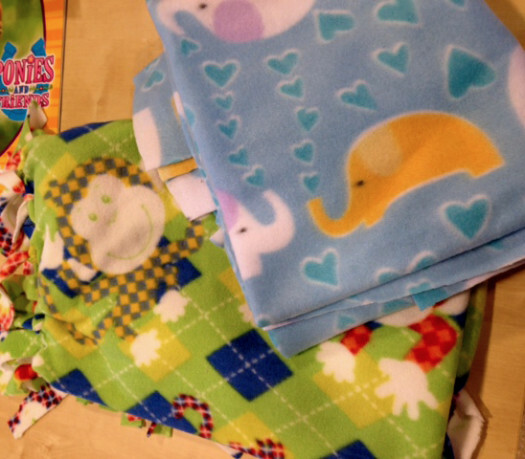 They brought adorable fleece fabric and helped the girls at Casa de Milagros make baby blankets. The teens were very proud of their work at the end of the morning. 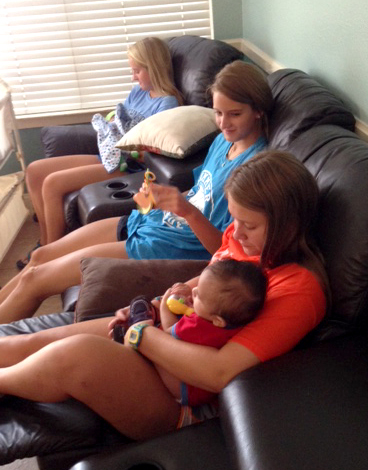 We also had some wonderful volunteers to babysit. The little ones kept us busy on the playground, but they were so much fun to play with! Once the activity was finished, the toddlers came in and joined their moms for some ice cream cones and banana splits. After they finished eating, they spent some time coloring with mom in their new giant coloring books provided by the leaders. 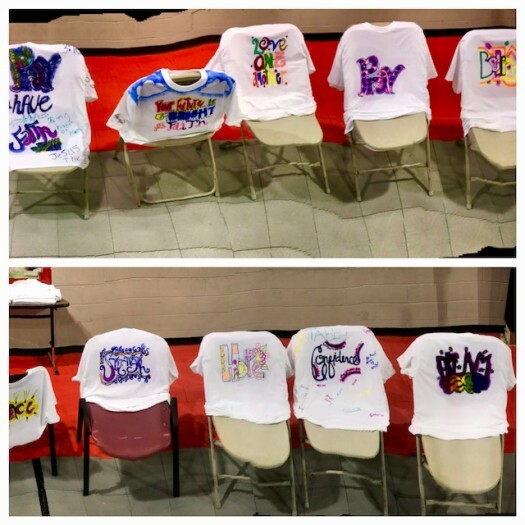 I think the teens enjoyed the coloring as much as the little kids! 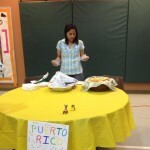 We especially want to thank Letty Rodela who coordinated the volunteers and acted as our interpreter. 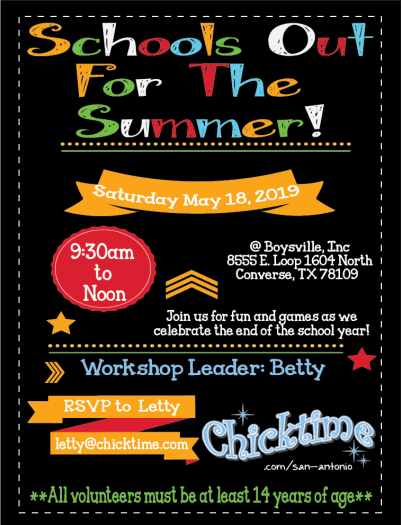 Letty, we are so blessed and grateful for your ongoing support of Chicktime. 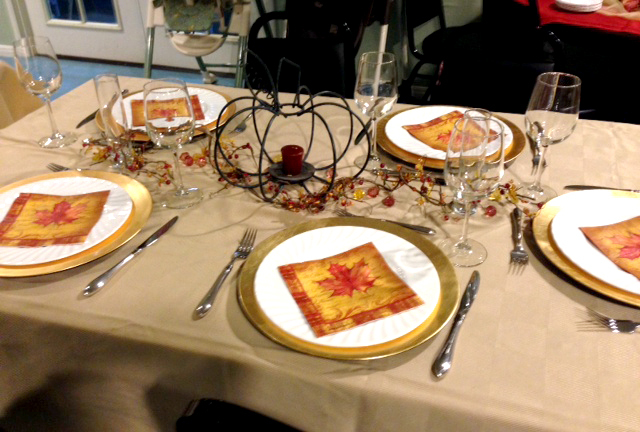 October 18th – Open – Would you like to host this month? Looking for volunteers to lead next year! What a fabulous time we all had on Saturday, August 16th, with our friends at Casa de Milagros. 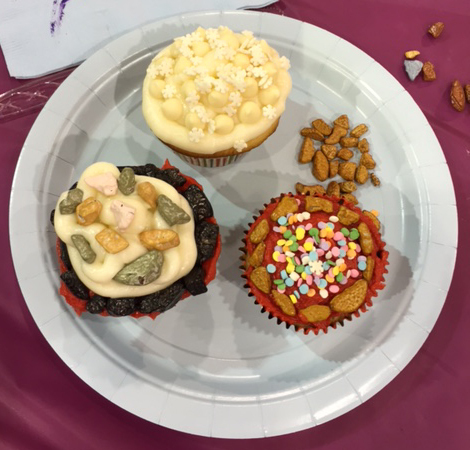 Everyone had a great time learning to decorate cupcakes. Kelly Hoog was our monthly leader along with her lovely 2 assistants, daughters Jillian and Katherine. Kelly brought pastry bags, decorating tips, a rainbow of frosting colors, and some fondant that was cut into shapes. 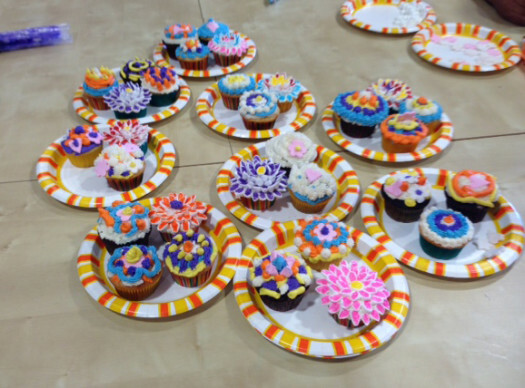 The girls learned to pipe frosting with their pastry bags and created some masterpiece cupcakes. They were incredibly creative! 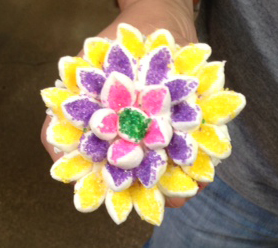 There was also another station where they made marshmallow flower cupcakes with scissors and colored sugar. There were plenty of smiles to go around and the girls loved snacking on the sweet treats, too. 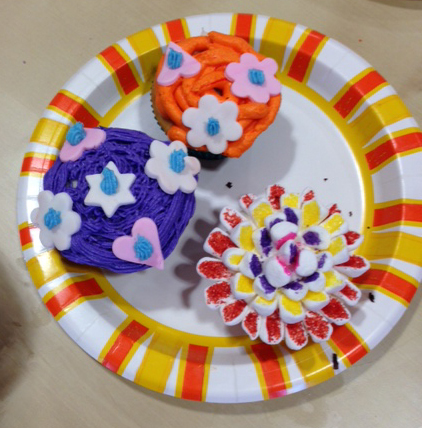 They also enjoyed the fact that they got to give back by making pretty cupcakes for the staff and volunteers. We want to thank Kelly for volunteering her resources and time to lead this activity. We are also appreciative of our new volunteers, Cameron and Sarah from Clark High School, as well as our regular faithful volunteers. You are the hands and feet of Jesus! 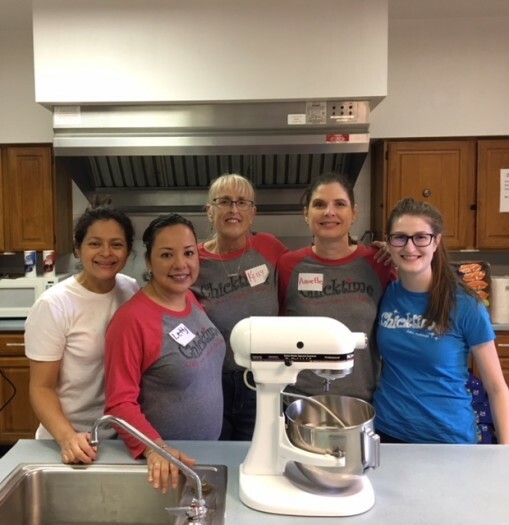 We are also very grateful to the Seton Home staff for allowing us the opportunity to serve the girls at Casa de Milagros. They are always very accommodating and never fail to greet us with friendly smiles. 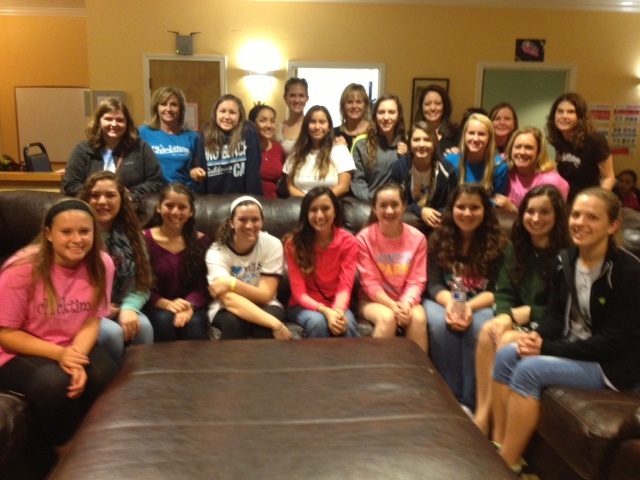 A new chapter of Chicktime has been formed to serve St. PJ’s Children’s Home. 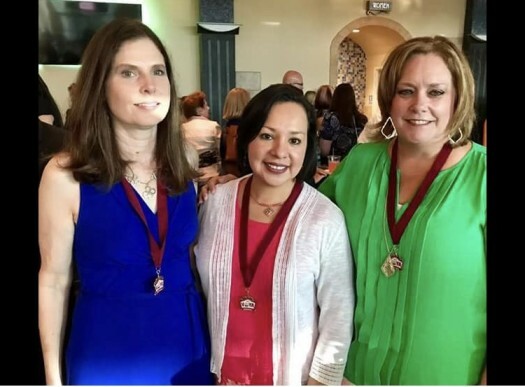 Chicktime-SA Central will be led by Dawn Gayden and Mary Young. Their inaugural event, a back to school Zumba dance party, will be held on Saturday, August 23rd, from 9:00 am to 12 pm at St. PJ’s Children’s Home. 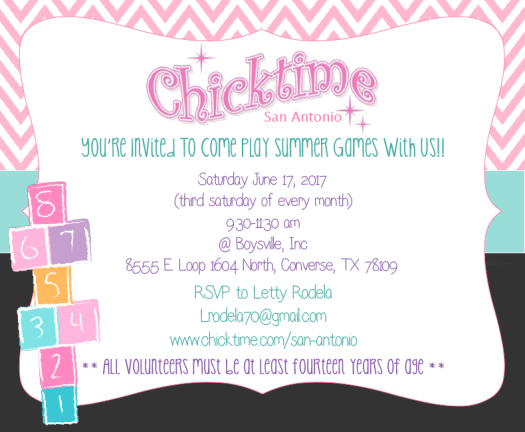 If you would like more information about Chicktime-SA Central or this event, please send an email to chicktimesacentral@gmail.com. 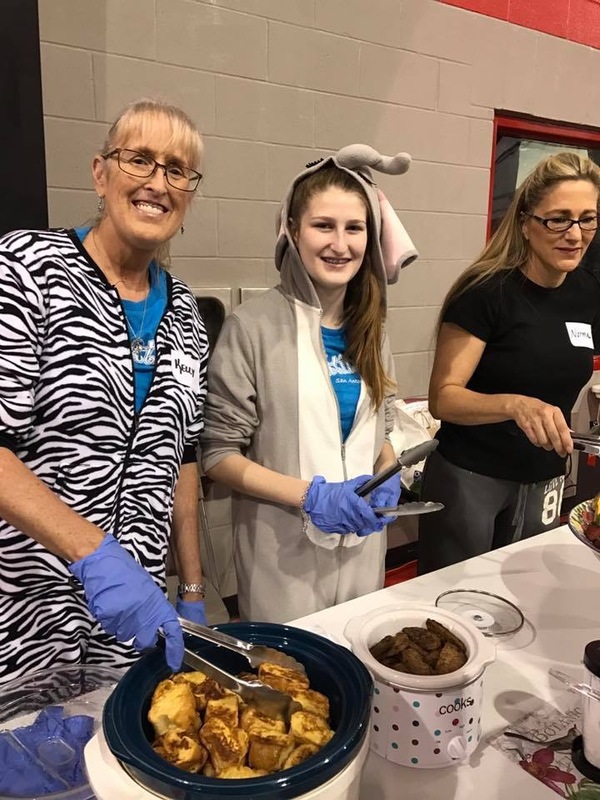 If you are interested in volunteering at Seton Home for more than just Chicktime events, you may now sign up to receive invitations to other volunteer opportunities through United Way’s Get Connected social platform. “Fan” Seton Home and you will receive email updates when new information is posted. On Saturday, July 19th, we had an upbeat and energetic morning at Casa de Milagros as a large group of teen girls from Heather Stolle’s Dance Studio put on a dance clinic. God gave all of these beautiful girls amazing talent and, better yet, kind hearts to share with other girls who are deeply in need of love and the knowledge that someone out there cares enough to spend time with them. They learned many dance moves to the latest pop tunes. And then, amazingly, several of the girls from Casa de Milagros decided they wanted to teach our teen volunteers popular dances from their home countries. It was an amazing cultural experience that the girls could come together and have such a great time learning from each other even though they didn’t speak the same language. 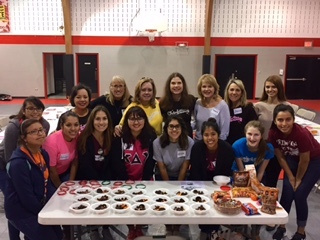 At the end, there were plenty of smiles to go around as they snacked on kabobs made of fruit, brownie bites, and marshmallows—YUM! 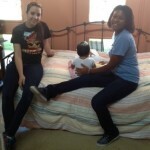 We also had a group of volunteers that babysat the toddlers and some infants. We especially had fun rocking a couple of newborns. What precious little angels they were! 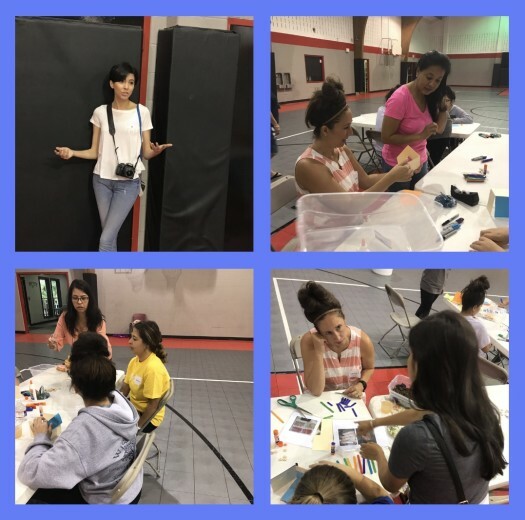 Special appreciation goes out to Sharlene Eckhardt for coordinating this activity and for all the teen girls and their moms that showed up to volunteer. July 19th – Join Charlene Eckhardt and dancers from Heather Stolle’s dance studio as they come out and lead the women in an activity. Have you ever been so overwhelmed by God’s goodness that you couldn’t stop smiling? This is how the leadership of Chicktime San Antonio felt as we drove away from our June activity. 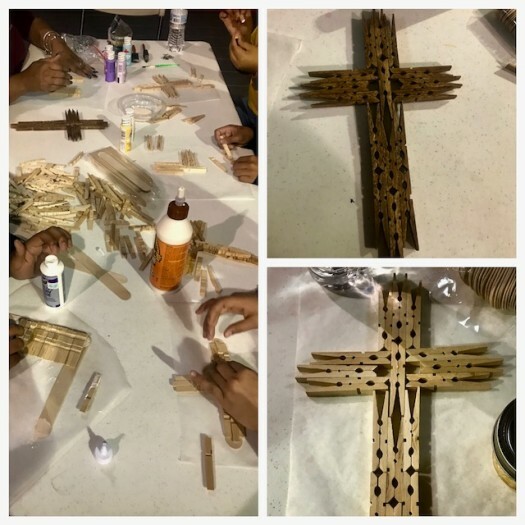 Thanks to our monthly leaders, Mary Young and Dawn Gayden for showing the beautiful women of Casa De Milagros Emergency Shelter how to make their own wall hanging crucifixes out of rulers and clothes pins. 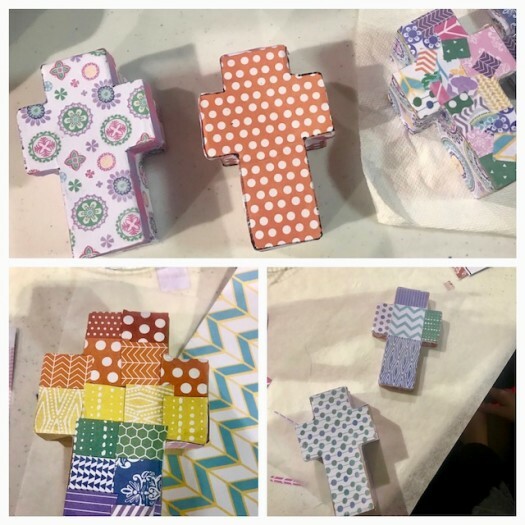 Such unusual materials to create such an awesome reminder to those present that they are loved by the Chicktime ladies in San Antonio, but even better by our Father in heaven! The women of this shelter have left extreme poverty and situations that we may never understand and it was truly God’s work to watch them let their guards down and smile and visit with each other and with the volunteers. Fruit kabobs, fruit salads and Jello molds made for a lite and refreshing snack for the girls. 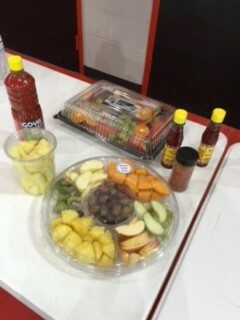 The girls had their choice of chocolate dip or chili powder to drench the fruit in….some chose both. We wrapped up our time together by having the volunteers lay hands over the girls as they sat around a large table area. A blessing and prayer was said over them and prayer requests were taken from the young women who are away from their home and families. As the girls left, the volunteers gathered in a circle and specifically prayed for the requests of the women and we were also able to pray over our monthly leaders who will be starting a new Chicktime Chapter at St. PJ’s. Thank you Jesus for people who want to share Your love and grace and give others hope. Special thanks to Jeanne Schafer for leading the teens who came to babysit the babies and toddlers so their moms could have some respite time. Jeanne always comes with outstretched arms to love God’s children. 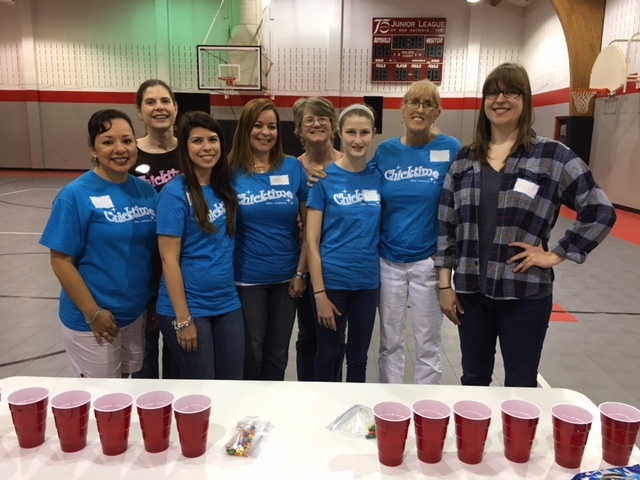 We want to thank those volunteers that showed up on Friday, June 20th, to help with babysitting the infants and toddlers so that their moms could take part in the graduation festivities at Seton Home. We had a good time playing and feeding the little ones their dinners. What a bunch of little cuties! God is a God of ALL people. May we never lose sight of that! 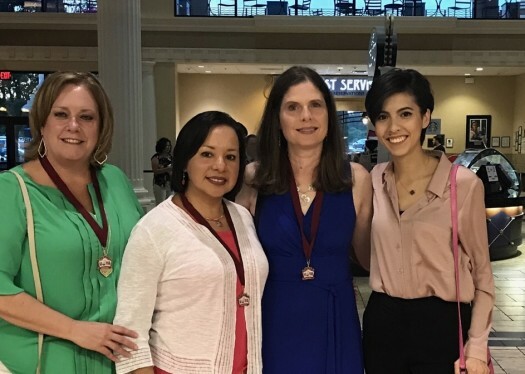 June 11th – Seton Home is looking for volunteers to help with the HEB Tournament of Champions “Hole in One” Competition which is a big supporter of Seton Home’s education program for teens. You may select the 7:30 am – 12:30 pm shift or the 1:30 pm – 6:30 pm shift. It will be held at various golf courses throughout San Antonio. It requires standing, light walking, and some bending. Meals and refreshments will be provided. Volunteers may be male or female and must be at least 18 years of age. If you are interested, contact Kari Schroeder at 210-533-3504 X245 or kschroeder@setonhomesa.org. June 20th – Seton Home needs a few volunteers to provide childcare assistance during their graduation ceremony from 5:30 – 7:00 PM. Volunteers must be at least 13 years of age. If you are interested, contact Annette Goodson at annettegoodson@sbcglobal.net. 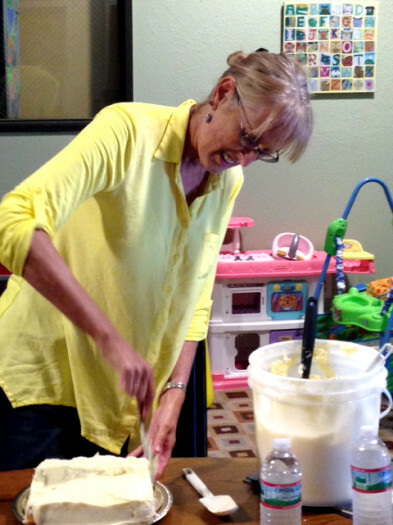 June 21st – Our next activity at Casa de Milagros will be hosted by Mary Young. 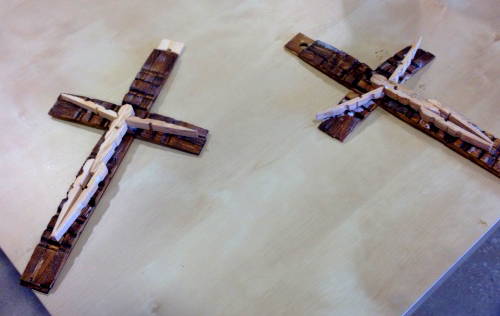 The girls will be making clothespin crosses. We need volunteers to help with the activity and some to babysit. Spanish translators are especially needed. Volunteers must be female and at least 12 years of age. Setup is at 10:30 and the activity begins at 11:00. 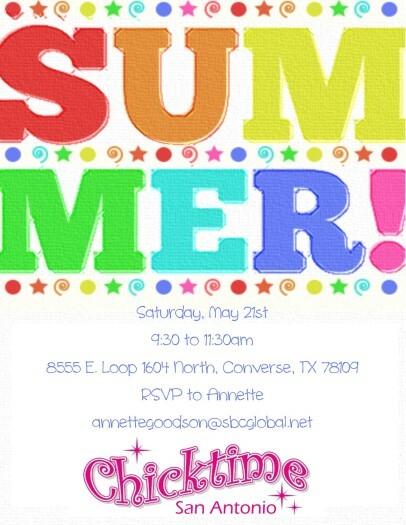 RSVP to Annette Goodson at annettegoodson@sbcglobal.net if you plan to attend. 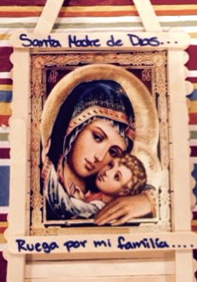 September 20th – Activity TBA hosted by Shrine of St. Padre Pio Spanish ACTS. Smiling teenage and adult volunteers gathered on a beautiful Saturday morning in May to work with the girls and babies of Casa de Milagros. The wonderful volunteers whisked the babies away for some fun in the sun while their moms learned different things to do with cookie cutters! We were blessed to work with 18 moms! We started out by making magnets out of craft foam. The girls used their cookie cutters to trace and cut out butterflies, rabbits, tulips, and flowers, then embellished them with colorful sequins and jewels. The final step was to attach a magnet on the back, perfect to hang up their toddler’s artwork! 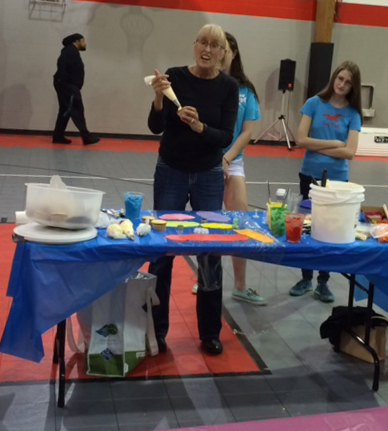 Next, they made homemade play dough, a recipe they can use with their own children one day! Finally, they made their own snacks by decorating sugar cookies that had been cut out with what else, but cookie cutters! They also used the cookie cutters to cut out turkey and cheese shaped sandwiches. It was hard to tell which activity the girls liked the best! One thing was for sure though, cookie cutters ruled that day in May! Each girl left with a set of cookie cutters to use with their children to create memories and have fun! 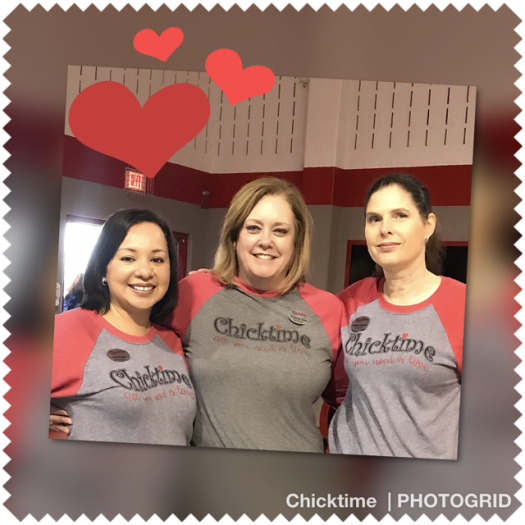 We are excited to announce the addition of a THIRD Chicktime chapter in San Antonio which will be known as Chicktime SA Central. The new chapter will be led by Dawn Gayden and co-leader Mary Young. They will serve the 38 resident young girls at St. PJ’s Home for Children on the 4th Saturday of every month 9am-12:00noon. 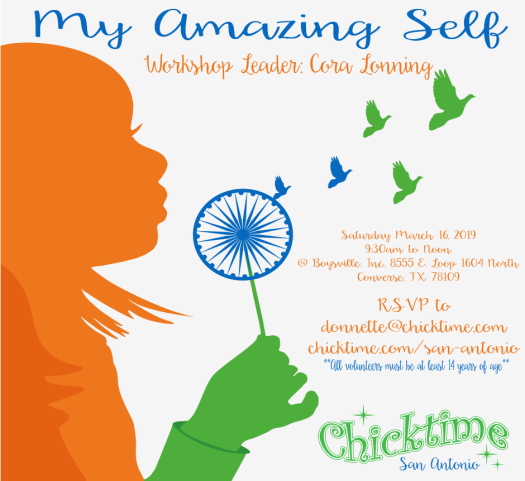 For more information, check out their website at http://www.chicktime.com/tx-san-antonio-central/about-our-chapter/. 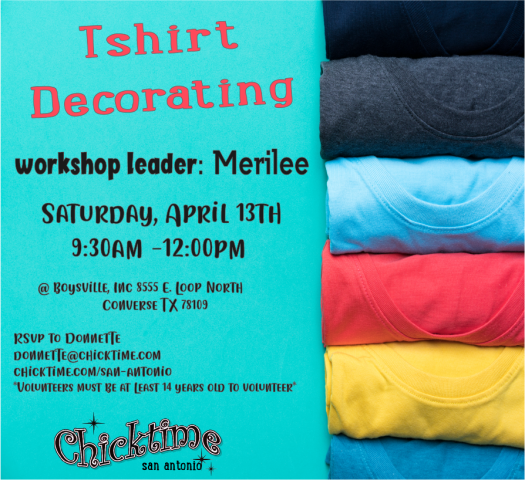 If you would like to join this chapter and begin receiving their invitations, please email Dawn at chicktimesacentral@gmail.com or join online http://www.webform.topbuildersolutions.net/chicktime.aspx. 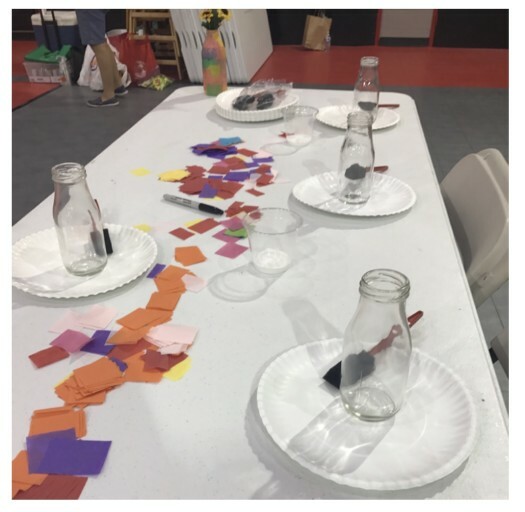 We hope you can join us next month for another fun craft with Jeanne Schaefer on May 17th! you can help with the craft or hold babies (or a little of both! 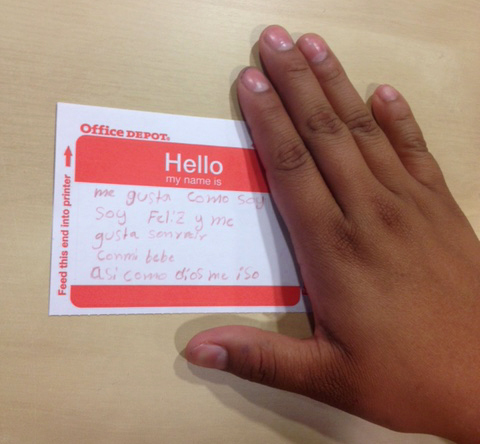 ), and if you also speak spanish, that is an added bonus because we always need an interpreter! April’s activity at Casa De Milagros was led by “Chicks” Colleen Douglas and her daughter Katherine. 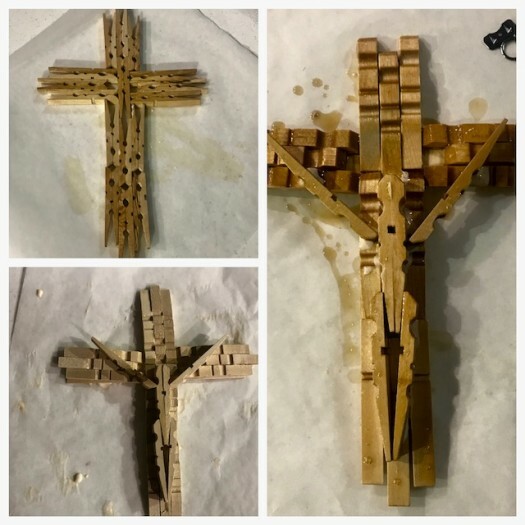 They brought wooden crosses of all sizes for the girls to paint and stack together for a three dimensional look. These Casa de Milagros girls absolutely love craft time, and they are so creative and expressive. I always love to see what they come up with each month. The crosses with all of their pastel pinks, purples, and yellows and the bright oranges, greens, and reds reminded me of the spanish term “De Colores” (the colors). These colors bring forth a bright, warm, sunny feeling as we realize that we are loved by God unconditionally. It is like the incredible experience of a rainbow! As always, our leaders could not do what they do without help from some trusty sidekicks. Anne Gabriel and her daughter, Alexandria were a huge help to Colleen. The moms worked with the girls and their cross craft while the daughters and several other wonderfully dependable “Chicks” held babies and/or chased toddlers on the playground. We had a fun treat with the new arrival of a two week old baby boy. Needless to say, he was very popular! After brownies and lemonade, it was time to wrap it up until next month. 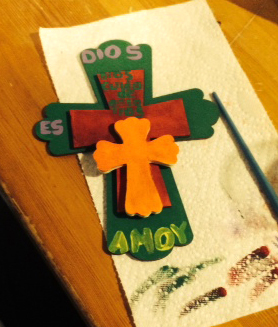 Please join us April 12th at Seton homes Casa de Milagros to paint some beautiful crosses. This months activity will be led by Colleen and Katherine Douglas. Set up will start at 10:30am and the event will start at 11am. In addition to volunteers to help with the activity, we will need a few babysitters to play with the babies and toddlers. We gathered on March 15th once again with our friends at Casa de Milagros. Our fabulous leaders were Laura Anderson and Letty Rodela. This month there were 15 teen girls and 5 young children living in the shelter. 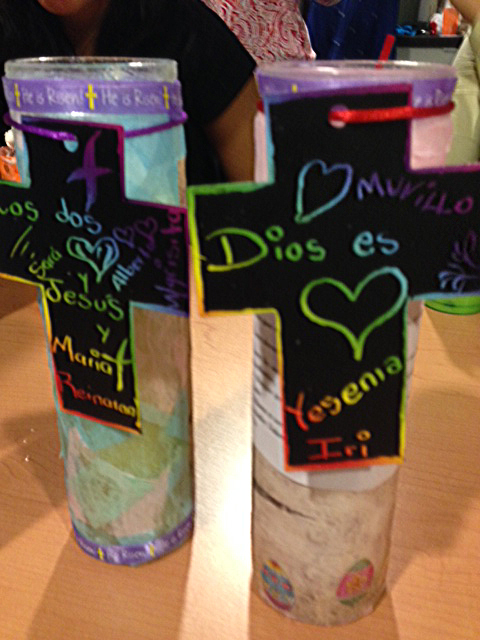 Laura and Letty brought all of the supplies to make prayer candles using tissue paper, mod podge and pretty ribbons. The girls were able to customize them with their own prayers and they were so proud of their creations. We were impressed by how spiritual all of the girls were. After the craft was finished, they made yogurt parfaits which they absolutely loved! Some had never experienced whipped cream from a can before. I think they all have a new-found love for this delicacy! Thank you Letty and Laura for giving these girls such a special day. 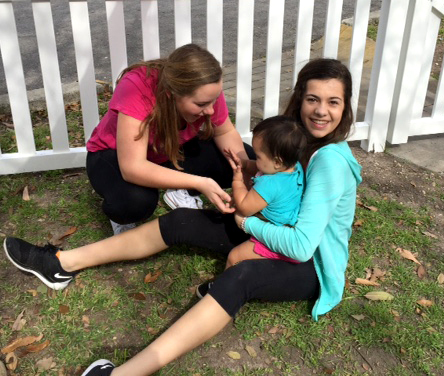 While the teens were working on their projects, a group of volunteers were playing on the playground with the toddlers and babies. Swinging, sliding, blowing bubbles and drawing with sidewalk chalk were on the agenda. The kids had a fabulous time and when we told them “bye”, one little girl grabbed us by the hand and said, “no”! It was hard to leave our new friends. Last month, we called on our volunteers to donate new or gently used formal and party attire for St. PJ’s. We were informed that the children were in need of clothing for prom, quinceaneras, and other special occasions. As a result, we were able to deliver 130 outfits consisting of formal dresses, cocktail dresses, party dresses, suits, dress shirts, ties, purses and shoes. 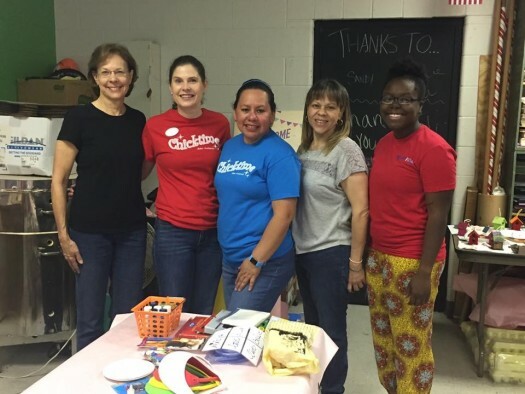 We want to thank our Chicktime volunteers for donating 40 outfits. And, we especially want to thank the accounting firm of ATKG, LLP for their “Flare to Spare” campaign which resulted in 90 outfits that they collected from their staff, clients and business affiliates. We really appreciate the efforts of Hayley Cornelius and Dee Bandy for putting together the advertising campaign and doing pick-ups. The staff at St. PJ’s was so amazed when we made the delivery. They couldn’t believe how beautiful all of the dresses were and how many of them we had. Because of all of the wonderful donations, the children at St. PJ’s will be able to feel like royalty at all of their upcoming events. If you are on our email list, you should have received a special letter from us this past month. As many of you know, we originally started our chapter at St. PJ’s Children’s Home. When the home underwent a reorganization last year, we began serving at Seton Home and eventually transitioned to Seton’s Casa de Milagros. Now that St. PJ’s has completed their reorganization, they would like a Chicktime chapter to sponsor activities there again. Because of our commitment at Casa de Milagros, we do not feel like we have the time to adequately serve two homes right now. Therefore, we are asking all of our volunteers to pray and consider whether they are called to lead a chapter at St. PJ’s. If you have questions or think you might be interested, we ask that you contact Chicktime founder, Lori Rhodes, at info@chicktime.com. She would be happy to help you and provide you with all of the training you need to get started. “Let us love one another, because love comes from God. Please join us on March 15th for our next event at Casa de Milagros at Seton Home. Letty Rodela and Laura Anderson will be hosting some craft activities. Setup will be at 10:30 and the activity start time will be 11:00. 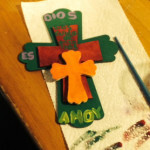 In February the Chicks gathered at Casa de Milagros for a fun craft. Volunteer Chelsea Smith led the activity, teaching the girls how to make flower pens out of duct tape. Seli Compton served as the Spanish interpreter to relay the instructions to the girls. There were many varieties of tape to choose from, varying from zebra print to pastel florals. The girls were very creative in their selections and enjoyed assembling the pens and displaying their beautiful “bouquet” of results. Meanwhile, the teen volunteers accompanied the children to the playground to enjoy a beautiful sunny morning outdoors. Swinging, sliding, kicking the soccer ball, and riding in the buggy were some of the favorite activities. Come join us next month at Casa De Milagros. 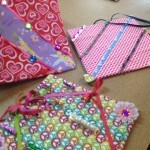 More craft time is on the agenda and this time it’s centered around Valentines Day! 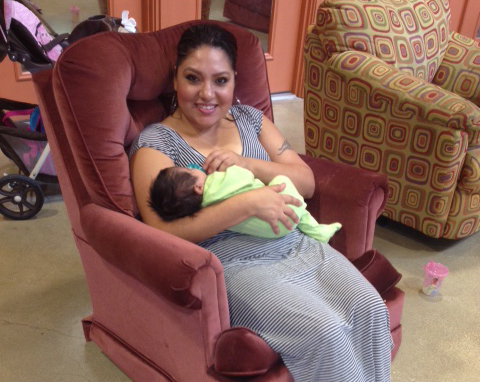 Chicktime San Antonio was blessed to get to hang out with the moms and babies once again at Seton Home’s new emergency shelter, Casa de Milagros. The moms were divided up and half went to our “cooking” station and the other half went to the “craft” station. 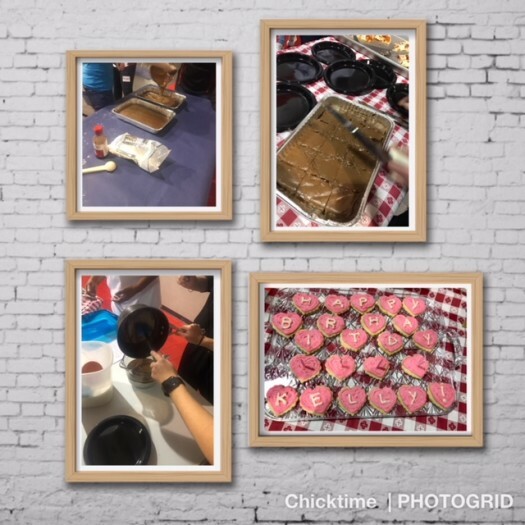 The cooking station was led by Annette Goodson, who taught the girls how to make their own hot cocoa and homemade Chex~mix. Annette let the girls sample what they learned to make that day and had containers to allow the girls to take “home” what they made so they enjoy it later. 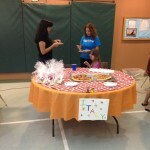 Tori Tyler, one of our teenage chicks led the craft table. She brought piles and piles of colored thread along to teach the girls how to make friendship bracelets. The bracelets were such a hit that Tori donated her supplies to Casa De Milagros so the girls could continue to make bracelets on their own time. Once the girls were done at one station they rotated to the other station. Our fabulous volunteers worked along side of them. In God’s perfect plan, we had two volunteers present that spoke fluent Spanish, allowing us to communicate with the moms. Praise God. 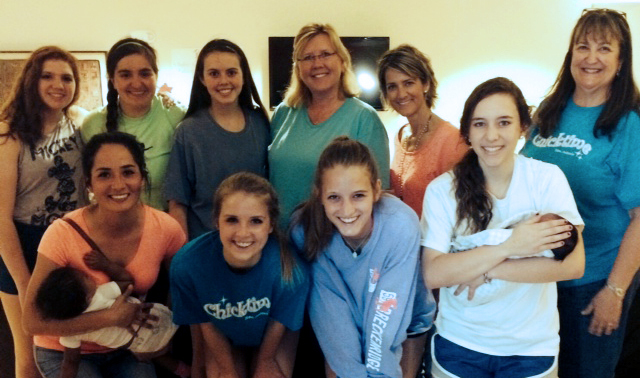 So the moms could enjoy this downtime, our Chicktime gals babysat. The weather was beautiful and allowed us to take the toddlers and one infant outside. 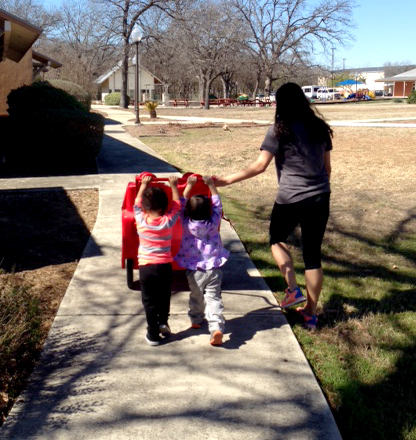 The children were walked in the bye-bye stroller, pushed on a swing and even a little soccer was played. Whew! We give thanks for the volunteers with lots of energy to help do this part of our ministry. Cookies and punch were the donated, and devoured, refreshments! “In everything I did, I showed you that by this kind of hard work we must help the weak, remembering the words the Lord Jesus himself said: It is more blessed to give than to receive. Happy New Year to all of you Chicks! We hope you had a Merry Christmas and we want to thank you for all of your support during 2013. 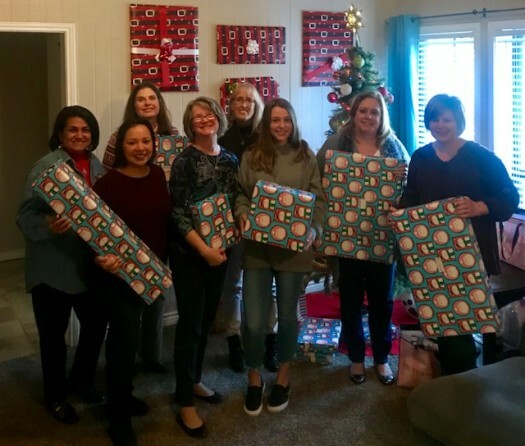 While we did not host a Chicktime activity in December, we were able to deliver Christmas presents to the girls at Casa de Milagros—thanks to all of you that contributed financially to enable us to make this happen! The girls each received a very cute and colorful rolling carry-on bag for their travels as they leave the shelter and journey to their next destination in life. They were so excited when they saw the bags. The girls are most grateful for anything they receive. 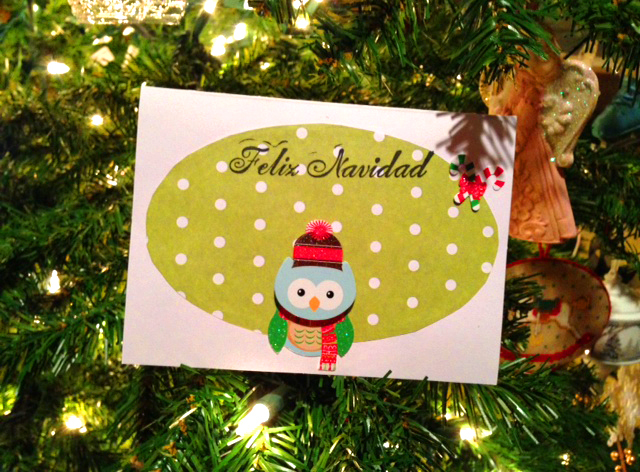 We also want to thank the wonderful ladies who made the most beautiful hand-made Spanish Christmas cards. They were so special. The girls are beginning to become more comfortable and familiar with us. As we snacked on a tray of Christmas goodies, we talked and had lots of laughs. We want to convey a message of love–whether it is in words or a smile and a hug. 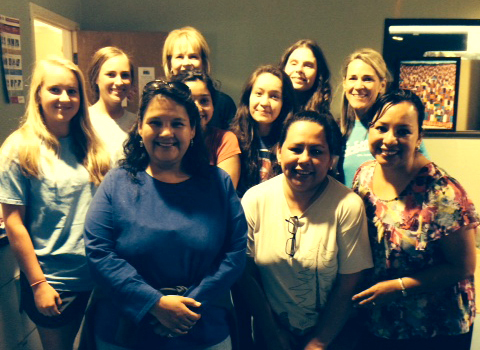 We also want to thank the staff at Seton Home/Casa de Milagros for being so welcoming, kind and accommodating to us. 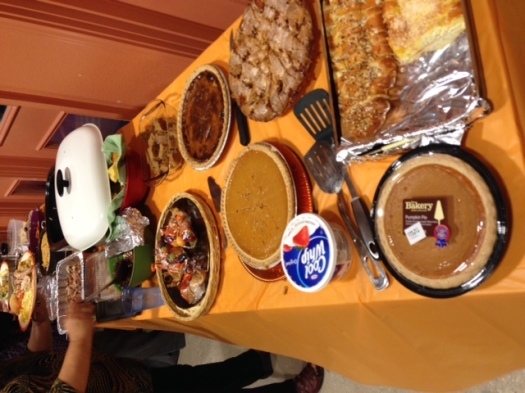 On November 10th, we gathered at Casa de Milagros (House of Miracles) at Seton Home to celebrate Thanksgiving. 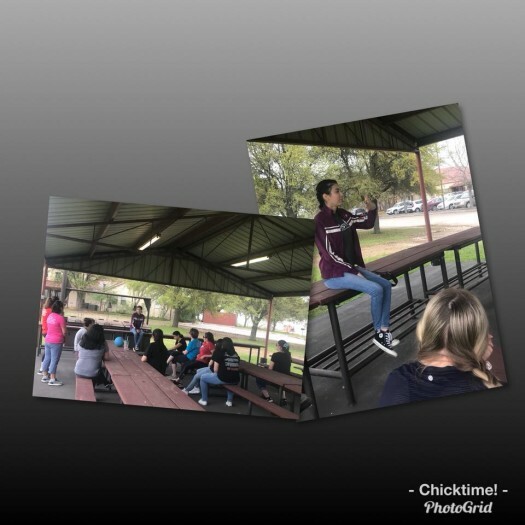 We were fortunate to have a wonderful volunteer, Patsy Delgado, who was able to give the girls a lesson on the history of Thanksgiving and American traditions. 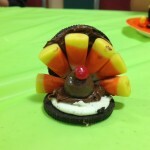 This was followed by a food craft—making turkeys out of Oreos, Candy Corn, Red Hots, and Whoppers. Check out the picture! 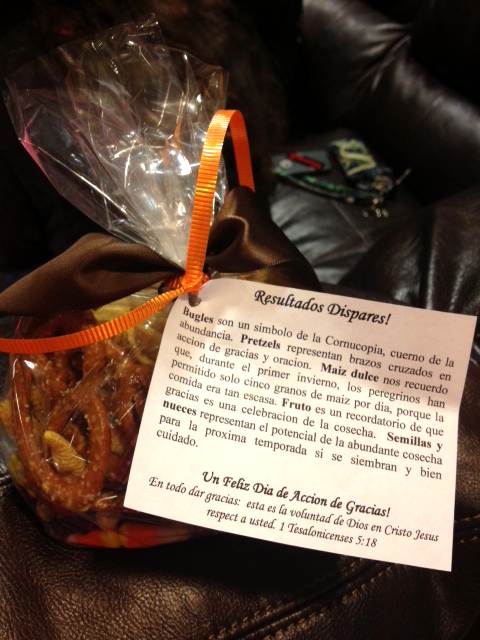 The girls all received bags of Mixed Blessings snack mix as they left– thanks to our wonderful donor, Jeanne Schaeffer. Each ingredient within the snack mix represented something special about Thanksgiving and was explained in Spanish on the tag. We want to thank all of the volunteers that showed up to help and those that made contributions. 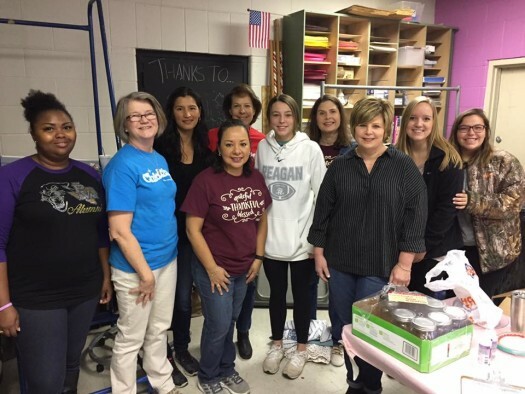 Special thanks goes out to the Johnson High School Key Club and other teens for providing babysitting services for the infants and toddlers that reside at Casa de Milagros. Please note that there will not be a December activity. However, we want to thank all of the donors that contributed money so that we could purchase special Christmas presents for the residents of Casa de Milagros. We are in need of volunteers to lead activities in 2014! Are you passionate about crafts, yoga, cooking, Zumba dancing, photography, or playing an instrument? 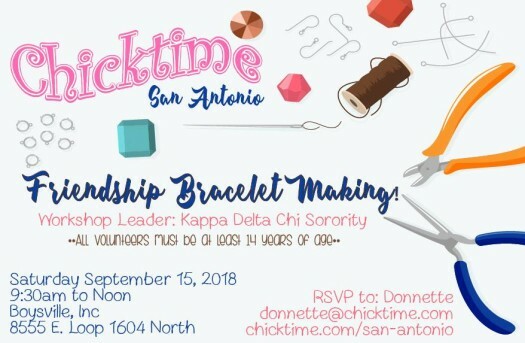 Chicktime needs you! Think of the difference you can make in the lives of young girls. We promise you will gain more from the experience than you give. Please contact our volunteer coordinator, Donnette Tyler, at donnette.tyler@gmail.com if you are interested in leading or if you have questions about the requirements. Please join us next month as we decorate cakes! It promises to be a fun morning as well!! 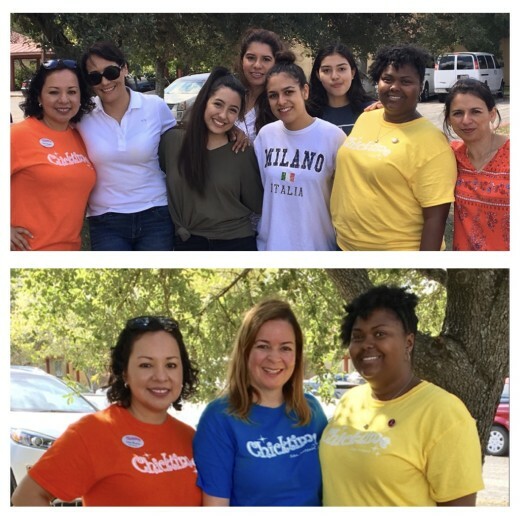 Chicktime San Antonio had a glorious time serving this month at Casa De Milagros, a shelter for teen moms. 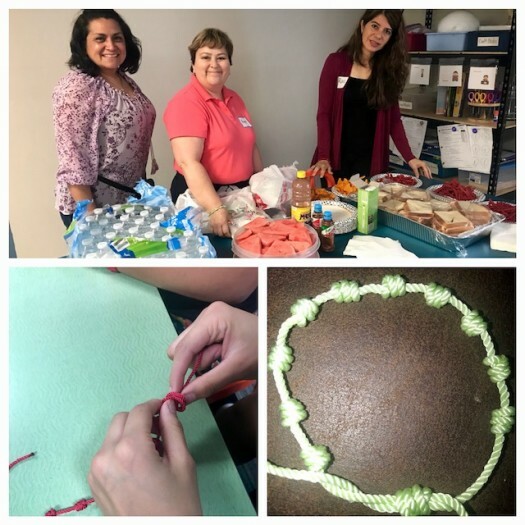 Thanks to our monthly leader, Susan Camilleri, who came stocked with beautiful beads and materials for the girls to make as many bracelets as they had time to make during our short time with them. The hands on activity allowed our volunteers to sit with the girls and encourage and love them unconditionally. 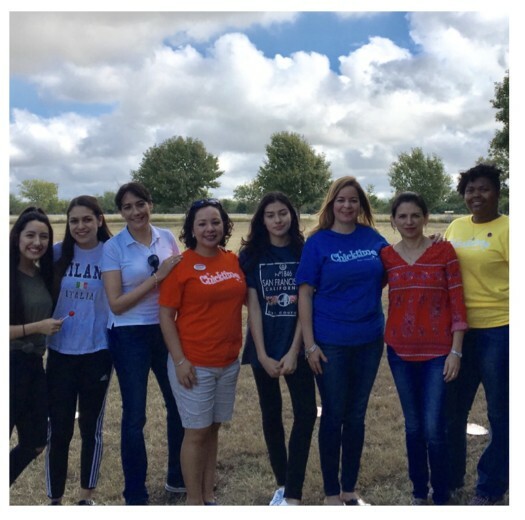 The weather was spectacular so teen Chicktime volunteers were able to take the children out for buggy rides and walks around the campus. The girls had homemade cookies to complete their time with us! 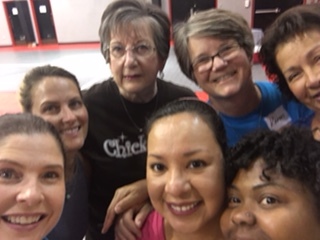 As always, we praise God for the Chicktime ministry and the many women who support it! Thank you, Jesus, for giving me a chance to do great things for YOUR kingdom. 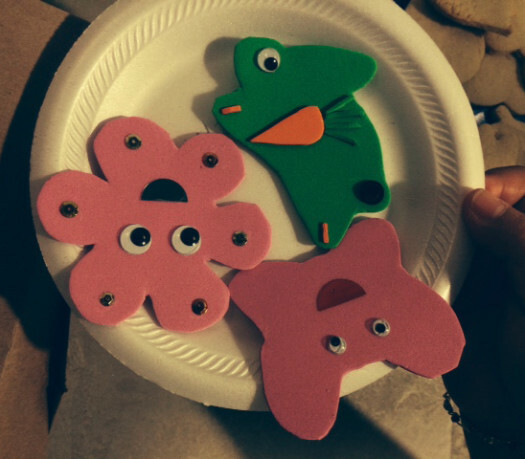 In July we will be doing some fun crafts at Seton Home on July 20th. This event will be hosted by Michelle Kelly. More details to follow. Set up will be at 10:15am and the activity will begin at 11am. Due to scheduling conflicts and some organizational changes at St. PJ’s, our June event was canceled. Our next event will be held at Seton Home on July 20th. Keep an eye out for our invitation that will be sent out soon. Michelle Kelly will be our leader and she has some really fun craft activities planned. We hope you can join us. 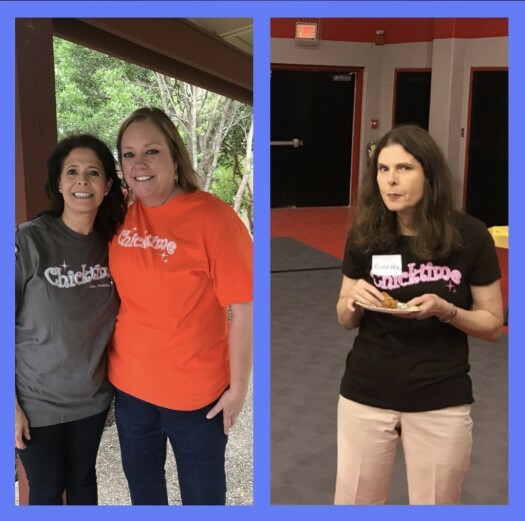 Annette Goodson had the privilege of attending the Chicktime National Conference June 7 – 8 at the beautiful Purple Sage Ranch Conference and Retreat Center in Bandera. It was an amazing experience as she had the opportunity to network and share ideas with inspiring chapter leaders from around the country. One of the highlights of the conference was getting to listen to guest speaker, Kelly Swanson. Kelly is an award-winning storyteller, comedian, motivational speaker, and author of “Who Hijacked My Fairy Tale?” We encourage you to visit her website at www.kellyswanson.net or pick up a copy of her book for inspiration and a good laugh. We wish you a fun and safe summer and hope to see you at our next event! 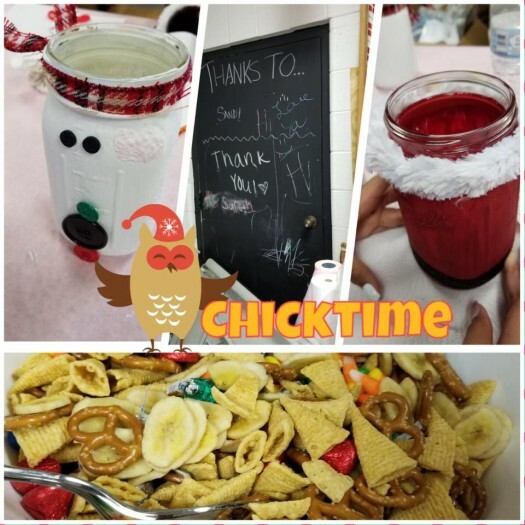 Chicktime San Antonio took crafts to a whole other level thanks to our awesome monthly leader, Shannan Pfeifer! 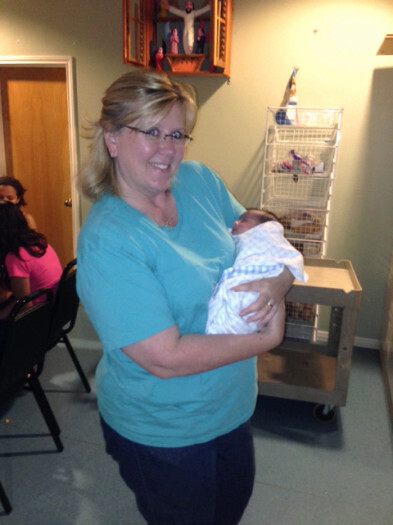 On May 18th we spent a wonderful afternoon with the teen moms at Seton Home. Four crafts stations were set up for the girls to rotate through at their own pace. 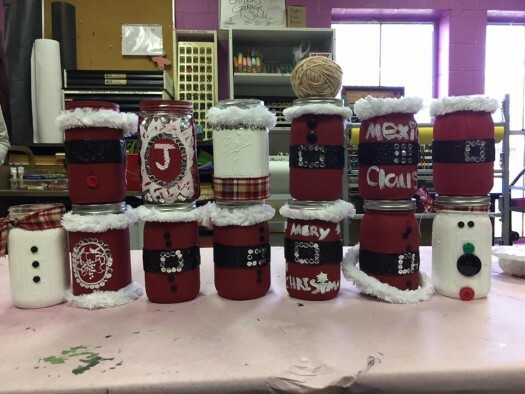 From creating personal bulletin boards with fabric to decorating cards, glass jars and clothes pins to hang art work or pictures from, the girls had many choices and were excited to have the opportunity to spruce up their rooms with homemade crafts. Our time at Seton Home was also incredibly blessed with all the volunteers who showed up to help babysit the children of the teen moms! We had newborns to rambunctious toddlers who brought joy to us as we sang, rocked, and played outdoors with them. As always, we are so grateful for those of you who continue to support this ministry! 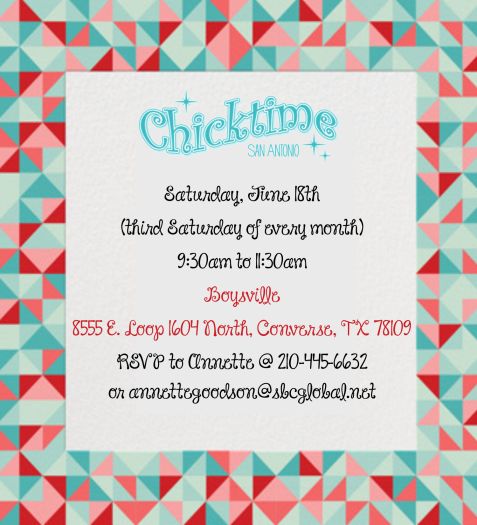 Two Chicktime Events in April! On Saturday, April 6th, our Chicktime volunteers headed to Seton Home to spend time with the teenage girls there. Seton is a home for pregnant and parenting teens. So, as you can imagine, these girls have stresses that few of us can imagine. Getting a couple of hours to have fun and take their minds off of their everyday worries is a luxury to them. We had a great time playing Bunco. Some of the girls were not real enthusiastic in the beginning. After they picked up on the rules and started to feel more comfortable with us, they really started to warm up. Some told us all about the graduation pictures they had taken earlier that morning or about their plans for the weekend. And, they proudly showed us pictures of their little ones. In the end, it felt like we made new friends. And, the girls liked playing Bunco so much that they asked if they could keep some dice to play again later! Many of our volunteers spent time rocking babies and playing with the toddlers on the playground. Some of us have forgotten how much energy it takes to keep up with them! 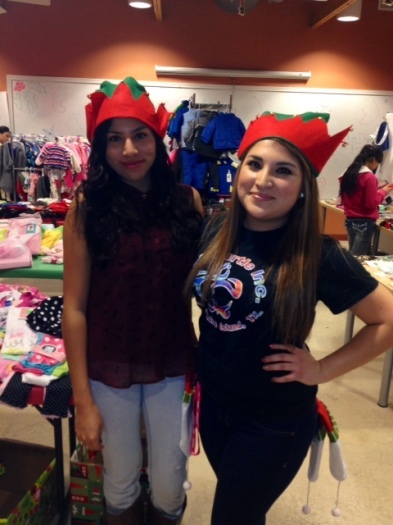 So, we are especially thankful for the teens that come out to volunteer. 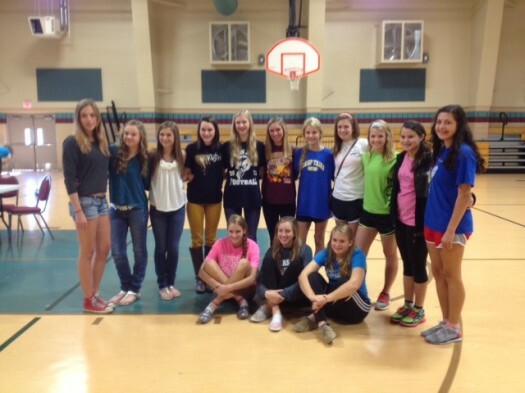 Thank you to all of the volunteers that showed up to spend time with the girls and to all those that helped babysit. We especially appreciate the first time volunteers and hope you will join us again in the future. 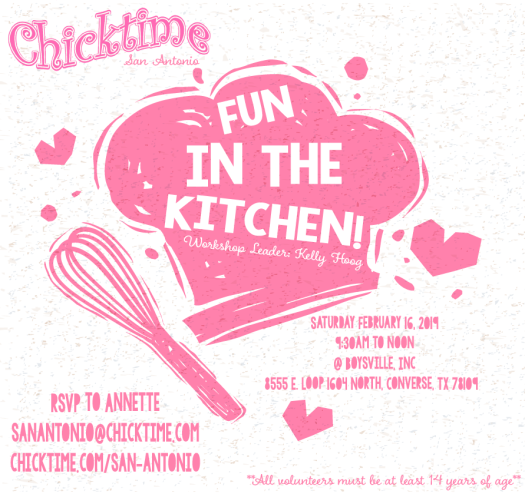 Seli Compton out did herself yet another year in hosting Chicktime Fiesta! 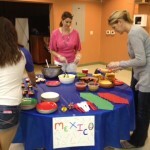 Organizing food booths, crafts and games for the teen girls at St. PJ’s to enjoy and experience a San Antonio tradition! Sadly, a last-minute campus emergency prohibited the girls from attending the event. 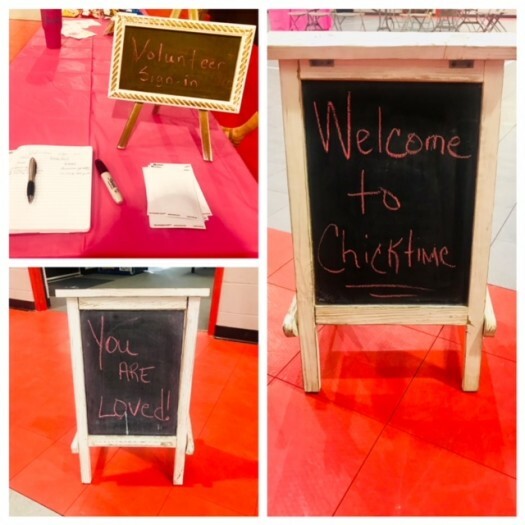 With lots of food already prepared, Chicktime volunteers joined together in fellowship as we prayed for the girls who missed out on this awesome party. 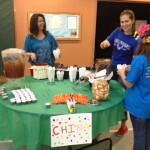 Special thanks goes to the following volunteers who prepared food booths from around the world (and Texas)! We also want to thank Michelle Kelly for sharing her talent for crafting and Sharkey’s Salon for donations to craft tables! Your light must shine before people, so that they will see the good things you do and praise your Father in heaven. Due to conflicts with Spring Break, our March activity at Seton Home was pushed back a couple of weeks. It will be held on Saturday, April 6th. We will be playing bunco with the girls. Setup will be at 10:30 and we’ll start playing at 11:00. If you live on the north side of town and would like to carpool or caravan with us, meet at the Taco Cabana on Hwy 281 between Thousand Oaks and Brook Hollow at 9:45. We hope you can join us! RSVP to annettegoodson@sbcglobal.net if you plan to attend. On Friday, April 26th, we will be holding our annual Fiesta event for the girls at St. PJ’s. We will have foods from around the world, games and music. This will be at Bulverde United Methodist Church. Setup will be at 5:45 PM and we will start the party at 6:30. Seli Compton is coordinating this event. If you would like to bring food for this event, please contact Seli at 210-687-2681 or scompton@alamoassetadvisors.com. We are particularly in need of desserts and donations of new or gently used stuffed animals. 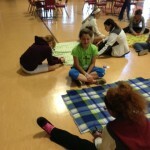 On a beautiful Saturday morning, we gathered at St. PJ’s to make fleece prayer blankets. 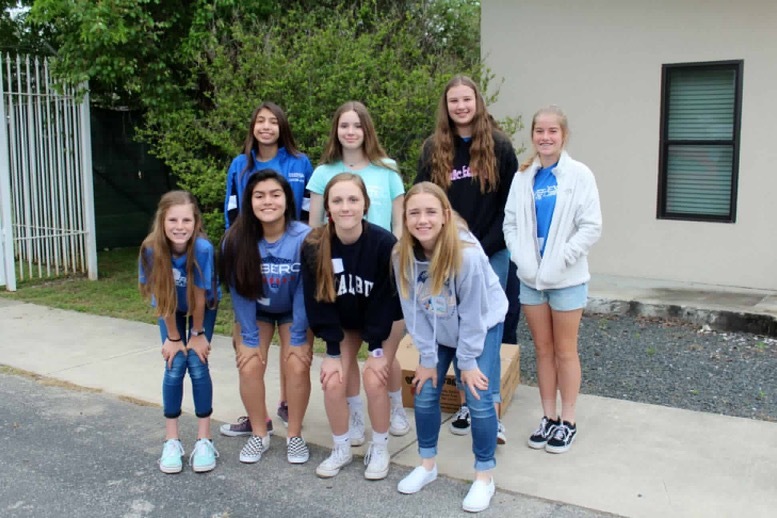 We had a large group of middle school girls from the St. Padre Pio Catholic Education Program show up to volunteer as part of a nation-wide Youth Serve program. 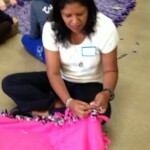 Each volunteer teamed up with a girl from St. PJ’s to cut and tie the fringe on the blankets. All of the girls enjoyed learning a new craft. They attached a prayer card to each completed blanket reading, “This fleece blanket is one I made with love. Each knot is tied with blessings and prayers to God above.” Then, they signed their names on the cards. The prayer blankets were made for nursing home residents. After leaving St. PJ’s, the girls from St. Padre Pio stopped by Padua Place, a home for retired priests, and delivered some blankets. 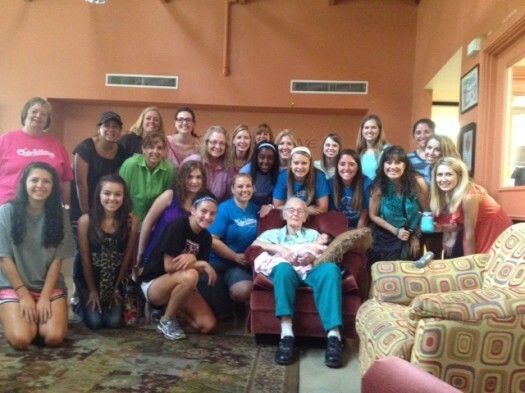 The residents were all smiles and some blessed the girls. We were particularly happy to visit with now-retired Archbishop Patrick Flores. It filled our hearts to be a part of this amazing day of love and kinship. We want to thank St. Padre Pio Chatholic Church for sponsoring the supplies and providing volunteers for this event and to Diana Flores & Micky Flores for bringing breakfast. Keep an eye on the website calendar for upcoming events. We will also be emailing you invitations. Also, we are still in need of leaders for a few months. Contact Donnette Tyler at donnette.tyler@gmail.com if you are interested in leading. I will proclaim your greatness my God and king; I will thank you forever and ever. 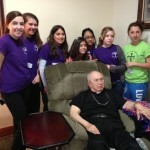 On January 19th, we held our first ever activity at Seton Home. What an amazing place Seton Home is to provide a caring and nurturing environment for homeless pregnant and/or parenting teens and their children! We had an enjoyable morning getting to know the girls and the staff. 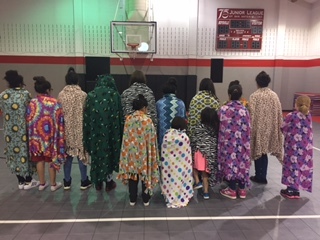 We had a fabulous group of volunteers show up to work with the girls to help them make no-sew fleece blankets for themselves or their babies. Some of the girls were a little quiet and shy, while others loved to talk all about what was going on in their life. 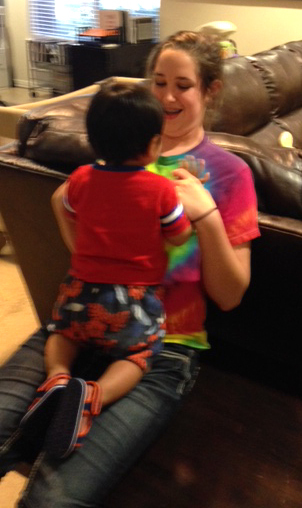 And, we had a great time rocking babies and playing with the adorable toddlers! We left Seton Home feeling both exhausted and happy. We want to thank the ladies ACTS group from St. Padre Pio Catholic Church for sponsoring this event. We appreciate all of those that showed up to volunteer and all the people that contributed money or fleece for the project. We hope you can join us on February 16th when we’re back at St. PJ’s. We will be making fleece blankets again, but this time it will be lap blankets to donate to nursing homes. This will be a Youth Serve event sponsored by the middle school girls Catholic Education Program at St. Padre Pio Church. Diana Flores will be sponsoring the snack—yummy muffins, doughnuts, and fruit. 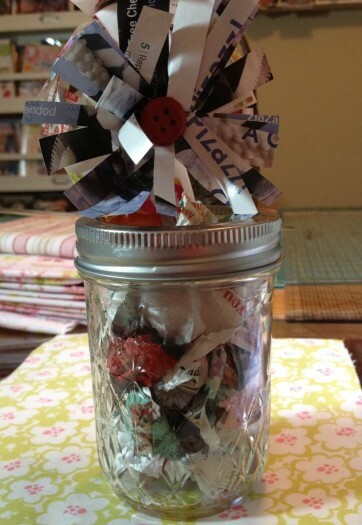 The girls at St. PJ’s love crafts, so this should be a really fun activity. Finally, we need your help filling our activity calendar for the year. We still have 7 months without leaders and one is coming up in March. So, please prayerfully consider leading a month. If you need ideas on activities, just let us know. Remember that it doesn’t have to be anything too complicated or costly. The main point is to spend time with the girls and let them know that they’re loved. We wish you a joyful February! We held our annual Christmas party on Saturday, December 15th. There was excitement and anticipation in the air as the girls from St. PJ’s stepped off the bus at Incredible Pizza. After eating the pizza buffet, they were treated to 2 hours of video games and attractions. They were full of energy as they bounced from game to game having the time of their lives. 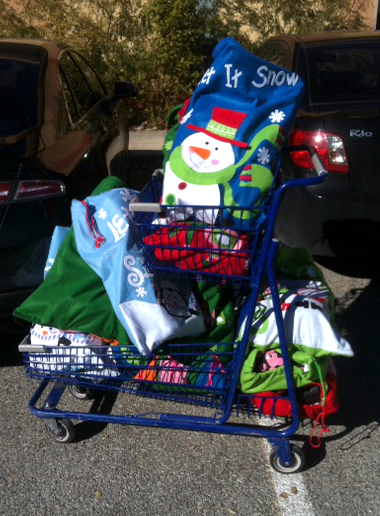 Before sending them back to St. PJ’s, each received a Chicktime t-shirt and a stocking full of treats including a Chicktime tumbler, socks, lotions, candy and other goodies. They were all so thankful and full of hugs. We enjoyed the time we got to spend with them and find out all about everything that’s happening in their lives and the plans they have for the holidays. We are so thankful to the women that made monetary contributions to help sponsor this party. We also thank our very special volunteers that donated the stocking full of treats for the girls and took the time to put them together. 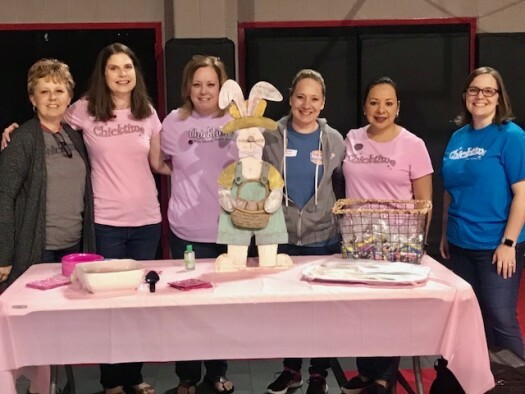 Our hearts are full of joy knowing there are so many ladies out there that are touched by this ministry enough to share their time, talent, and treasure to help make Chicktime San Antonio the organization that it is today. We are eternally grateful for your support. Our first event at Seton Home will take place on Saturday, January 19th. We will meet there at 10:30 and will begin our activity at 11:00. This event is sponsored by the St. Padro Pio Ladies ACTS group. We will be making fleece blankets. 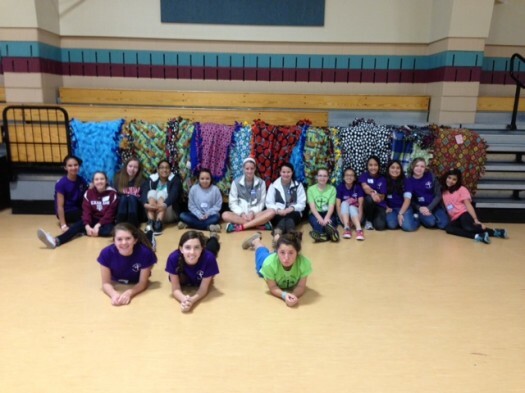 We could really use your help with donations of fleece as we will have approximately 30 girls participating. For each blanket, we need 2 coordinating 2-yard pieces of fleece. This is frequently on sale at JoAnn Fabrics and Hobby Lobby. If you are able to donate, please contact Annette at annettegoodson@sbcglobal.net. In addition to helping with the craft that day, we will need volunteers to help with the babies and toddlers so that the girls can have a break and participate in this fun activity. You will receive more details in early January when we send out the invitation for this event. We thank you for your love, time, support, and prayers and wish you a Merry Christmas and a Happy New Year! 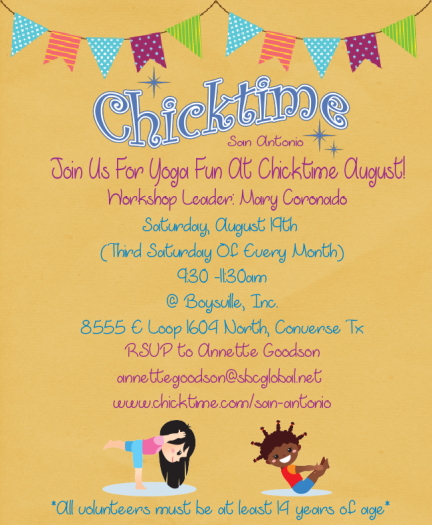 Exciting Things Happening With Chicktime San Antonio! Chicktime San Antonio is happy to announce that starting in 2013 we will be partnering with Seton Home! After hearing about the great work we do at St. PJ’s, the volunteer coordinator from Seton approached us and asked if we might be able to come in on a regular basis to provide some fun activities for their residents. 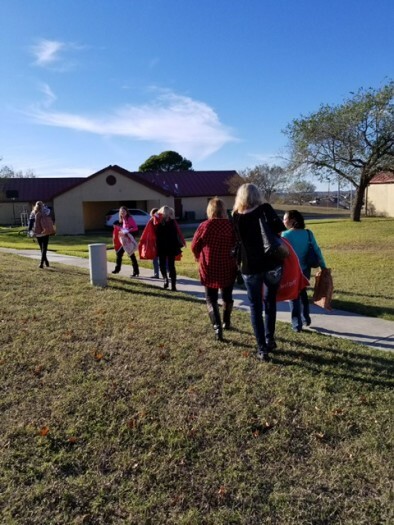 After touring the facility and learning about the services they provide, we prayed about whether it was the right direction for our organization. 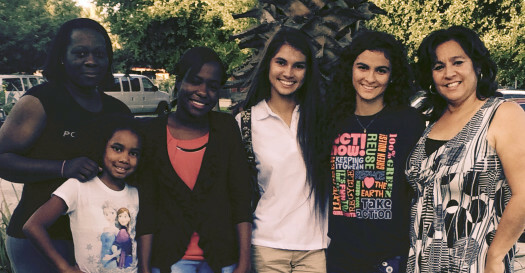 We believe that God was leading us to these teens in need and we had to say YES! 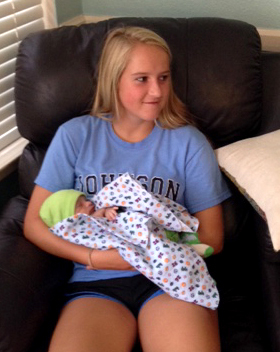 Seton Home provides a nurturing home to homeless pregnant and parenting teens who decide to keep and care for their babies. They work to break the cycle of abuse and poverty by providing a caring home, education, and support services necessary to transform the lives of teen mothers and their children. They have a beautiful campus right next to St. PJ’s at 1115 Mission Road. For more information about Seton Home, visit their website at www.setonhomesa.org. While we get things up and running at Seton Home, we have come to an agreement with them and St. PJ’s that we will alternate activities between the two facilities. If anyone is interested in joining our leadership team to assist us with this, please let us know. We are so excited to begin our first activity with them in January. These girls truly need our love and attention. We will be working with 30 – 40 girls from ages 12 – 19. Join us January 19th for our first activity at Seton Home which will be sponsored by the St. Padre Pio Ladies ACTS group. We will be making fleece blankets. 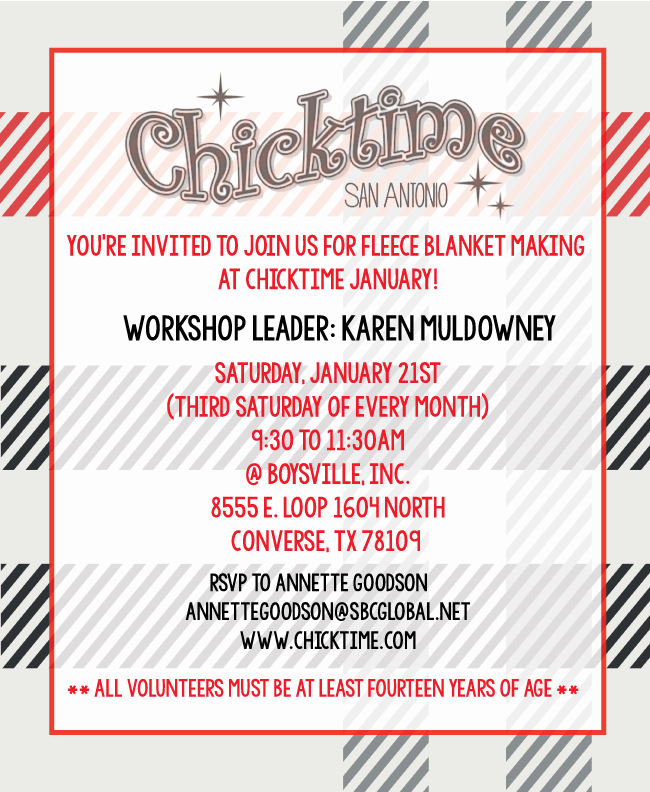 If you would like to donate fleece for this project, please send an email to annettegoodson@sbcglobal.net. We will provide more details at a later date. November Event – Games & Turkeys! 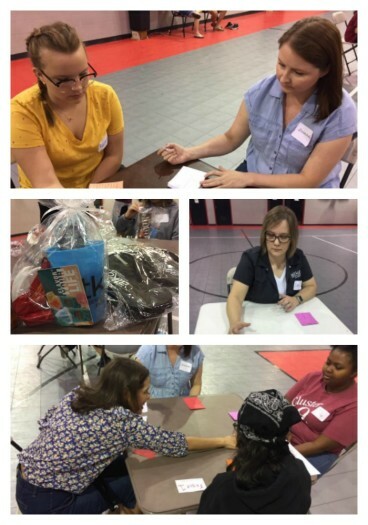 Chicktime San Antonio is so thankful for the gifts and talents of all our volunteers and their desire to share them with the teen girls at St. Pj’s! 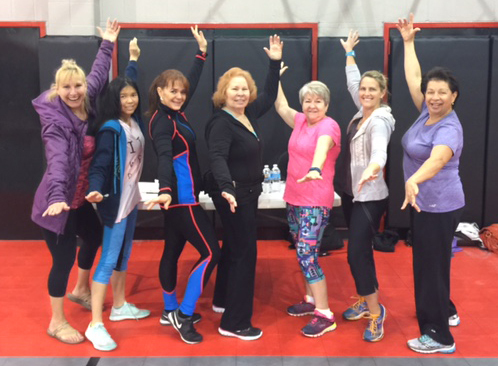 November Chicktime was no different and was such a blessing thanks to the wonderful team of Jeanne Schaefer and Patti Rittiman! These ladies and their daughters, Kylie and Emily, set the tone for the morning with the girls with an upbeat and updated version of “hot potato”! The last one standing of course won a prize out of the prize bucket that was filled with things like candy, fuzzy Christmas socks, and teen magazines! The St. PJ’s girls, mixed with the youth chicks, were divided into two groups to play CRL (Center/Right/Left). 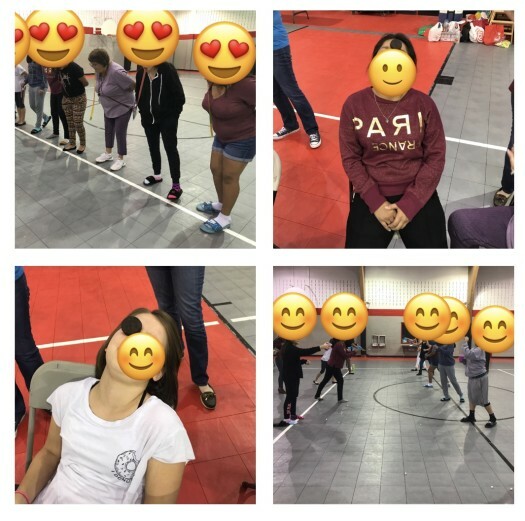 This dice game made the girls chant, laugh, get serious, and laugh again until we had a winner from each group who also got to pick a prize from the prize bucket! 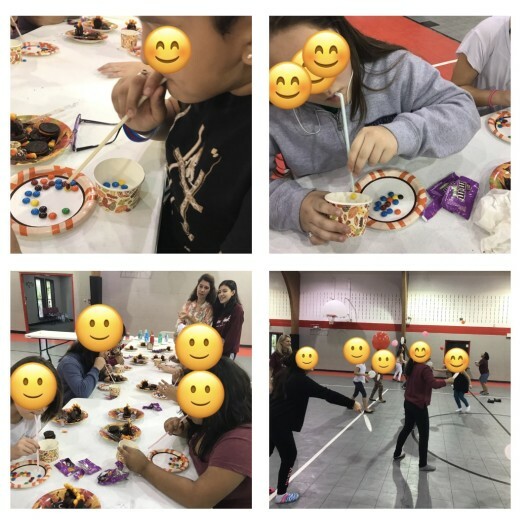 If that wasn’t enough, our monthly leaders had yet another activity for the girls to help get them in the mood for Thanksgiving! 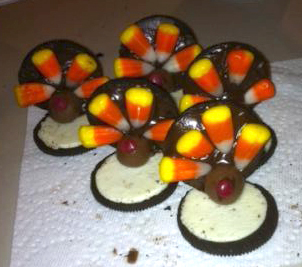 The girls made eatable turkeys out of Oreo cookies, frosting and candy corn! 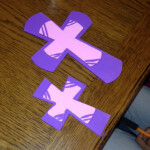 It’s simple things like this craft that seem to bring the girls so much joy! We ended our beautiful morning together by sharing a snack and visiting before we circled up and prayed hand in hand. 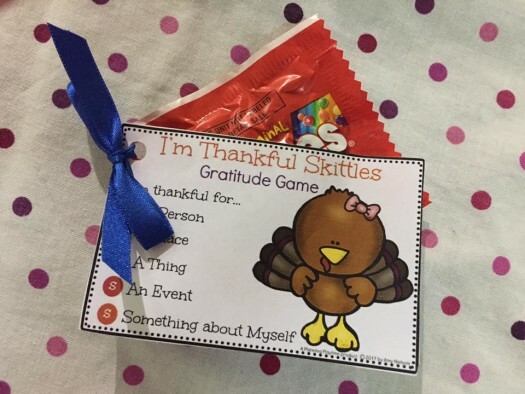 The girls were each given a gift of a homemade and specially wrapped “thanksgiving trail mix” with a tag on it that identified the things in the bag with a reminder of why we should count our blessings at Thanksgiving. December Chicktime will be held on December 15th at Incredible Pizza. Thanks to the generous hearts of our volunteers we have enough money to treat the girls to pizza, games, rides and gifts!! Please join us if you can! We will arrive about 10:15 am and stay until 12:45. 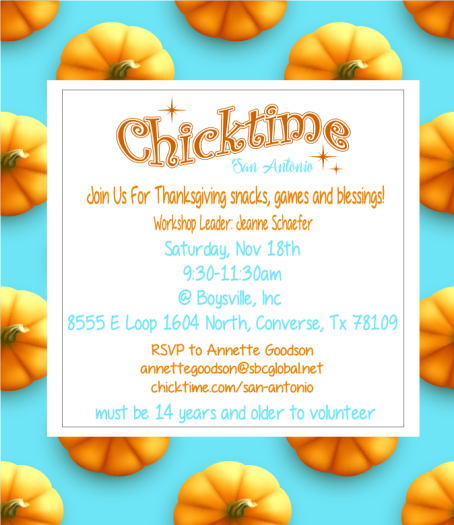 It is our desire to get our 2013 Chicktime San Antonio ministry lined up with monthly leaders in the next few weeks. At present, we have January, February, April and December leaders. We welcome repeat leaders and repeat activities! If you have been praying about leading a month please know that the girls appreciate anything and simple usually works best! We had a Halloween-themed party this month at St. PJ’s and had a great time playing bingo with the girls! They enjoyed snacking on chips and queso, fruit, and goldfish while they played and covered their cards with Hershey Kisses. 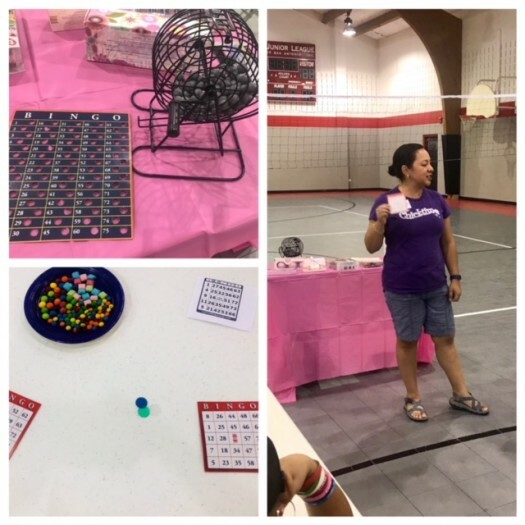 We played many different variations of bingo for some fun prizes such as bath gel, picture frames, Halloween socks, books, and jewelry. Everyone walked away with a prize. We wrapped up with Halloween cupcakes. The joy on their faces warmed our hearts and helped us to know that we were in the right place. Spending time with the girls is as much of a blessing for us as it is for them. A big “thanks” goes out to our October volunteers—Annie Lutz and Jeanie King. They did a fabulous job and everyone seemed to have a great time! We appreciate all of the volunteers who showed up and thank them for bringing bingo prizes. We even had a volunteer all the way from Sweden—Sara is an exchange student that arrived just 2 days earlier. We are always looking for volunteers to lead a monthly activity. It doesn’t have to be anything elaborate—just share a craft, hobby, game, or sport that interests you. Note: We are in need of 35 sponsors to donate $30 each to help offset the cost of the Christmas party. If you are able to provide a sponsorship, please contact Donnette at donnette.tyler@gmail.com. 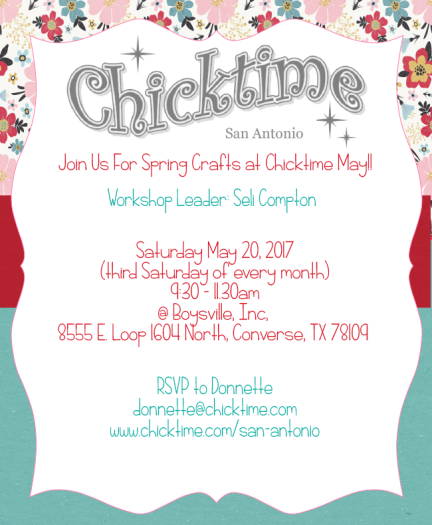 Checks should be made payable to “Chicktime San Antonio” and can be mailed to Donnette Tyler at 2727 Montebello, San Antonio, TX 78259. On Saturday, September 15th, we were blessed to spend time with our dear friends at St. PJ’s. It was a wonderful morning of crafts, laughter, and conversation. 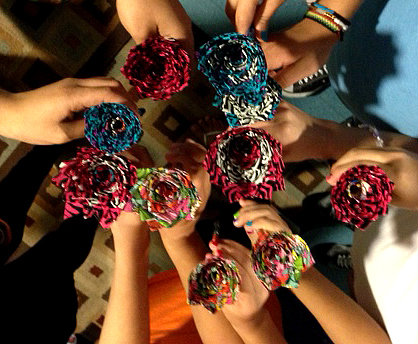 We made duct tape flower pens and friendship bracelets. The girls LOVE crafts! As they worked, the girls shared their experiences from the first few weeks of school—classes they like and don’t like, hard tests, friends they’ve made, and extracurricular activities they are involved with. They were also looking forward to a day at Schlitterbahn on Sunday. We finished with snacks brought by our fabulous volunteers. Everyone seemed to have a great time. 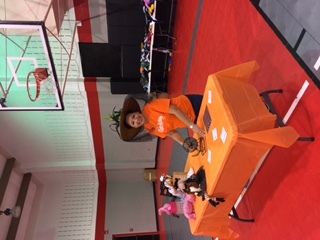 Thank you to our volunteers that led the crafts—Sandy Brunner, Kristen Brunner, and Tori Tyler. Mark your calendars for next month’s event on October 20th hosted by Annie Lutz and Jeannie King. Also, it’s almost holiday time and Chicktime cookbooks make great gifts! We still have some cookbooks for sale. They are $20. If you are interested in purchasing one, contact Annette at annettegoodson@sbcglobal.net. my mind was as the afternoon was coming to a close you really couldn’t tell who was lived at St. PJ’s and who was a teen volunteer because they were all doing each other’s nails!! Sitting around tables laughing and talking and painting nails, my heart was overwhelmed to see all of these girls share this afternoon together. What a spectacular day we had loving these girls!! 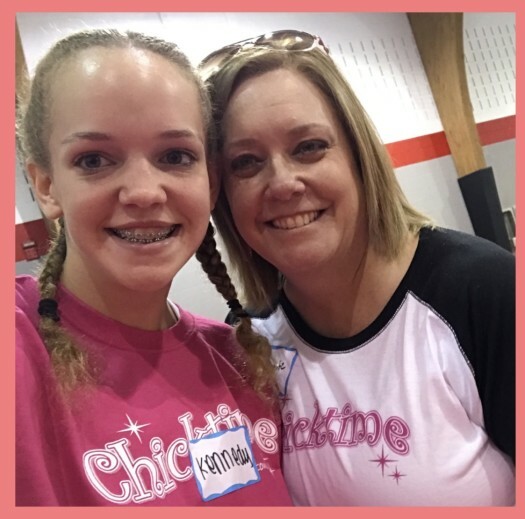 Thanks for the opportunity to be a part of Chicktime! We are still trying to find leaders for August and September as the volunteers originally signed up to lead had to back out due to personal reasons. We can be flexible with August since the girls are not in school and can do it almost any time and day! Please pray about it. The Holy Spirit is always present so have no fear!! All the girls really want is for us to just be with them! Saturday June 9th, Chicktime volunteered at the Annual Picnic for Lutheran Social Services. 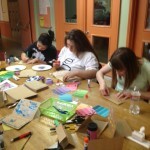 We worked a craft table, making paper butterflies, foam photo frames, and Duct tape wallets and flower pens. Though it was a small group, those who did the crafts enjoyed it. Everyone especially found the duct tape wallets to be cool, including the other volunteers! The event was in benefit of foster families, and several awards were presented during the picnic. Everyone had a great time. 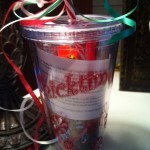 Thank you to Lisa and Hayley Drozdick for sponsoring this event and for coming up with the creative craft activities! We were rolling for sixes on June 15th at St. PJ’s as we taught the girls how to play bunco. They seemed to really enjoy learning how to play this fun and easy dice game. We all had a great time playing, talking, laughing, and getting to know each other. The girls were really relaxed now that school is out and they have a little more free time. We enjoyed hearing about some of the summer camps they had attended and about the dance they were having at St. PJ’s that evening. 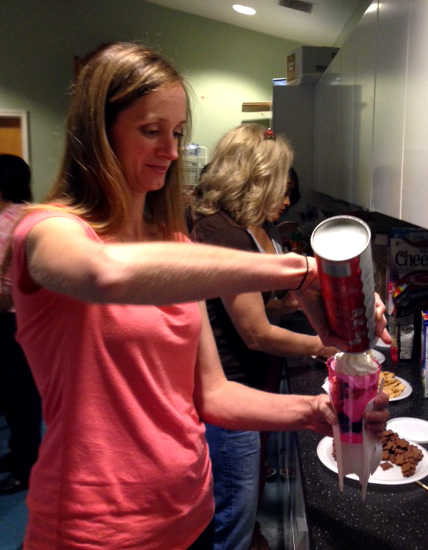 We capped off the afternoon with ice cream sundaes—yumm! 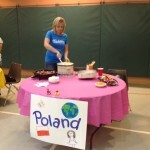 Some of the girls were really sweet and made sundaes for the volunteers. It was an awesome afternoon! Thanks go out to all the ladies at ATKG, LLP for sponsoring this event. Join us on July 21st for some pampering when we have a spa day at St. PJ’s sponsored by Tracy Holzman. God’s plan is to make known his secret to his people, this rich and glorious secret which he has for all peoples. And the secret is that Christ is in you, which means that you will share in the glory of God. What a wonderful morning we had with the girls at St. PJ’s on Saturday, May 19th. 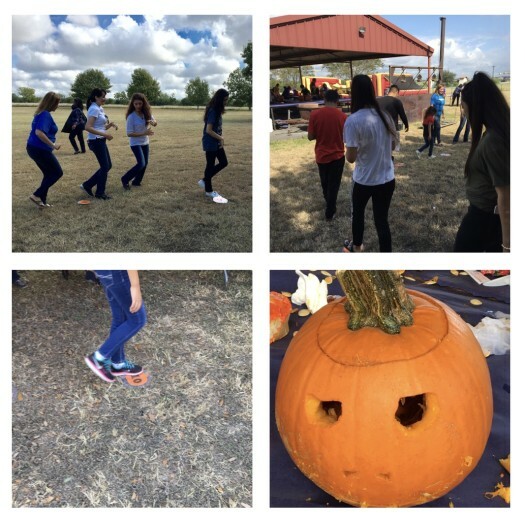 The activities were sponsored by a group of teen girls from St. Thomas Episcopal Church and guided by their adult mentors, Christi Atkins and Mirta Vazquez. God had to have been smiling down on all of them! The girls started by leading some icebreaker games so everyone could get comfortable with their new friends. They then divided into teams for a game of Human Clue with a Disney theme. 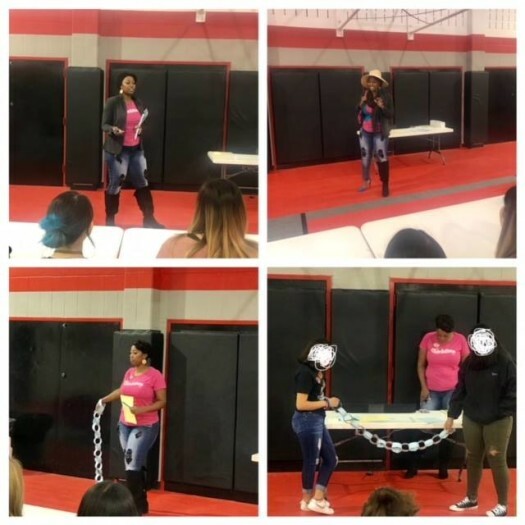 The teens from St. Thomas dressed up as Disney Characters and led different activities while the various teams traveled around to different stations to try to be the first one to find all the answers to the clues. This was great fun! The games were followed by a bible lesson on “gentleness” that was prepared by one of the teens. We all learned about the importance of treating others with gentleness as well as ourselves and that gentleness does not mean weakness. It was beautiful to see that one of the girls from St. PJ’s was so enthusiastic about the lesson that she asked if she could do some of the reading. The teens from St. Thomas Episcopal are definitely filled with the Holy Spirit and shared their faith so enthusiastically with their new friends. The teens brought snacks to share that are traditional fare for all of their get-togethers: popcorn, jelly beans, and M&M’s. We also had cookies and snack mix. A big “Thank You” to all of the volunteers that showed up this month to make this a special morning. You may never know the impact you have on these girls’ lives. But, rest assured—you are making a difference! God works in all things for the good of those who love him. Chicktime San Antonio celebrated, with the girls from St. PJ’s, NIOSA (Night in Ole San Antonio) style. 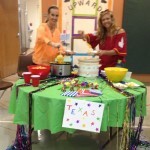 Seli and Karrissa Compton planned the second annual Fiesta activity and went all out! 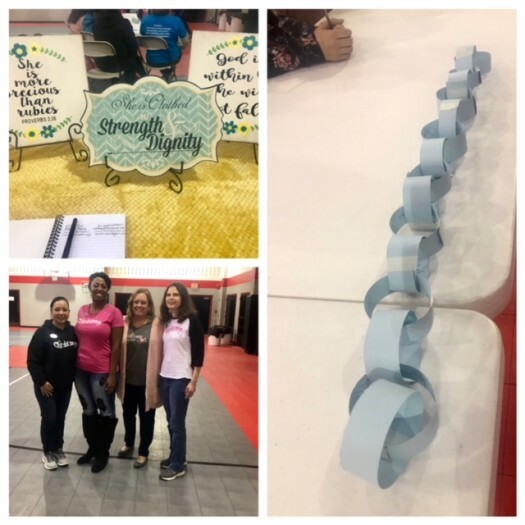 The girls got to come off campus on Friday, April 27th, to Bulverde Methodist Church and experience foods from various countries, play games, make tissue paper flowers at a craft table, and dance the night away. Many volunteers helped make this evening possible by saying YES to help Seli and Karrissa host the perfect evening. 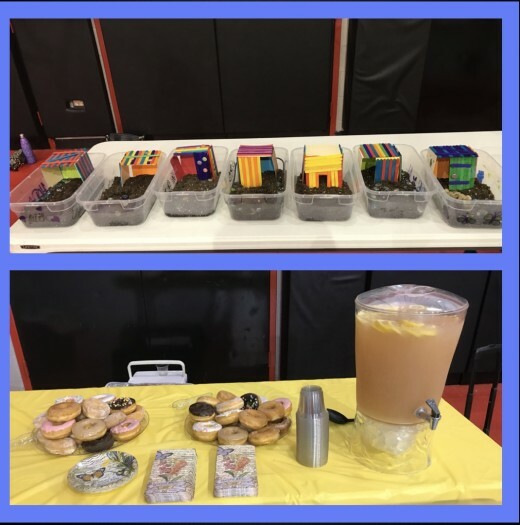 Food tables were lined up on one side of the gym and the girls went back for seconds and thirds and still saved room for desserts! DJ Don (AKA Coach Don Greenwood) and his wife, Tami Greenwood, played music throughout the evening and assisted in the cake walk. The girls played this game over and over because they won stuffed animals instead of cakes. Hundreds of stuffed animals were donated just for this game! We promise–hundreds is not an exaggeration. At the end of the night we had so many left over we sent them back with the girls in trash bags! There was also a bean bag toss and bucket throw game where the girls had opportunities to win candy bags donated by Sandy Brunner and Melissa Ling. They also were in charge of the games the whole evening! 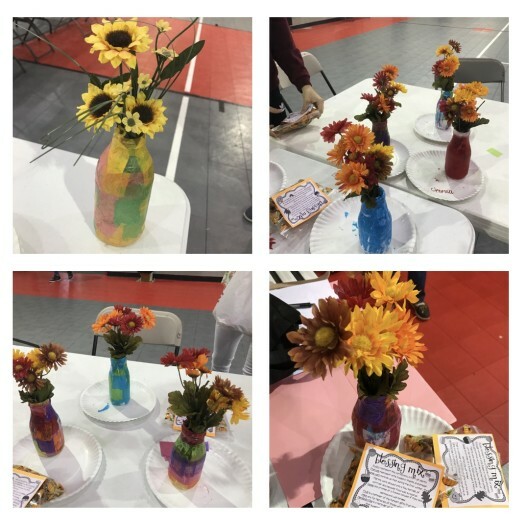 As if this wasn’t enough….a craft table was set up by Michelle and Camryn Kelly. They provided all the supplies for the girls to learn to make tissue paper fiesta flowers! The girls line danced together with the young “chicks” and laughed and were able to just have an evening free of worries and sadness. The prayer circle with all the volunteers and St. PJ girls and staff took half a gym and was breathtaking! We believe the girls saw and felt Jesus that evening. Other thanks go to our food table volunteers…. I hear the Compton’s are already planning next year’s Fiesta event! 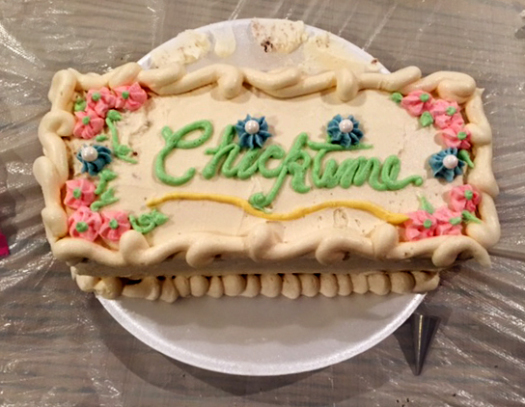 In the meantime, join the girls youth group from St. Thomas Episcopal Church as they lead Chicktime on Saturday, May 19th at 10:00 at St. PJ’s. 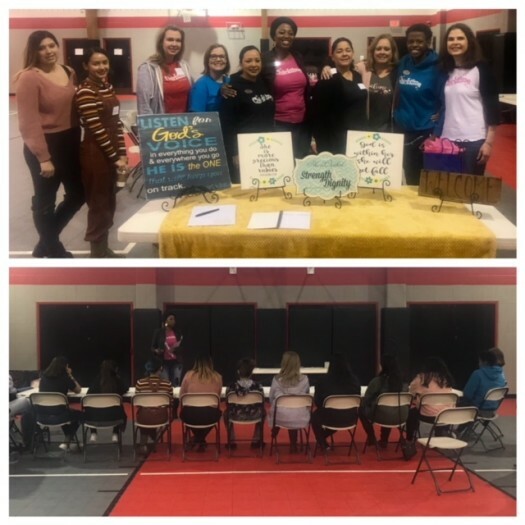 On Friday night of March 23rd, Chicktime San Antonio hung out with the girls at St. PJ’s in hopes of getting them ready for summer! As the girls arrived they were adorned with Hawaiian leis and prayed over as we began our evening together. Beach themed games were played outdoors and Hawaiian punch snow cones were served to cool the girls off before moving back inside! St. PJ’s gals, alongside our teenage Chicks, decorated flip flops. 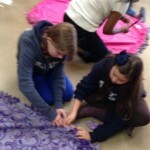 The girls got to choose the material they wanted to decorate with–balloons, fabric, or ribbon. 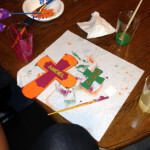 The craft time allowed the girls to not only be creative, but to laugh and share with each other throughout the evening. 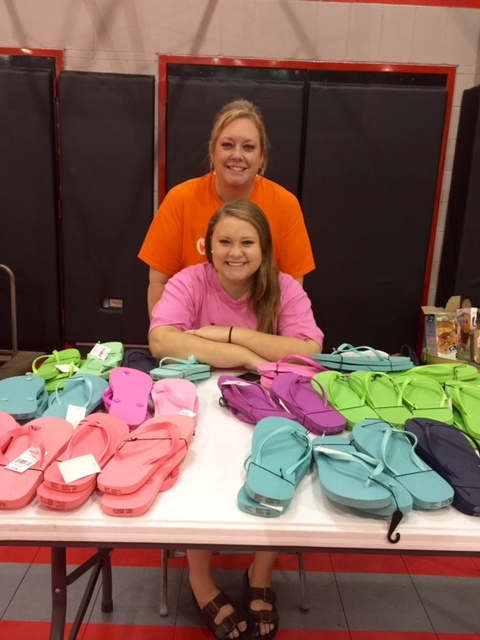 The flip flops were beautiful and snacks a big hit! 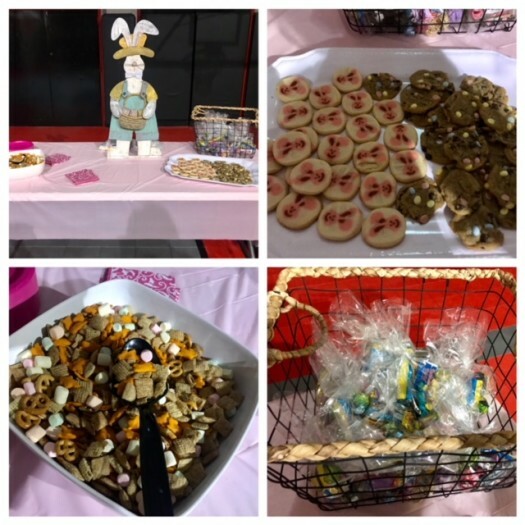 Fruit, popcorn, trail mix…..and oh the chocolate chip cookies! The girls ate every last bit we had. We hope you can join us on Friday, April 27th, for our 2nd annual Night in Ole San Antonio event! Food booths, music, games and more! Chicktime San Antonio will be bringing fiesta to St. PJ’s! Contact us if you want to help! 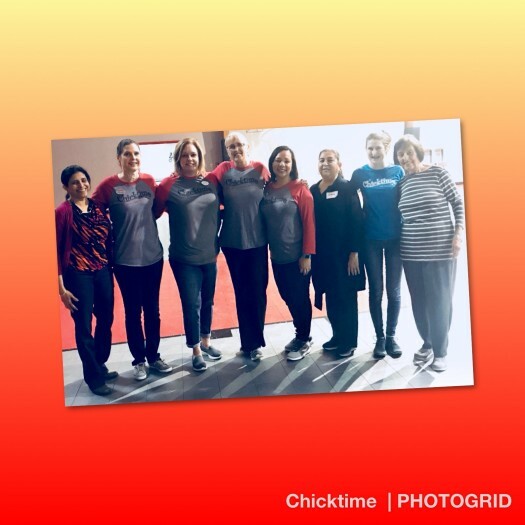 On Friday, February 17th, Chicktime San Antonio (led by Teri Villanueva and Diana Flores) treated the girls at St. PJ’s to a “TGIF Karaoke Party”. The party started off with dinner of pizza and assorted snacks. The girls wasted no time after dinner dressing up with different props and hopping into the photo booth to take some silly and cute pictures of themselves. While the photo booth was going on during the night, others selected to dance and sing the night away. We didn’t know there was so much talent with our girls – America’s Got Talent watch out! It was a joy to see the glow and confidence in their faces as they sang their favorite tunes. By the end of the night, we could not keep them off the dance floor! Thanks to Ron and Sylvia Carrillo of Loco Motion Flip Books who so generously donated their photo booth and to Lisa Diaz who offered her hip and groovy DJ and Karaoke services. Their generosity is proof that God always puts the right people in your path! 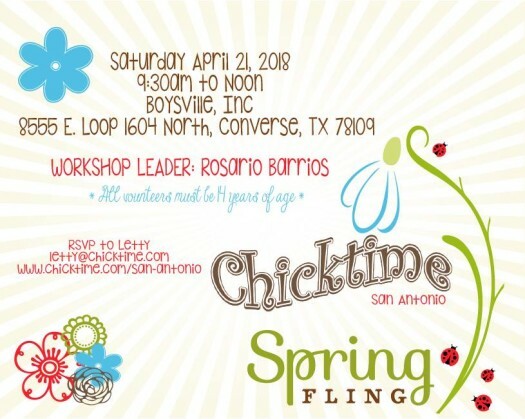 On Saturday, March 31st, Colleen Douglas will lead Chicktime San Antonio and we will decorate flip flops with the girls to get them ready for spring! 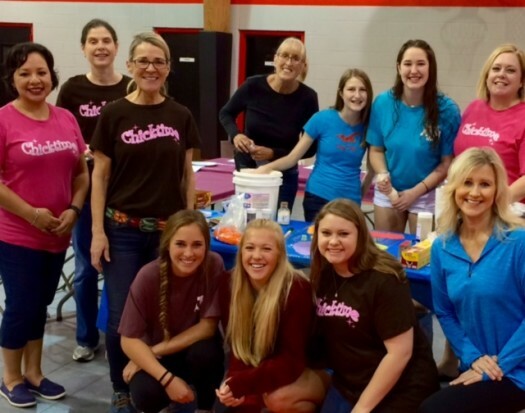 Please take a moment to read this…..
Last May, my daughter Katherine, my sister Diane and I had the privilege of leading a month of Chicktime fun. 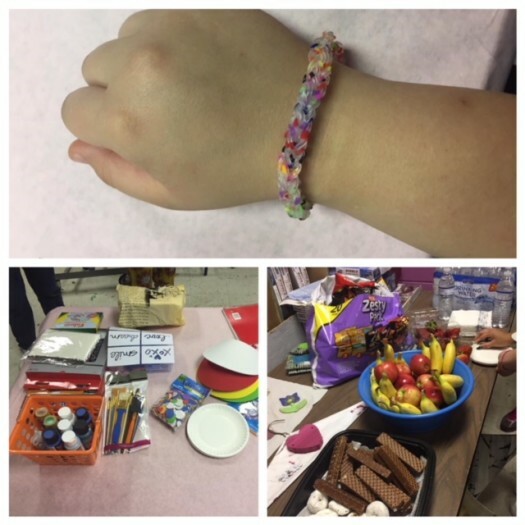 We made gorgeous bracelets, enjoyed healthy snacks and played a few games. I have to admit, I was nervous about leading a month. I was afraid I wouldn’t have enough food or enough helpers. But with encouragement from Donnette and the help of several ladies and their ‘Chicks’, we had a very successful event!! The time commitment and financial commitment was negligible. Everyone always brings something to help you out. I had a friend that makes jewelry. She had mentioned that she was getting rid of some beads that were from seasons past. And there it was, my opportunity to make bracelets!! She graciously offered to give me all the beads, wire, clasps and jewelry implements to make 50 bracelets. God never ceases to amaze me with His goodness! And thank you Jenn! The girls all enjoyed strawberry shortcake, watermelon, banana bread, veggies and more! 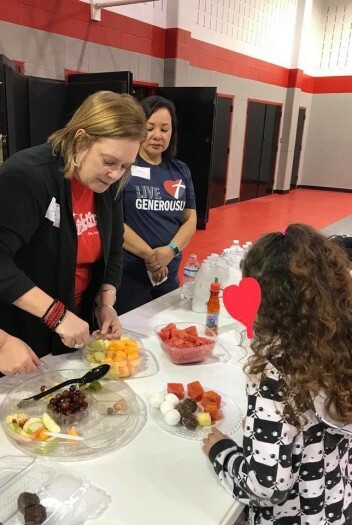 We served all kinds of fresh fruits and vegetables so the girls could experience some yummy items that they may had never tried. Donnette split the girls into 2 groups for the Starburst Game! Each color of candy had a meaning and the girls sat quietly in a circle and really shared some thoughts and fun with each other. We made a huge circle and ended in a prayer. What a blessing it was for us to experience the Holy Spirit at work with our girls and the St. PJ’s girls. And yes, we are signed up to lead another activity this March! 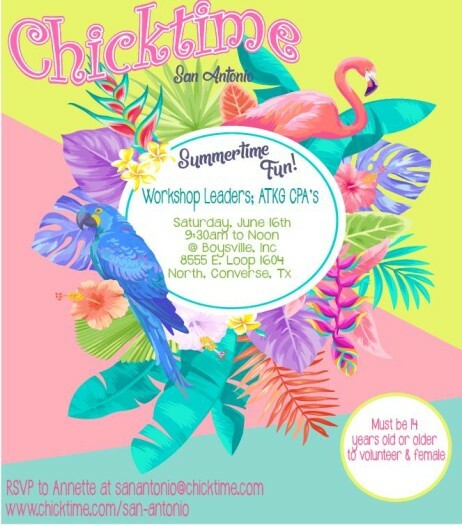 So, if you love being with vibrant young ladies and want to have some incredible fun and fellowship, PLEASE sign up to lead a month of Chicktime. I sure am glad I did and you will be too. And if I can, I will be there to lend a hand!! God bless Chicktime! Months that still need a leader are…June, August, and November! Wow! What amazing and creative leaders we had last month! 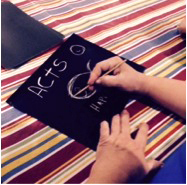 We were so blessed to have our January activity at St. PJ’s led by Monica Hernandez and Sonja Escobar. Station one consisted of cupcake decorating. What girl doesn’t love frosting and sprinkles? The girls had a ball and made extras to give as gifts to friends. Station two consisted of making and decorating journals with colored paper, markers, and lots of jewels. After all, you gotta have bling! Station three was all about decorating snack containers. They used markers, stickers, jewels and lots of creativity. Afterwards, they filled their containers with a variety of snacks to take back to their dorm. The room was full of smiles and it was so fulfilling for all of the volunteers that showed up to give these girls some love and much-needed attention. Thanks again Monica & Sonja! 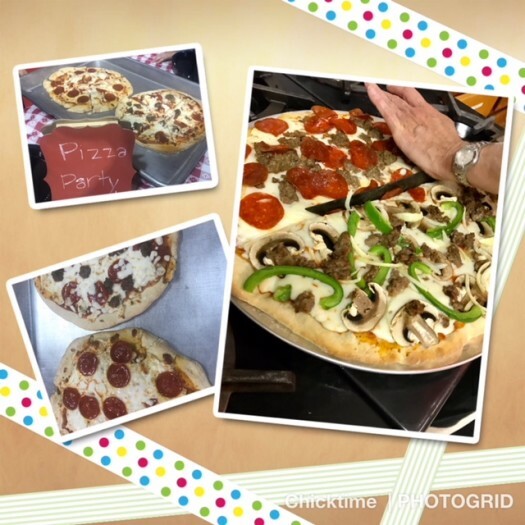 generous “chicks”, the girls from St. PJ’s were treated to an all-you-can-eat pizza and salad bar and were given unlimited access game cards to use during our party time. 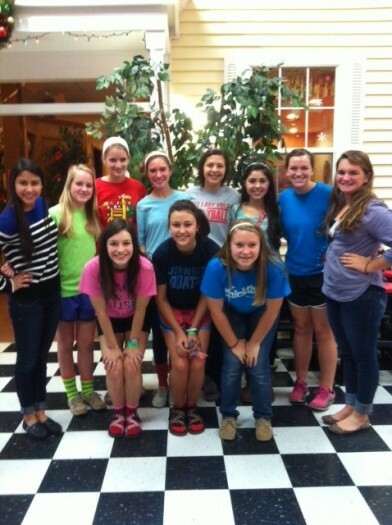 The girls rode bumper cars, drove go-karts, bowled, played putt-putt, played video games, and watched 4-D movies. They giggled, they danced, they ate a lot of ice cream and cinnamon rolls, and begged to stay longer! To end the party, we gathered in the party room to pray and hand out gift sacks filled with lotion, shower gel, chapstick, and deodorant. And, let’s not forget about the $25 gift cards to Target. Did I mention all gifts were donated, too? What a blessing it was to be there that day to hear the girls talking about how grateful they were to Chicktime and how that day was one of the best days of their life! Our next event is coming up on January 21st. It will be hosted by Monica Hernandez and Sonia Escobar. Mark your calendars. This is sure to be a fun activity. We are so humbled by the many who continue to support this ministry and look forward to a wonderful New Year. We pray you will make it a point to join us as we continue our journey at St. PJ’s. Beads, crafts, and cupcakes… a perfect Saturday! Our November event at St. PJ’s got us in the spirit for the holiday season. We were blessed by some very creative leaders this month—Hannah Hedgpeth, Gena Powell, Leah Dabaghian, & Jennifer Junco. After starting with a prayer and a fun ice-breaker to get to know each other, everyone got the opportunity to visit 3 craft stations to make gifts for friends and family. They made beautiful beaded crosses, exquisite embossed bookmarks, and delicious decorated cupcakes. The girls were beaming with pride at their creations. We all had a fabulous time learning new things. We were so blessed to have these wonderful ladies sharing their talents with us. We are still in need of a few volunteers to host 2012 events. If you are interested, please contact one of us. He made us all smile!